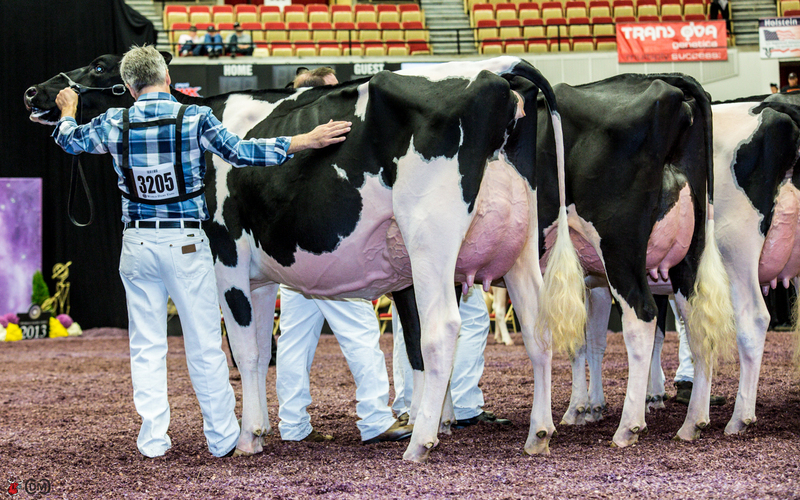 They called it “The Center of the Dairy Universe” and for this past week Madison Wisconsin was just that. 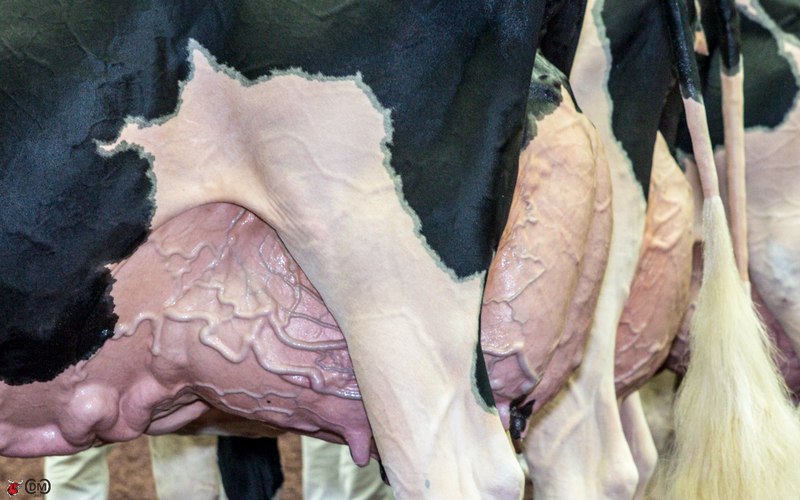 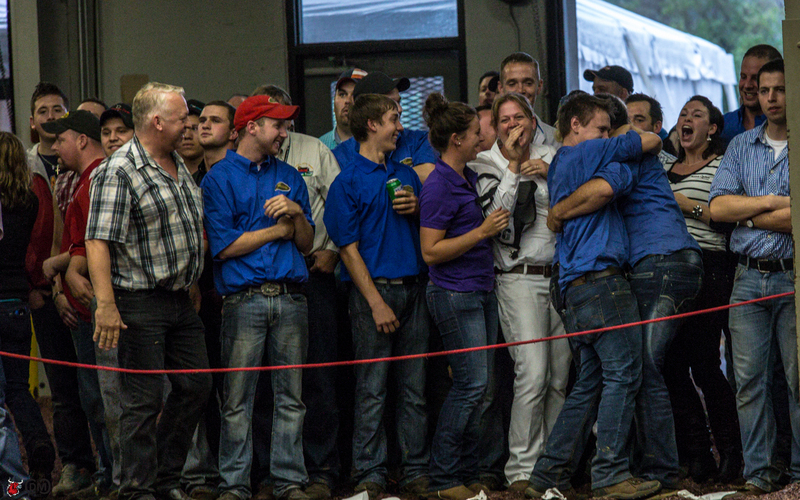 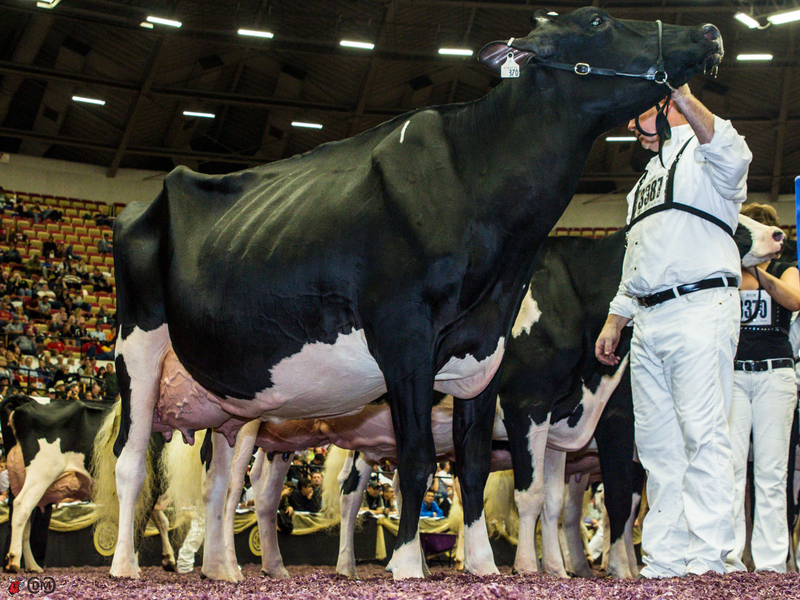 The largest Dairy Show in the World put on a show that did not disappoint. 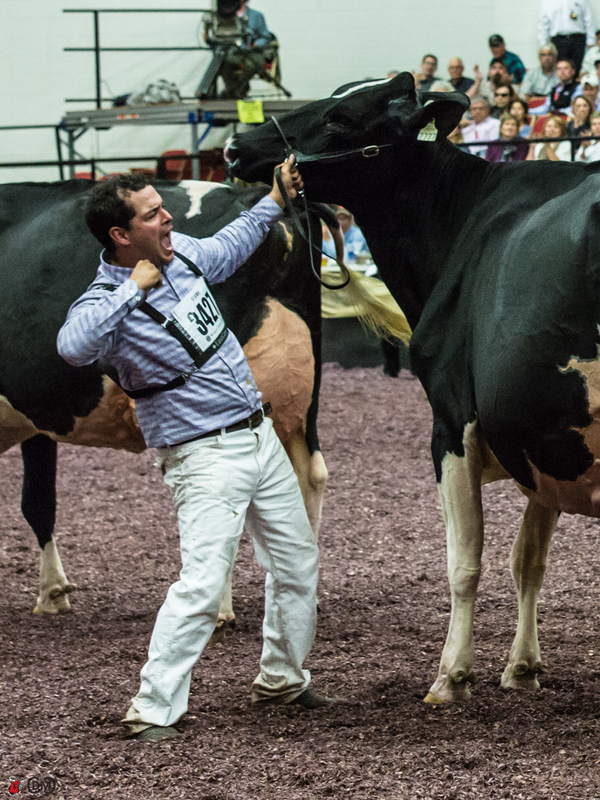 Justin Burdette, of Mercersburg, Pa., with the help of Associate Judge Gus Schwartzbeck, of Union Bridge, Md., placed a total of 412 animals. 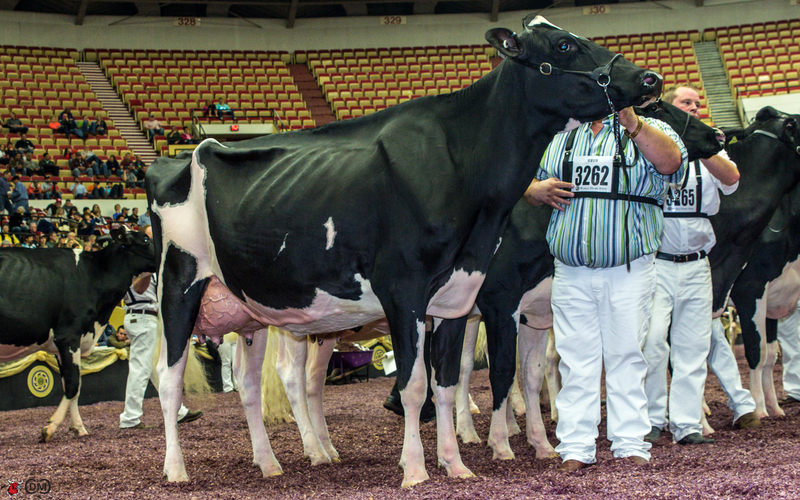 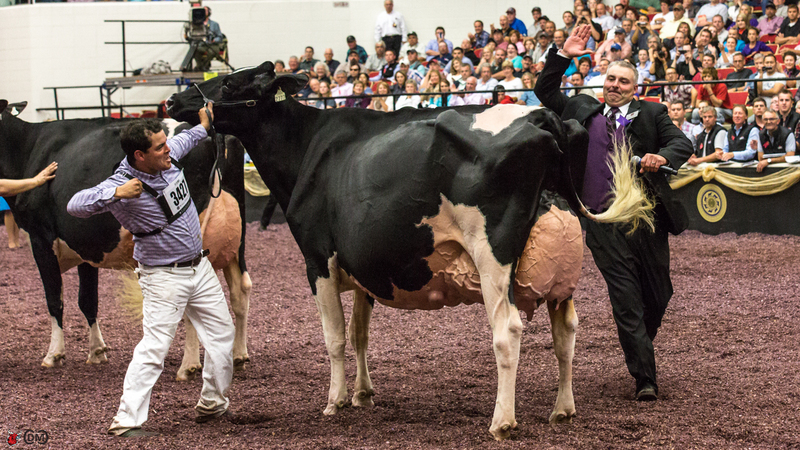 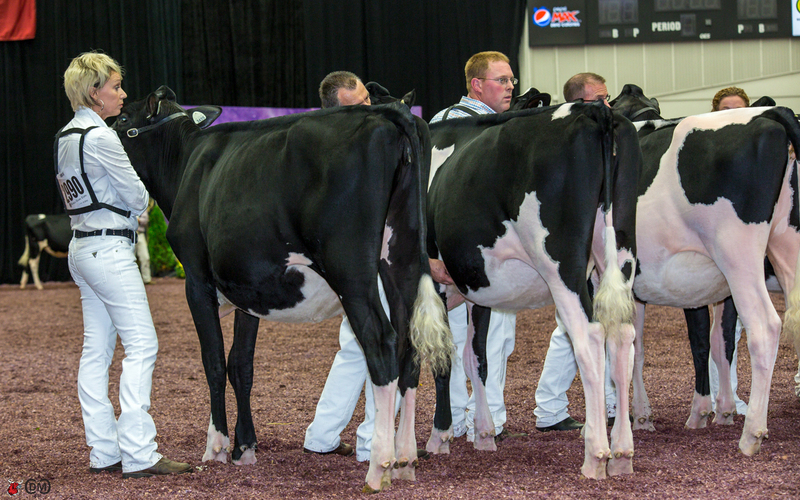 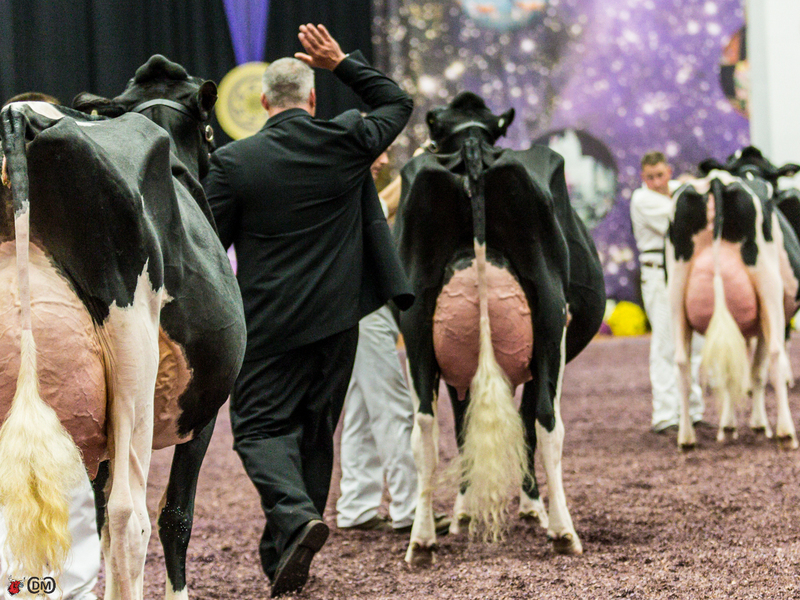 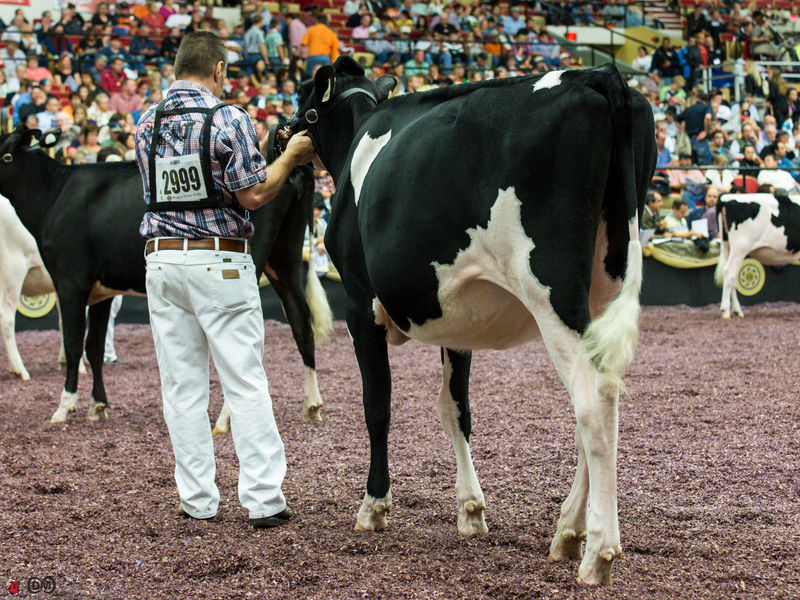 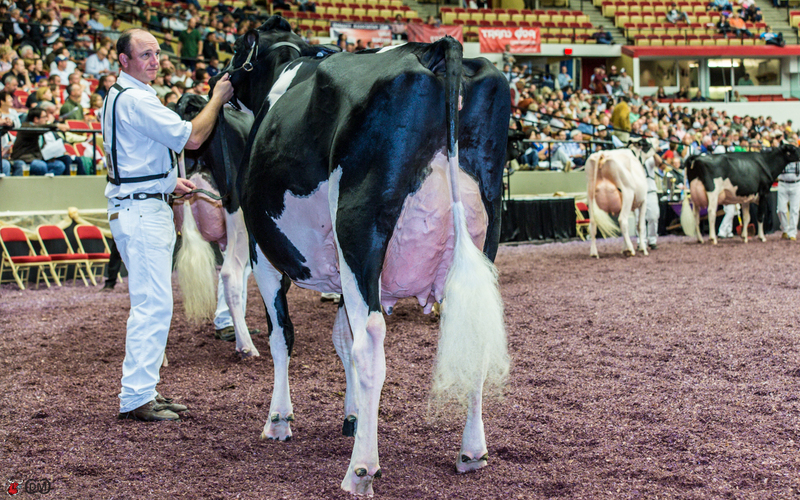 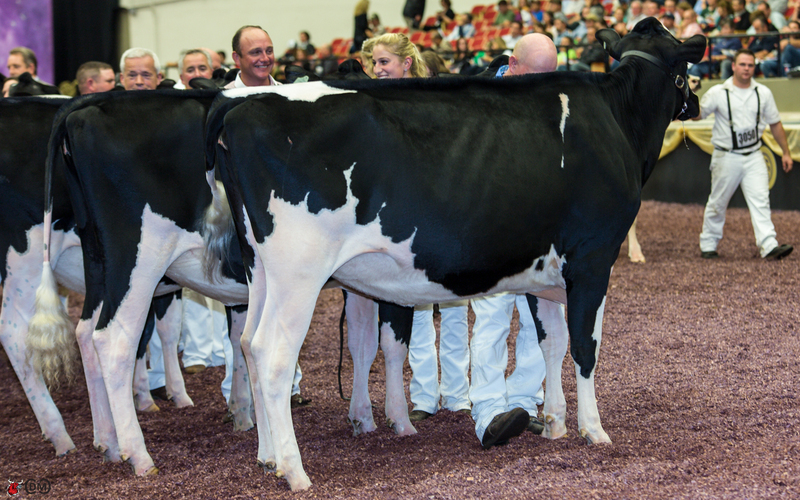 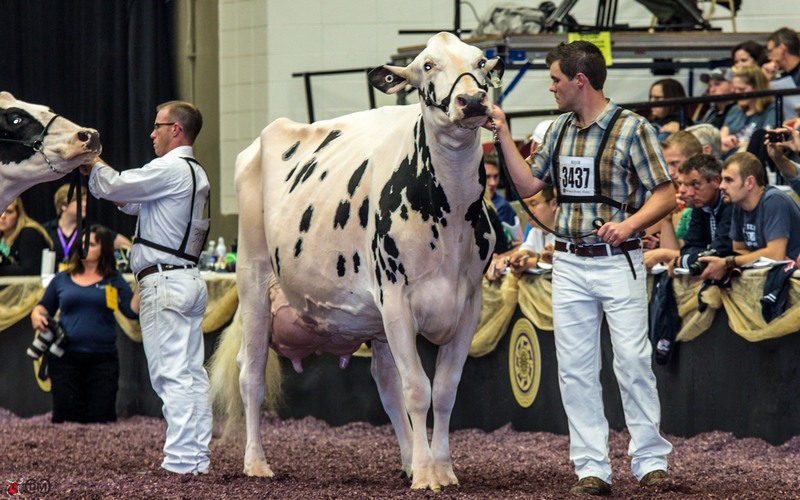 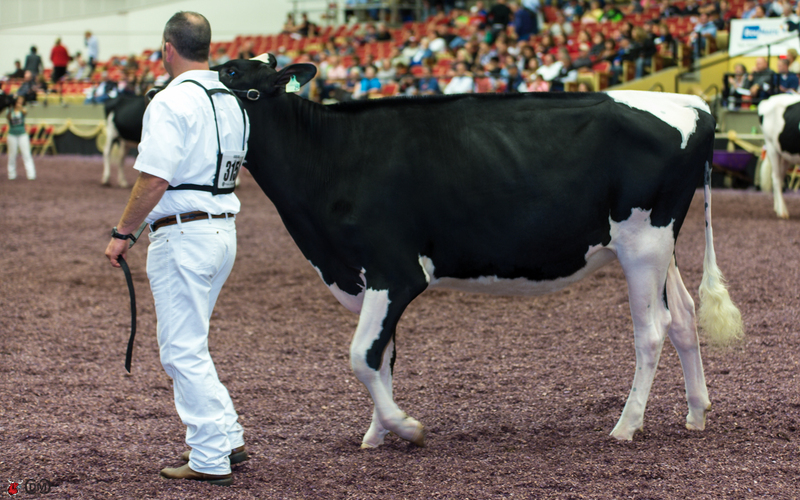 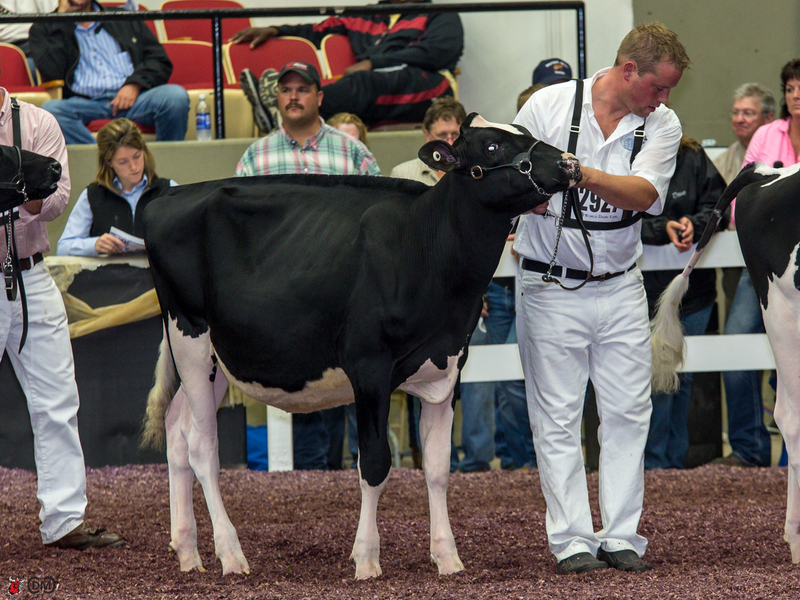 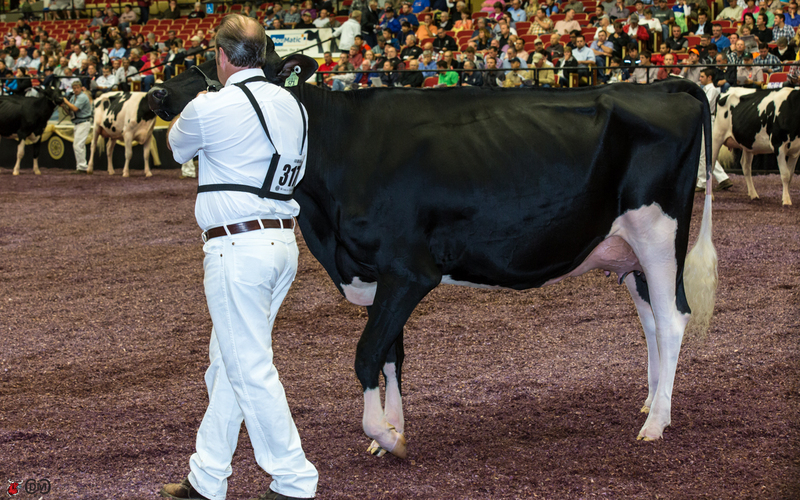 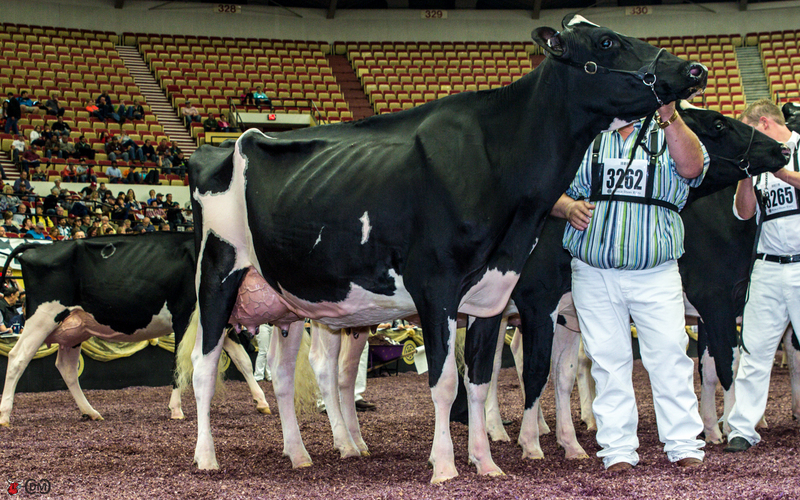 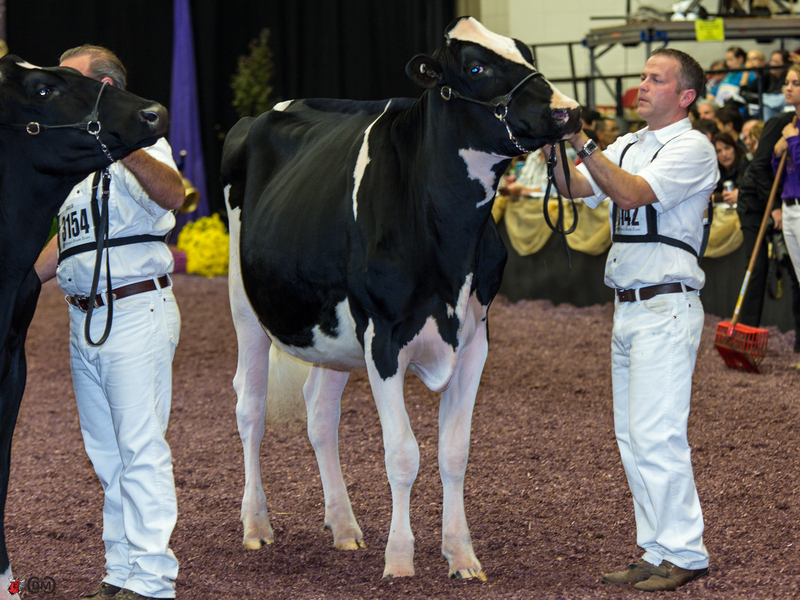 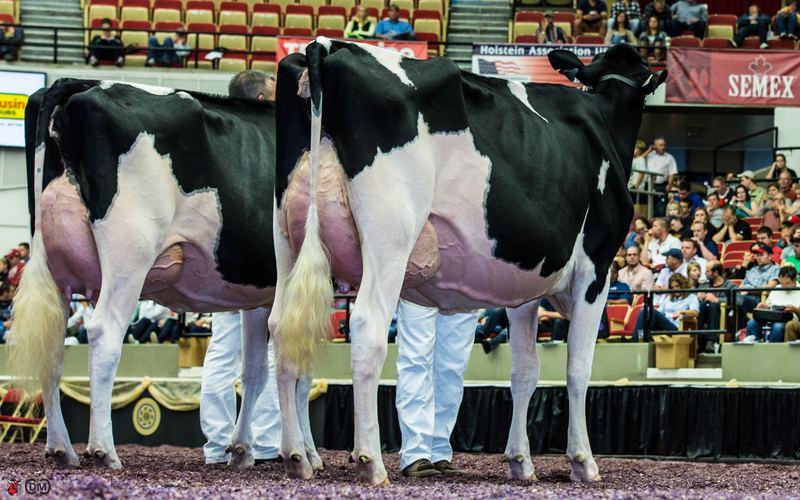 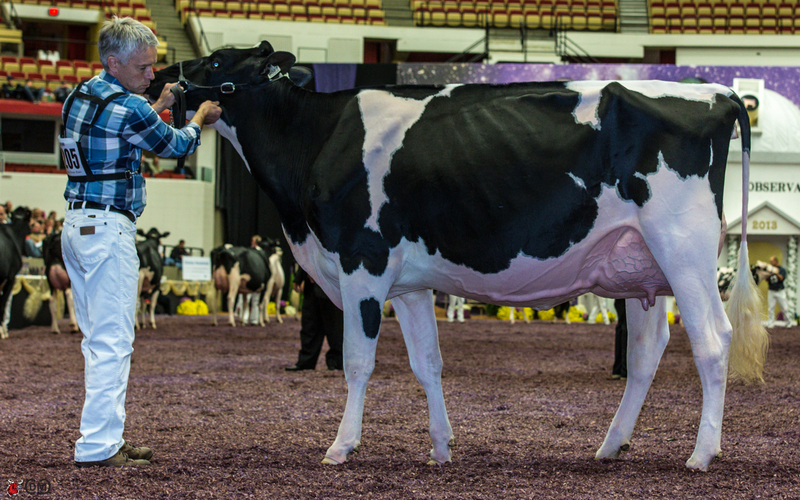 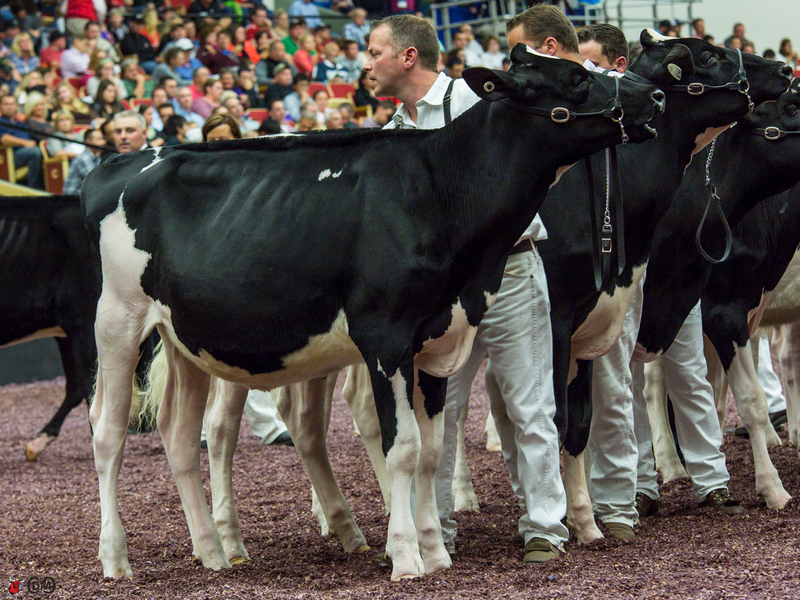 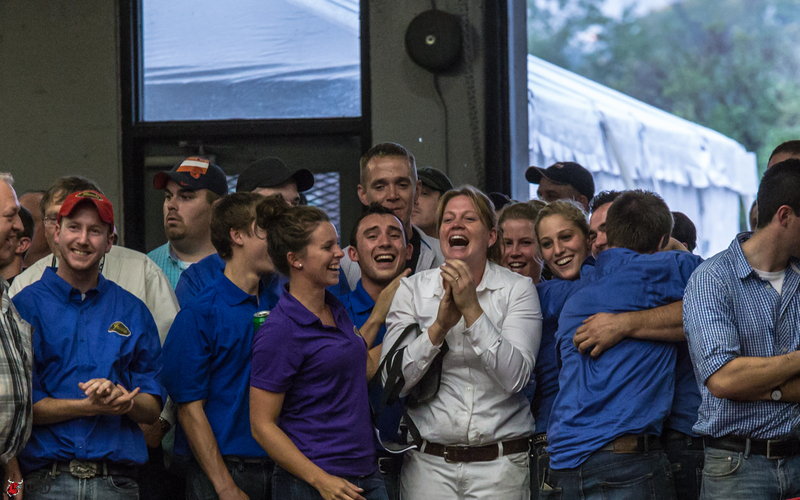 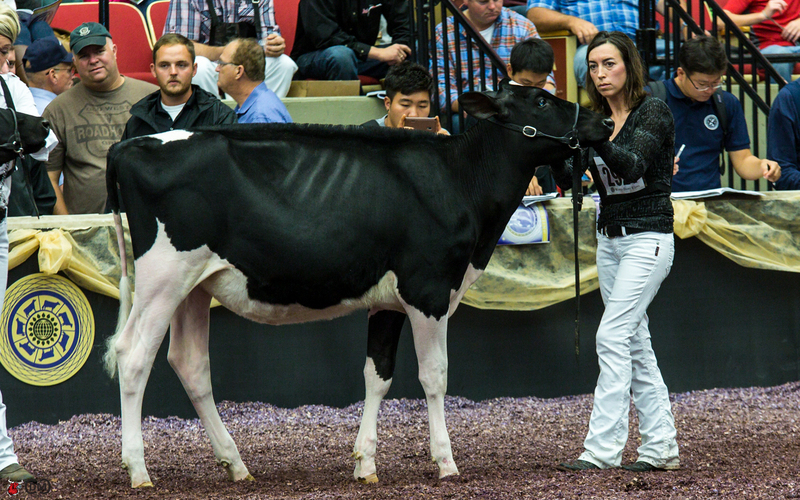 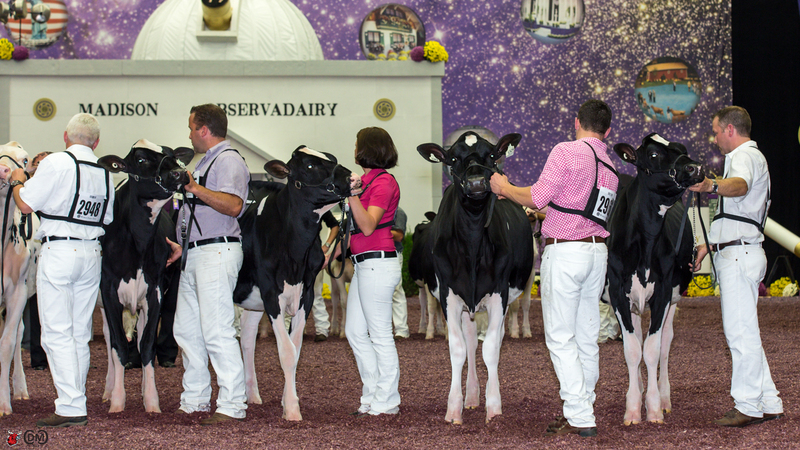 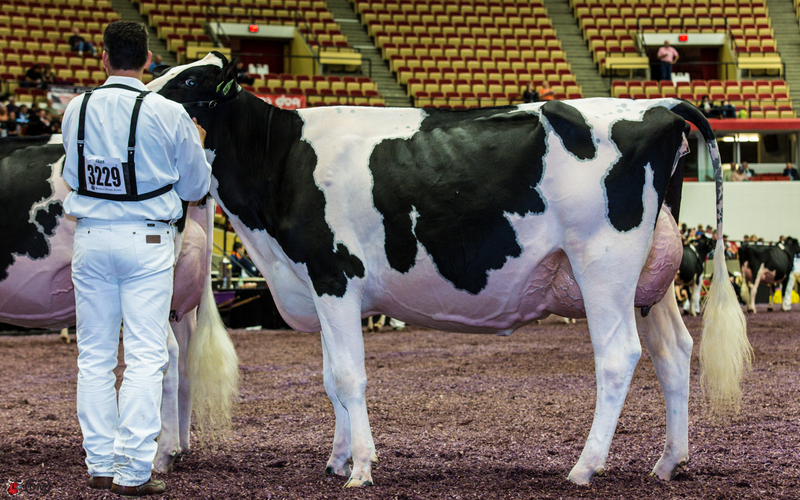 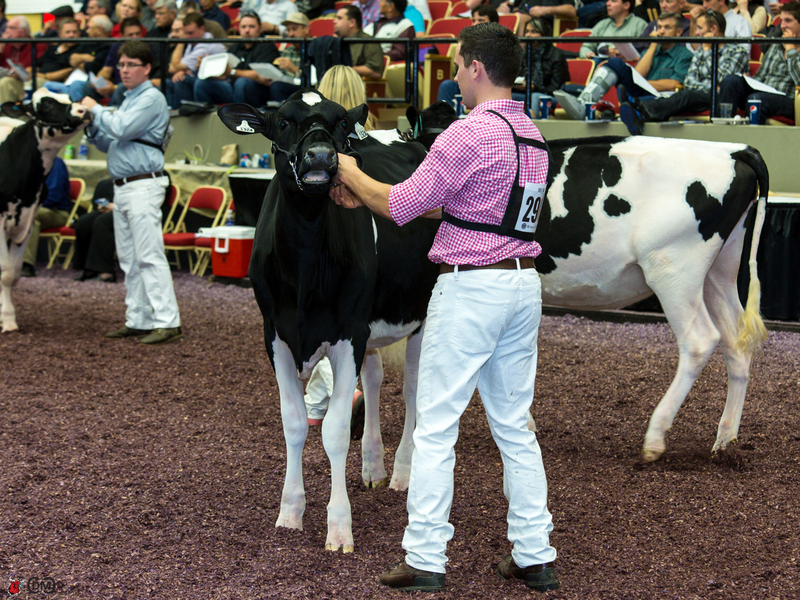 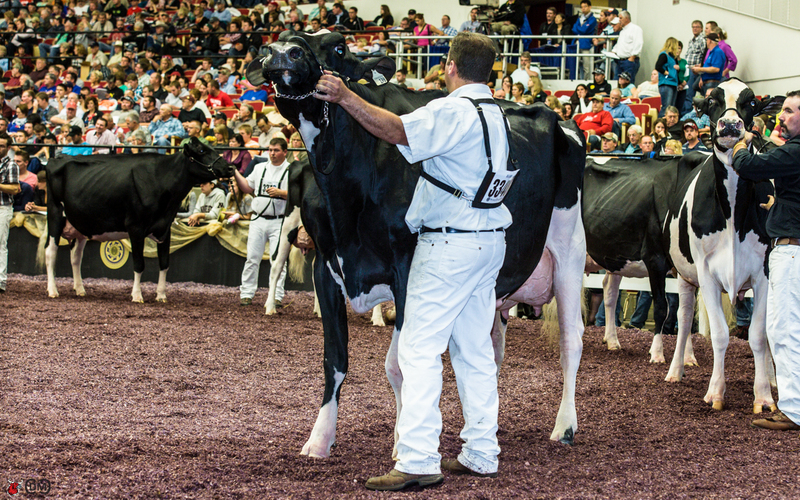 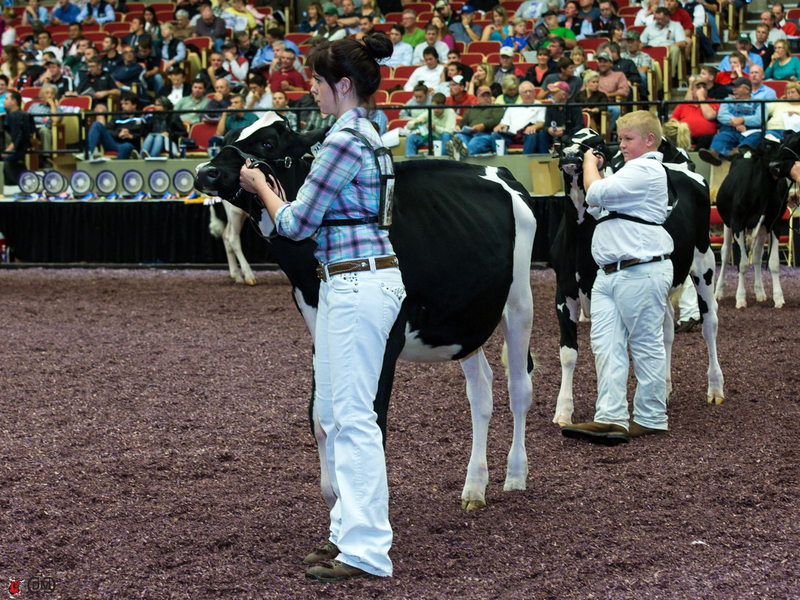 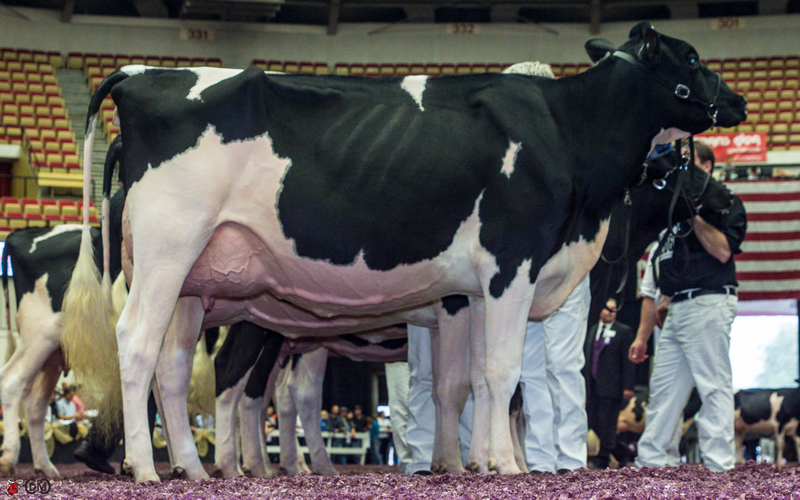 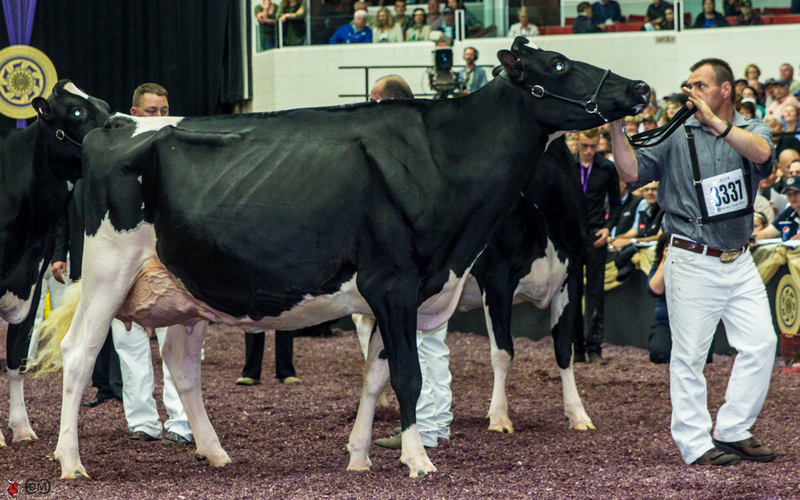 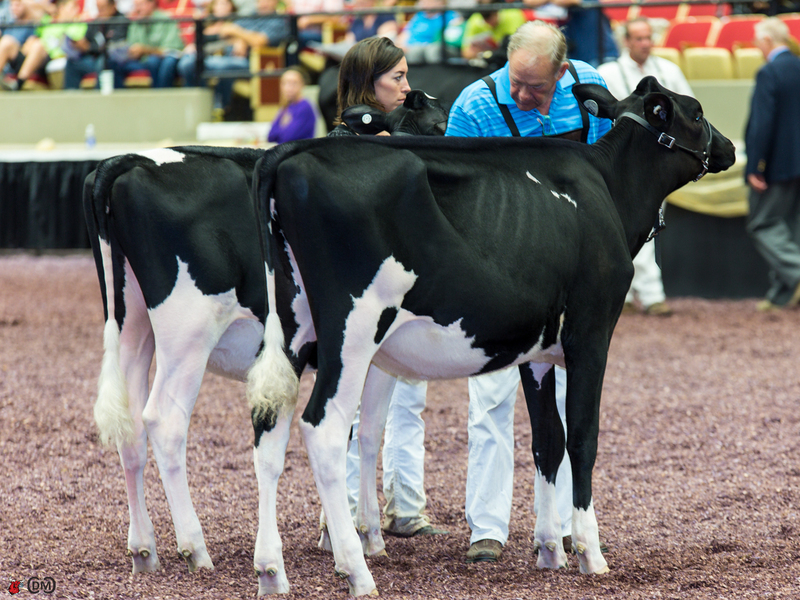 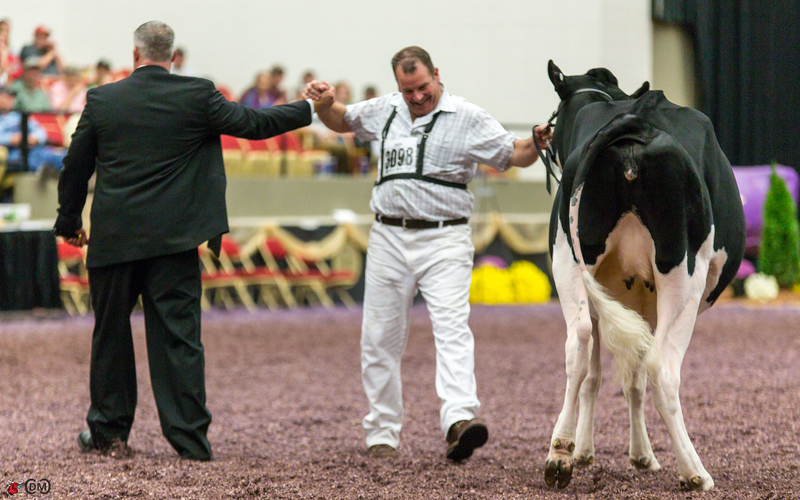 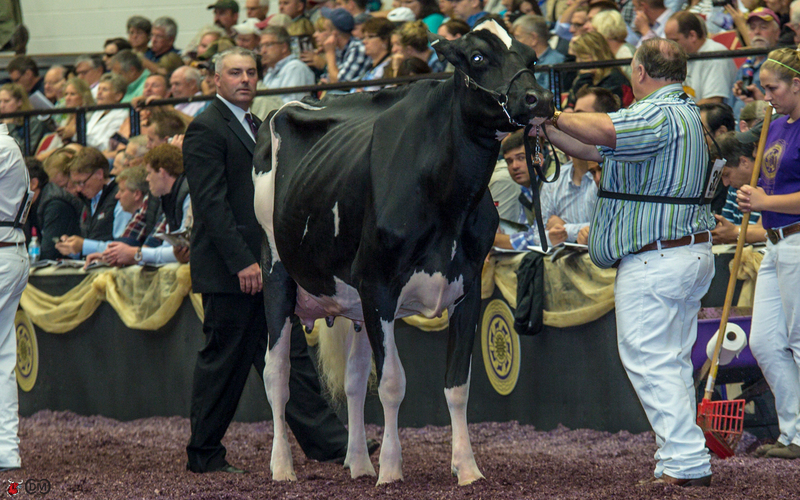 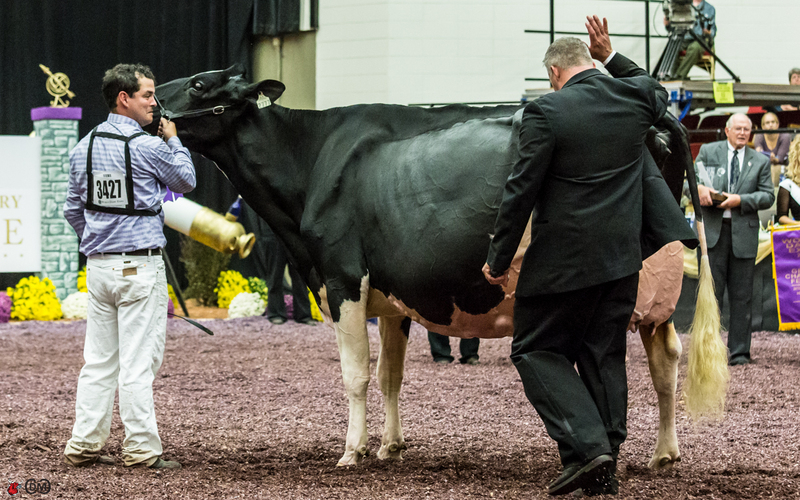 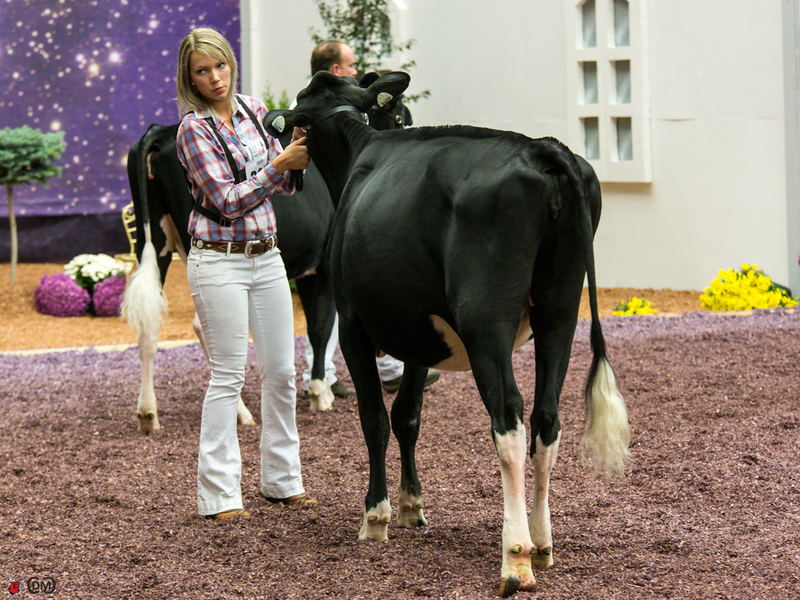 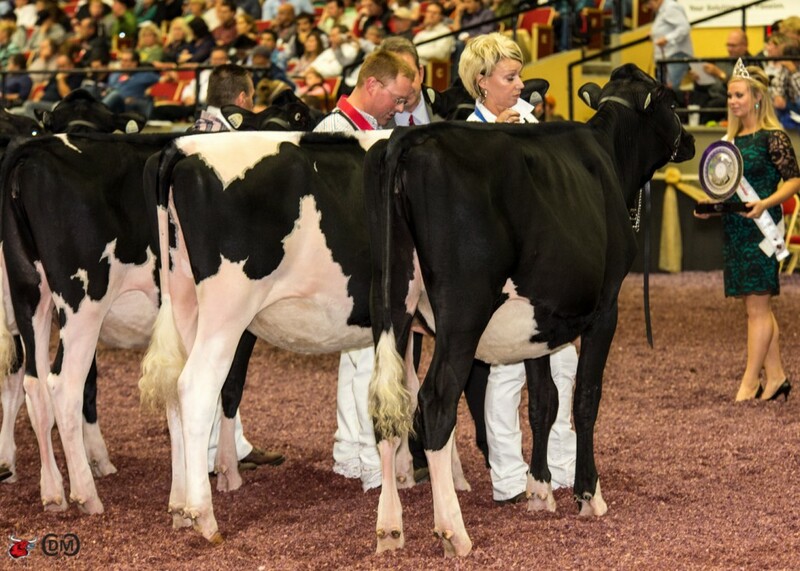 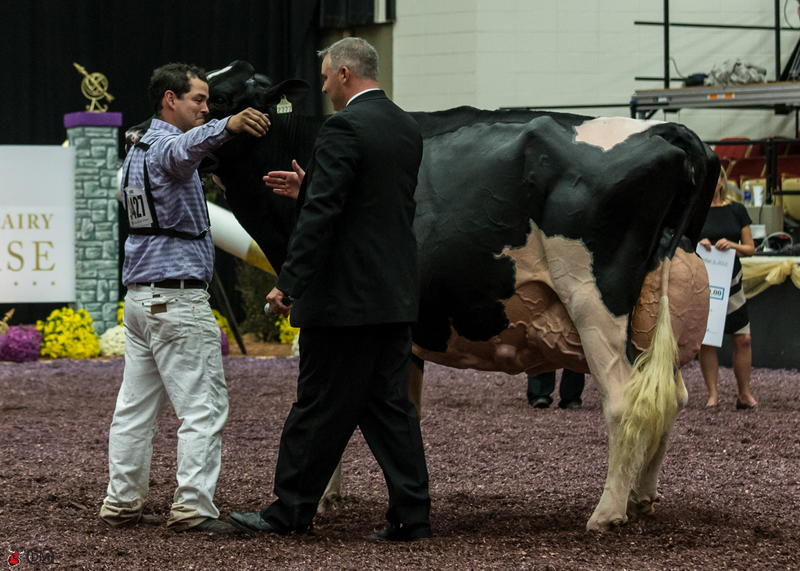 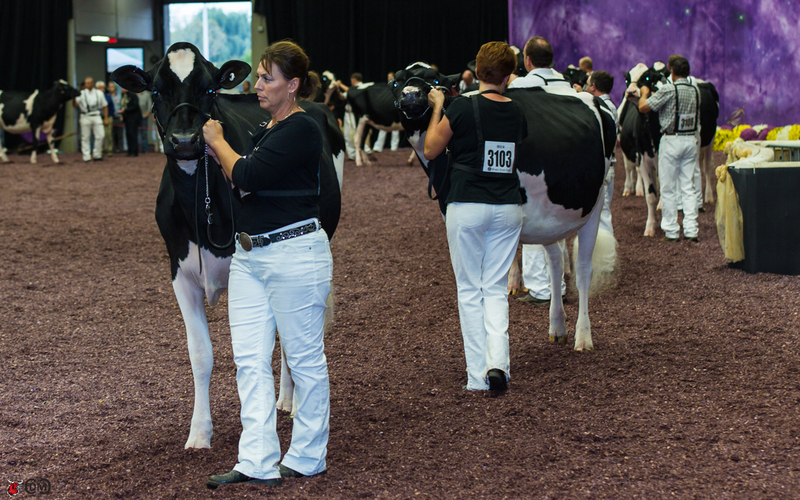 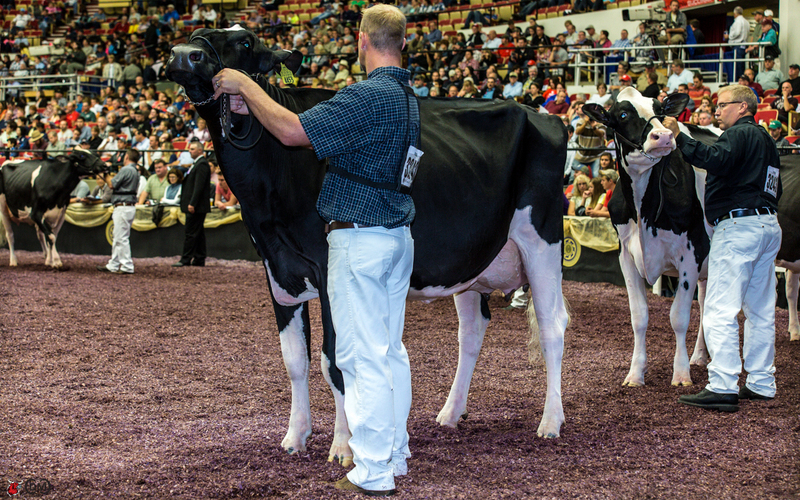 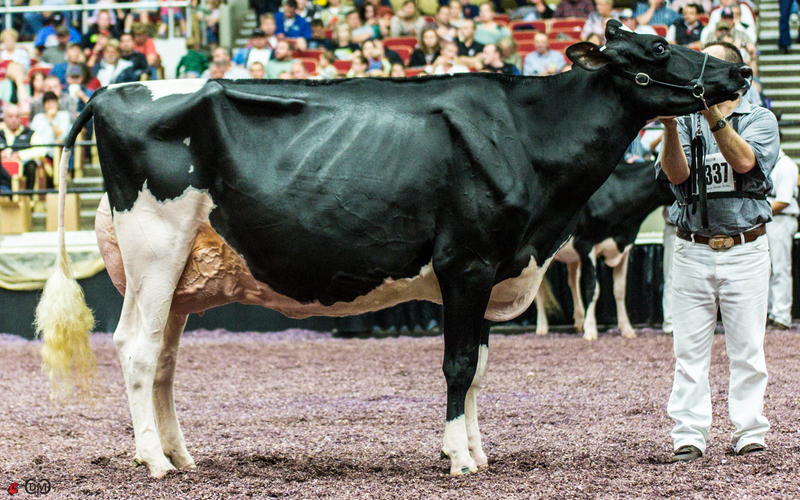 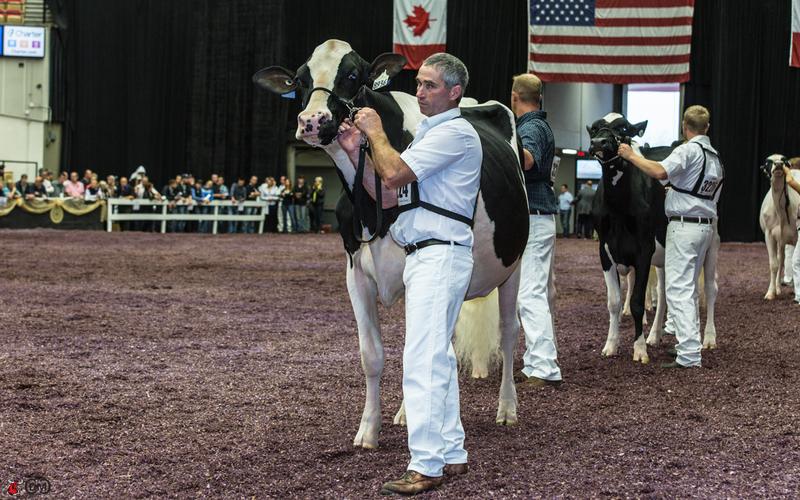 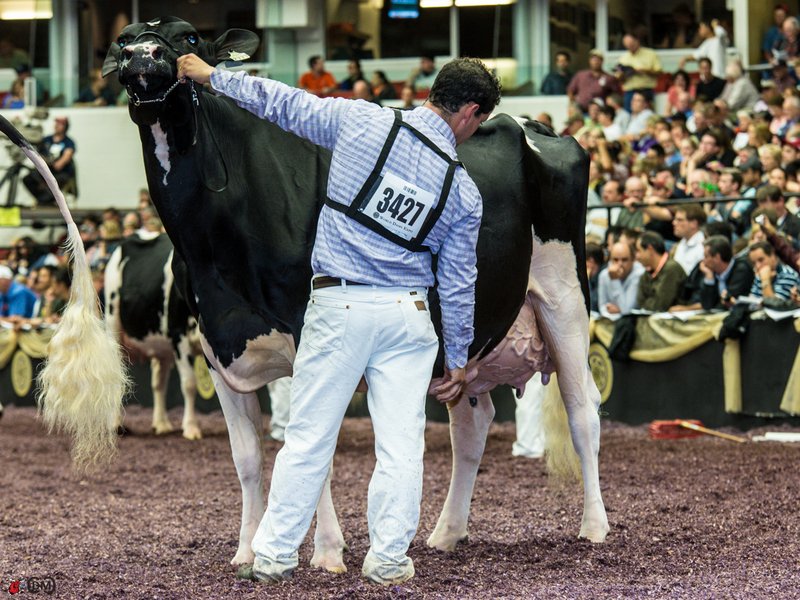 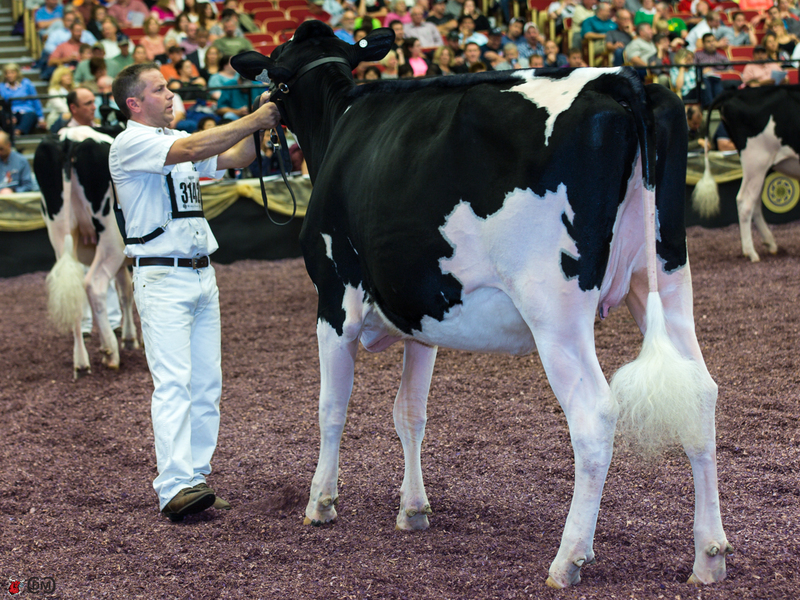 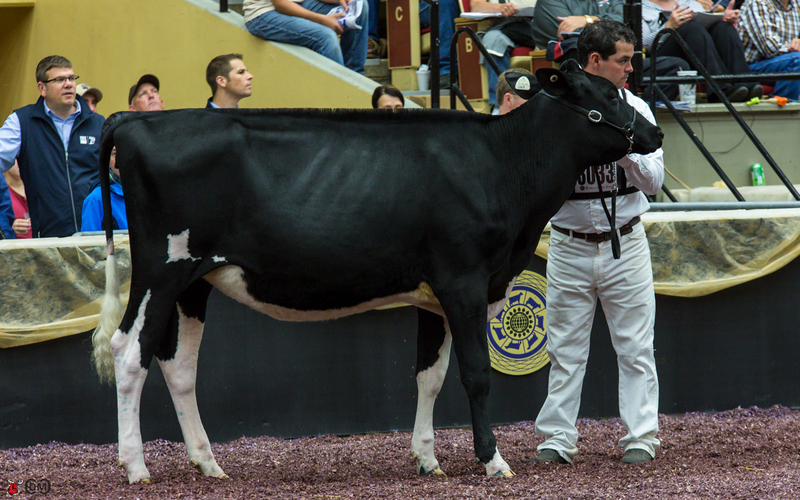 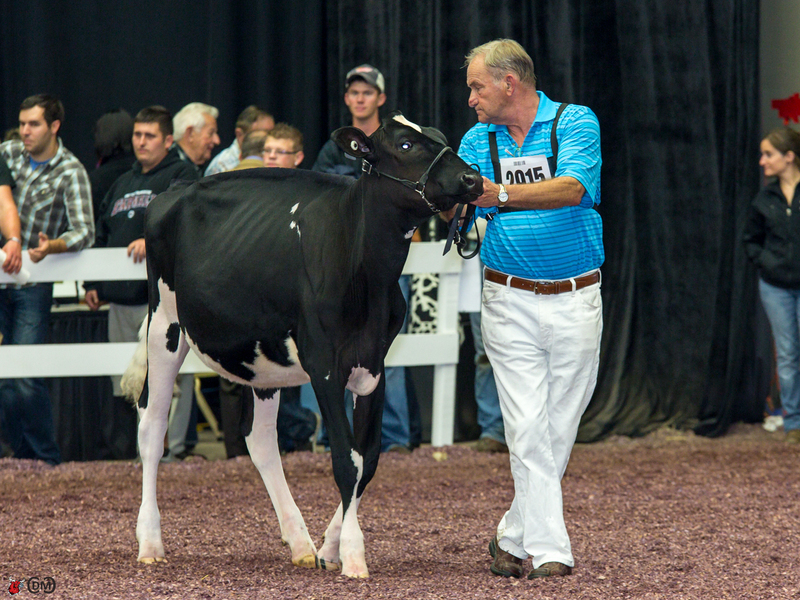 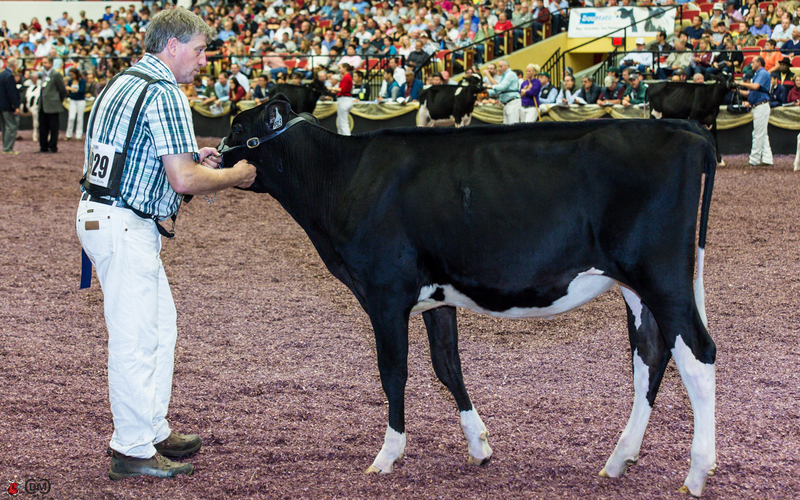 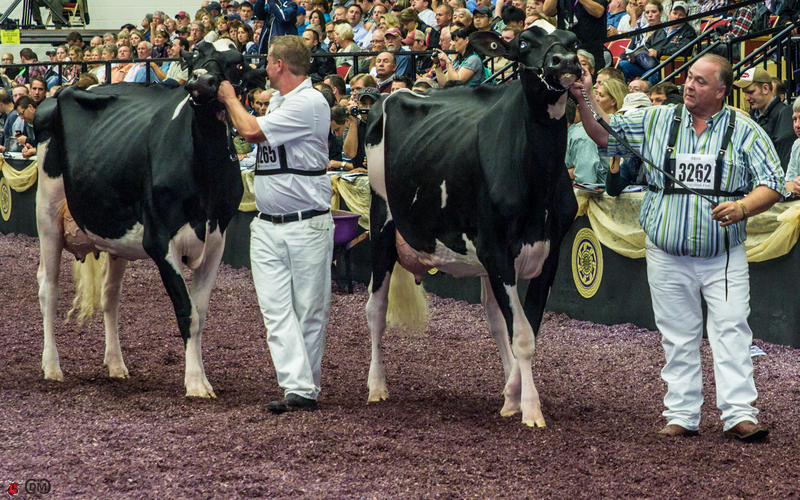 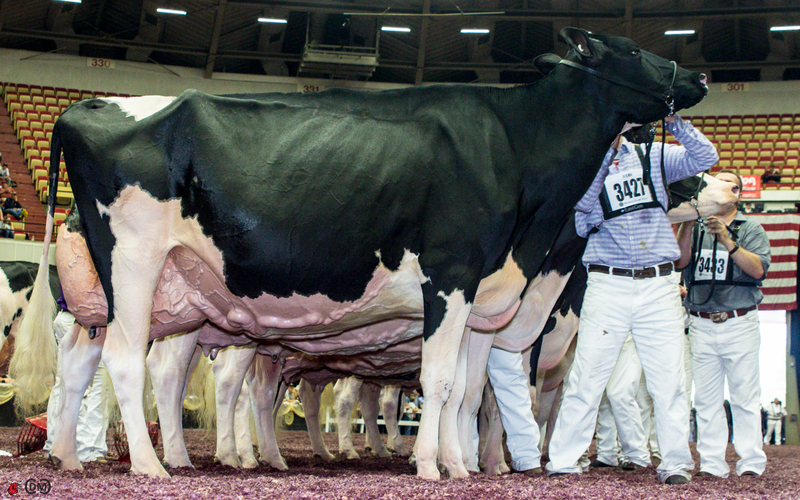 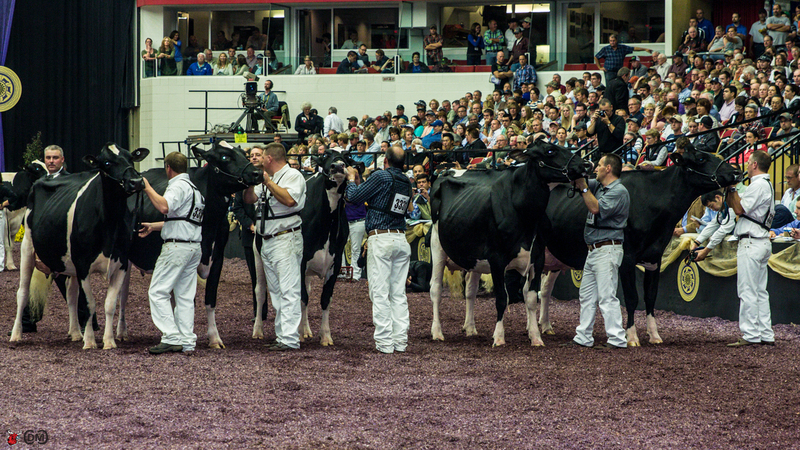 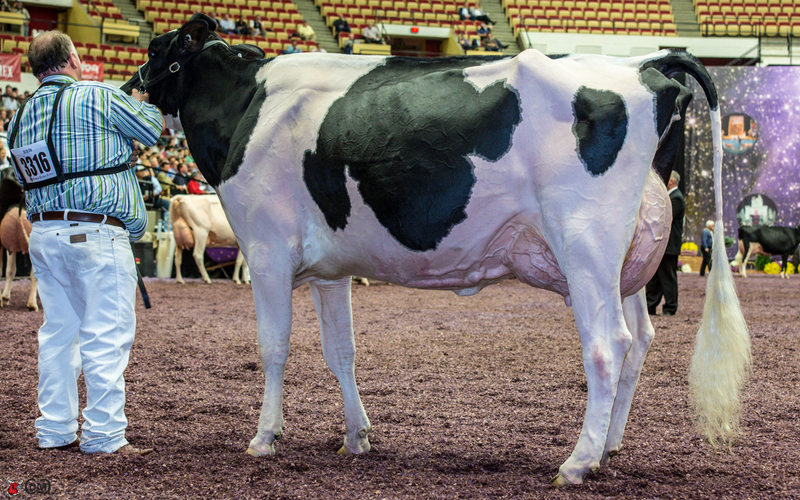 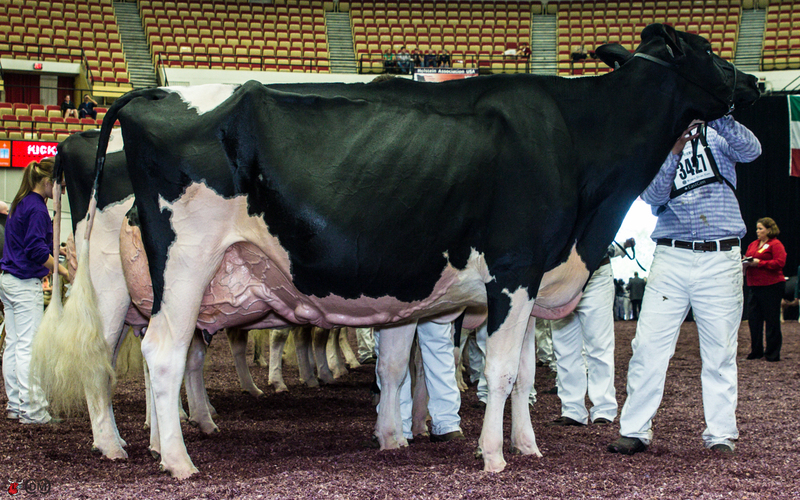 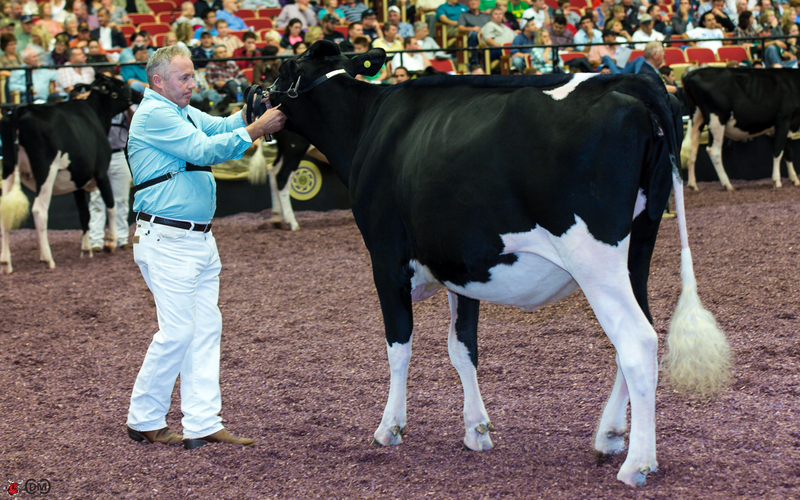 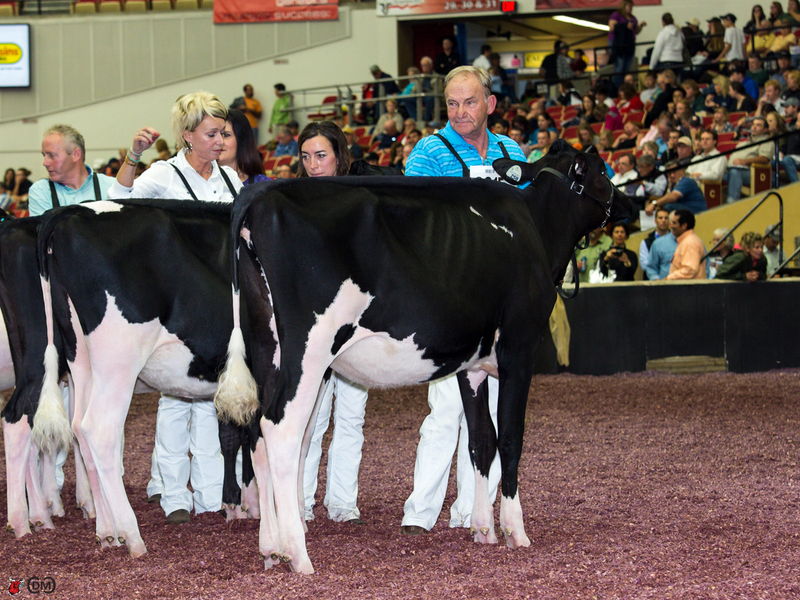 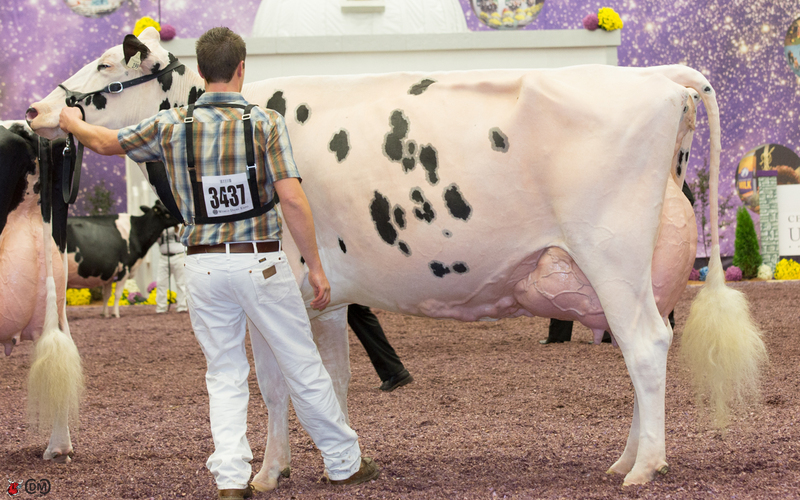 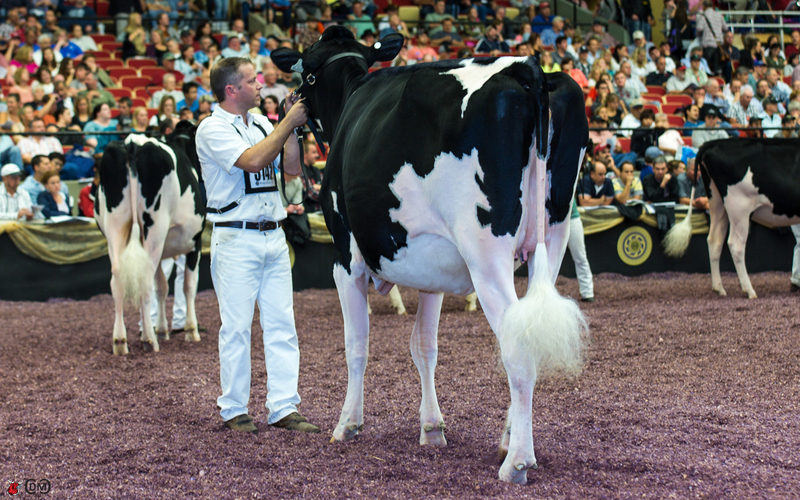 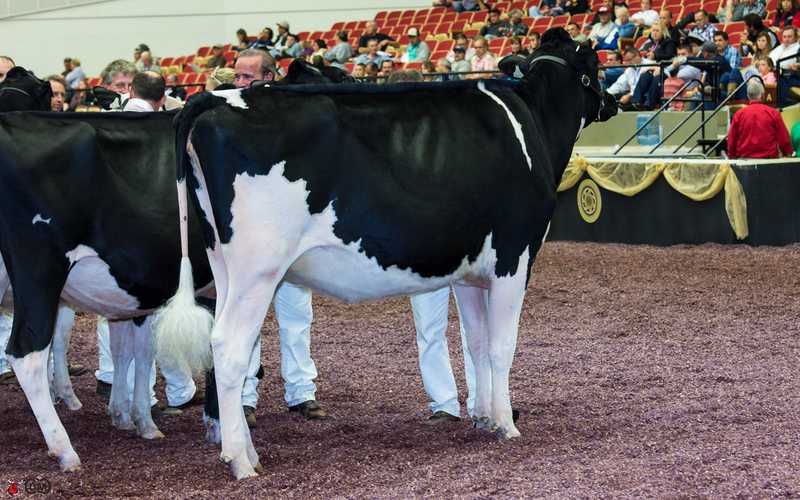 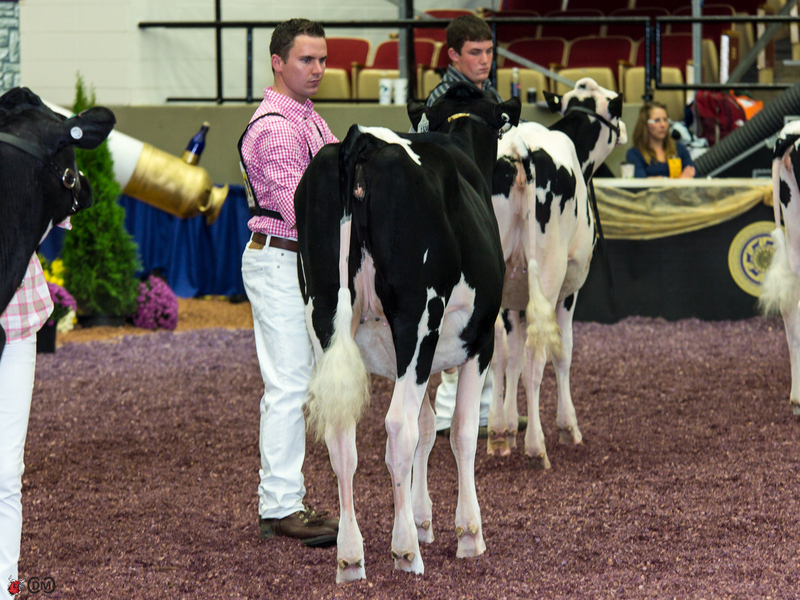 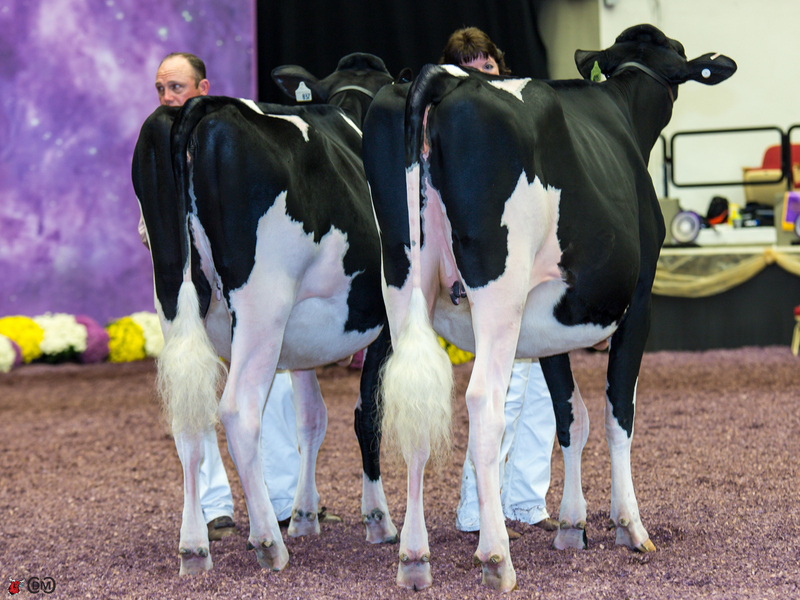 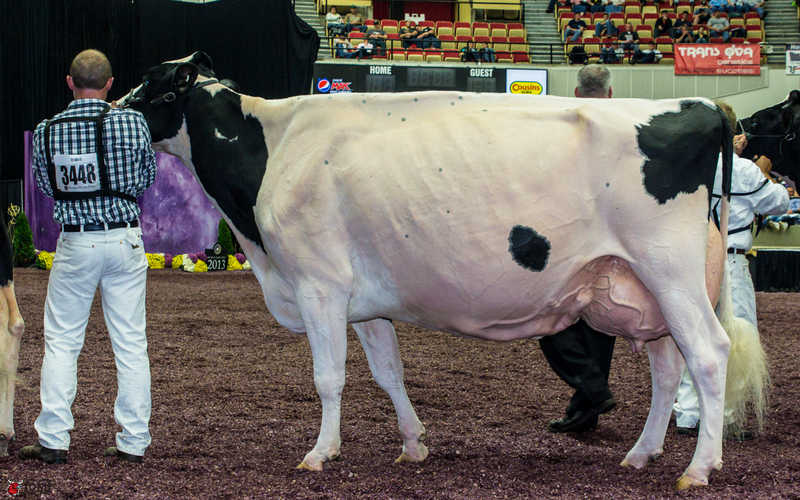 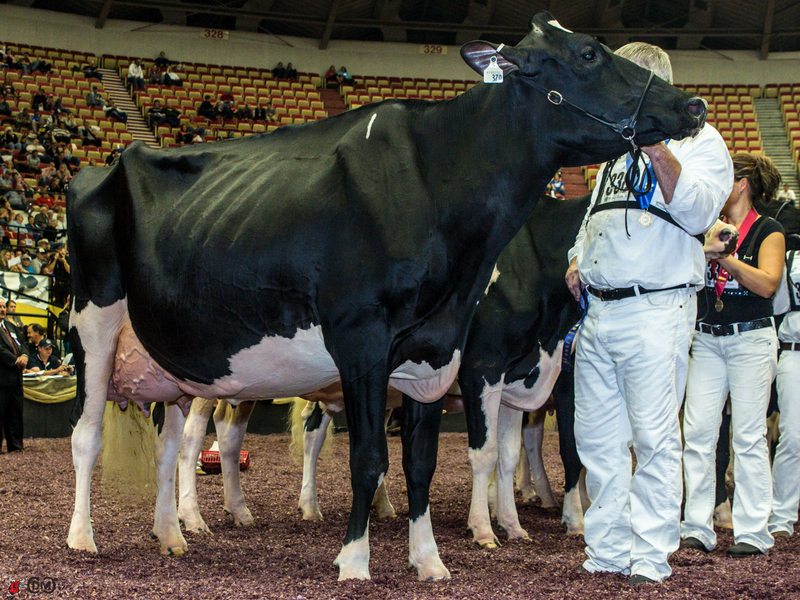 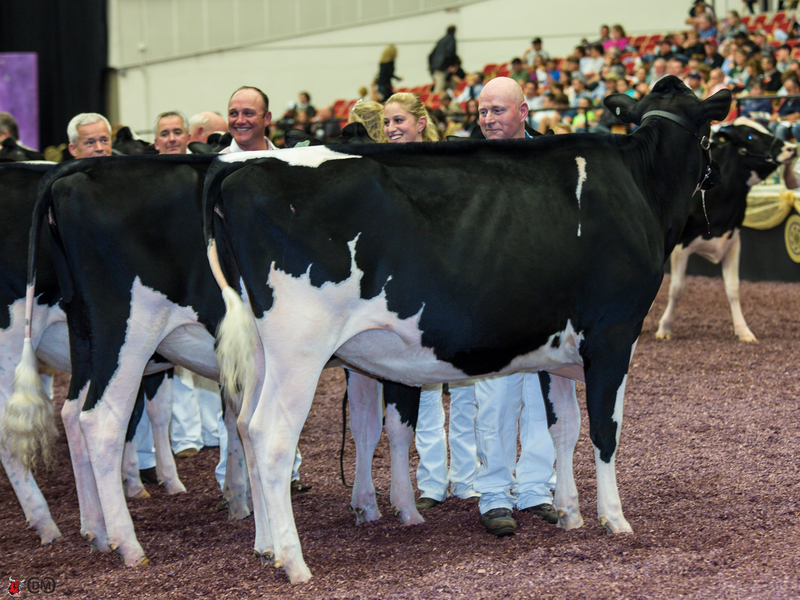 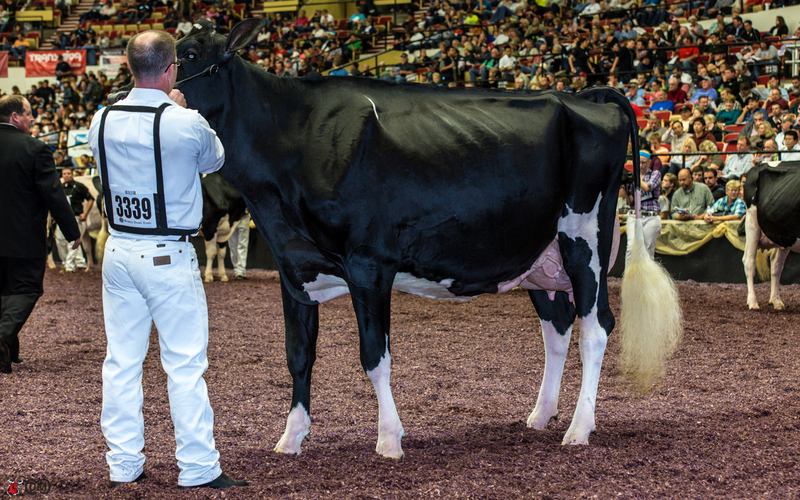 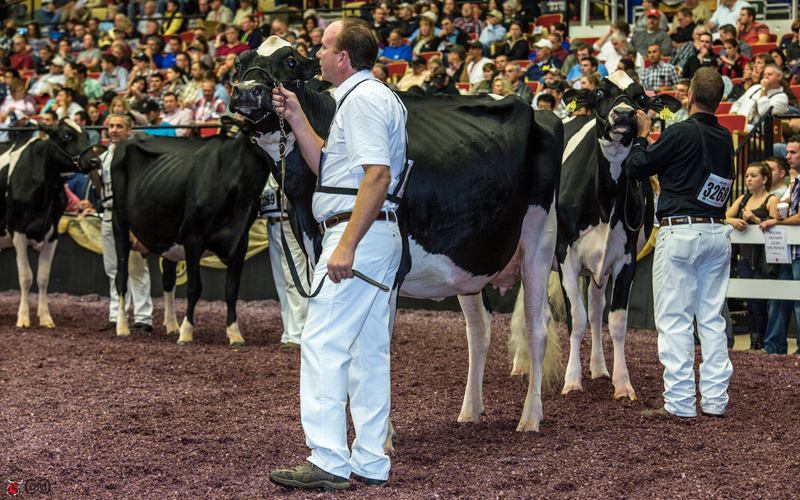 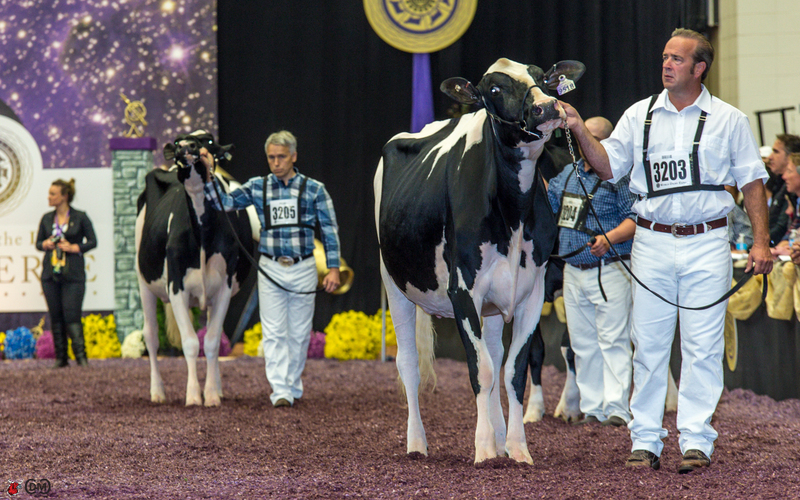 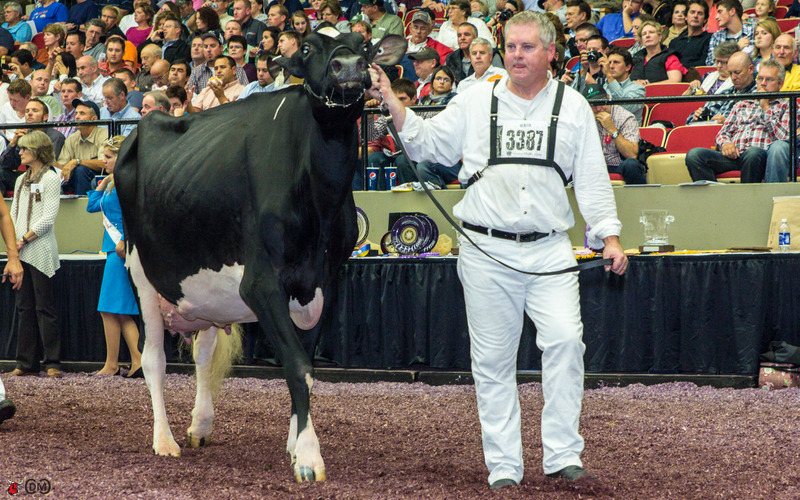 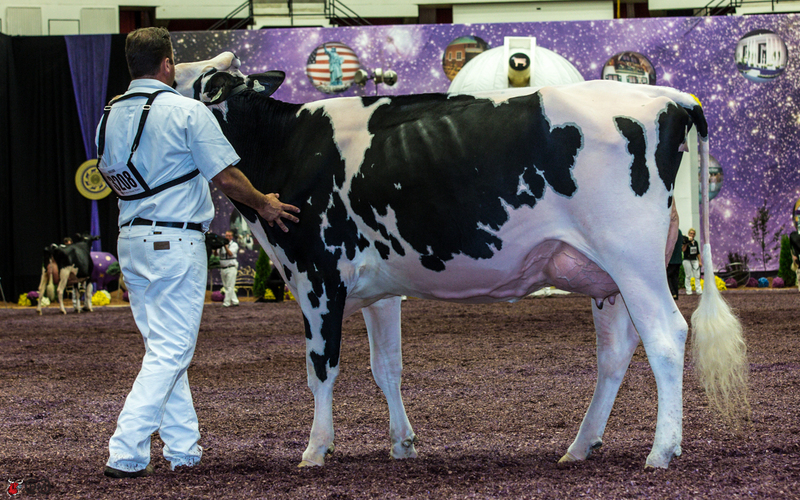 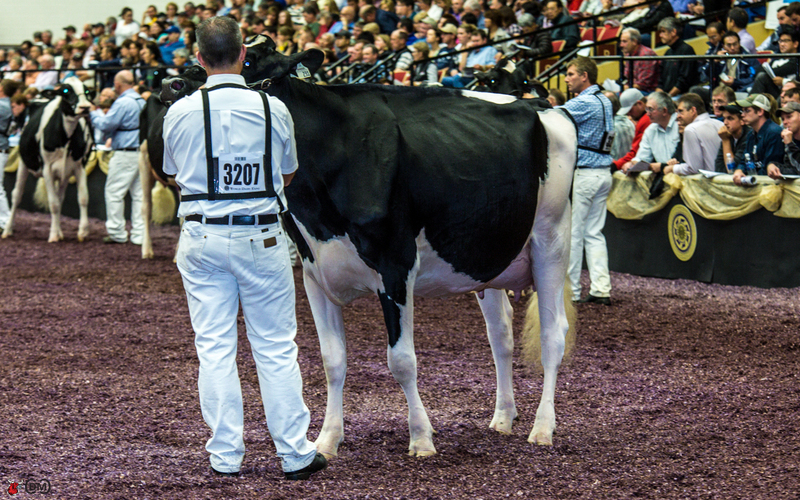 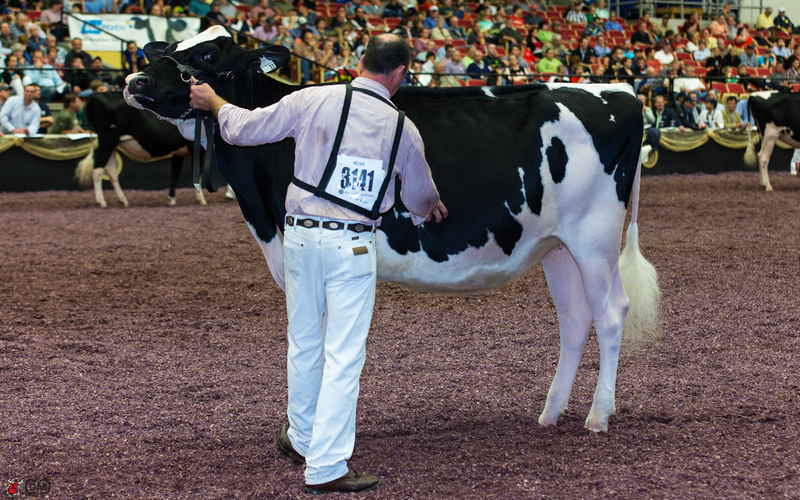 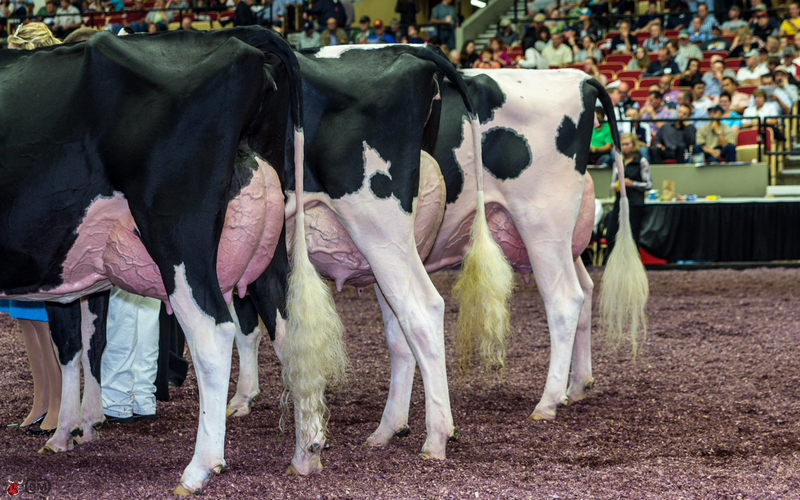 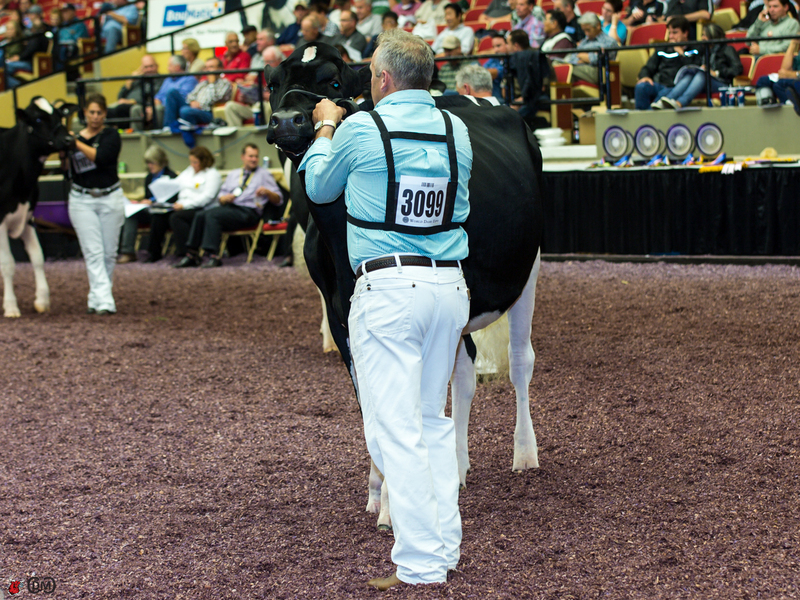 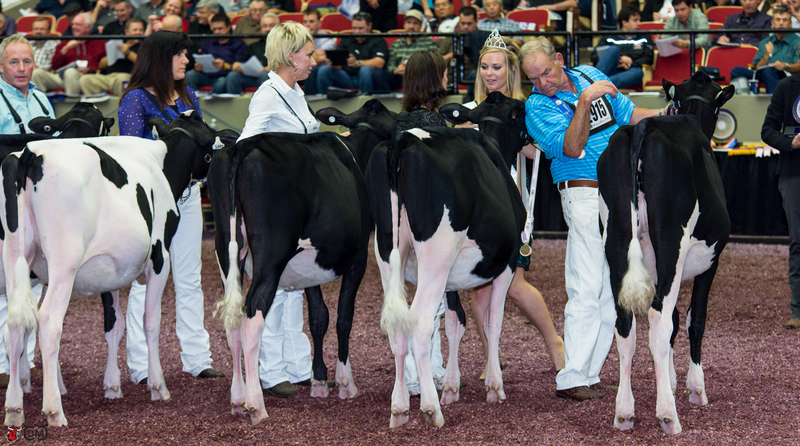 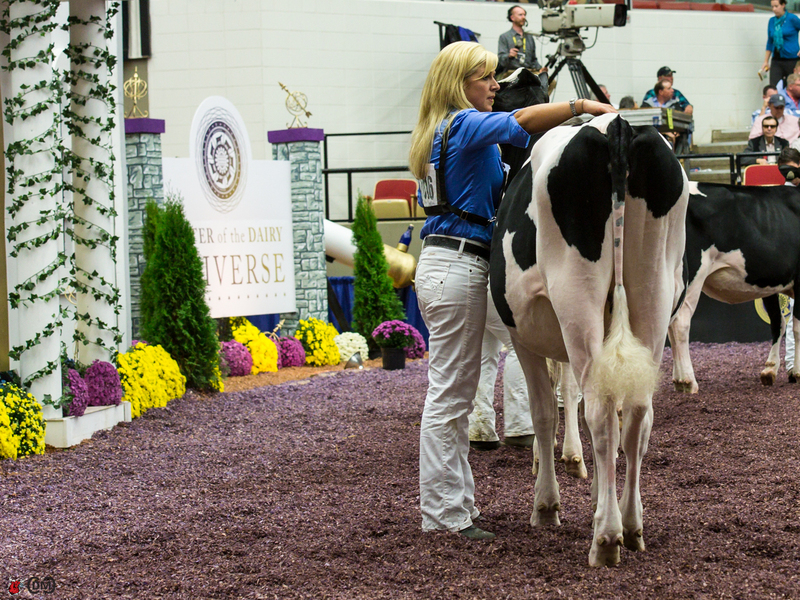 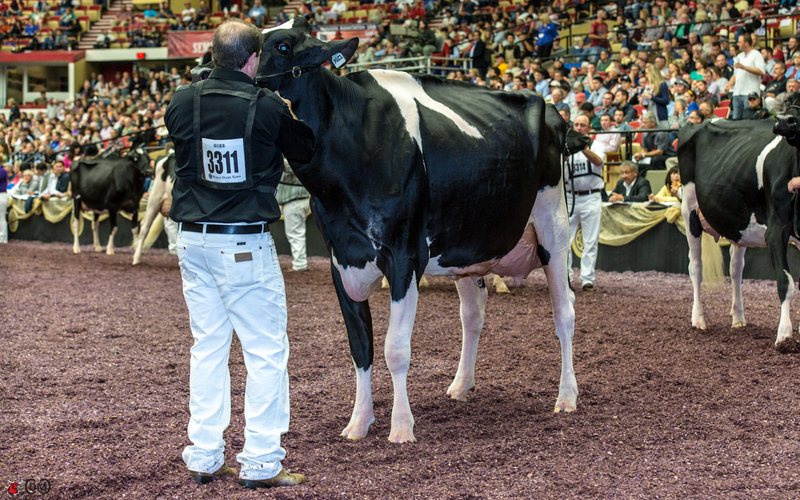 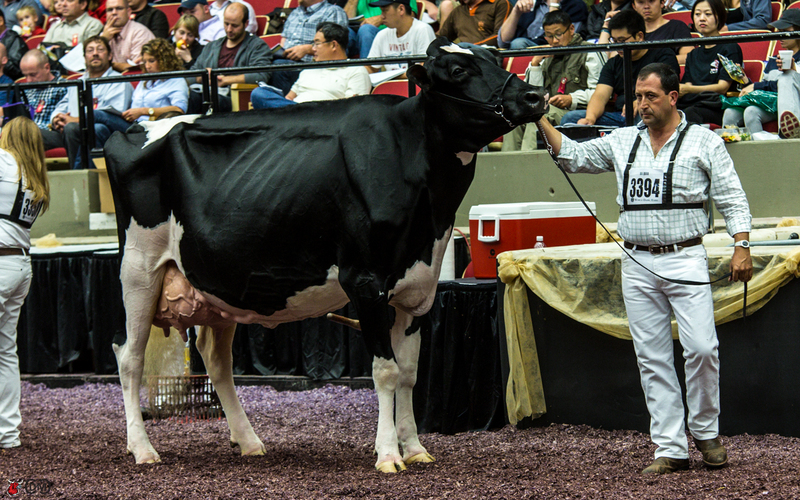 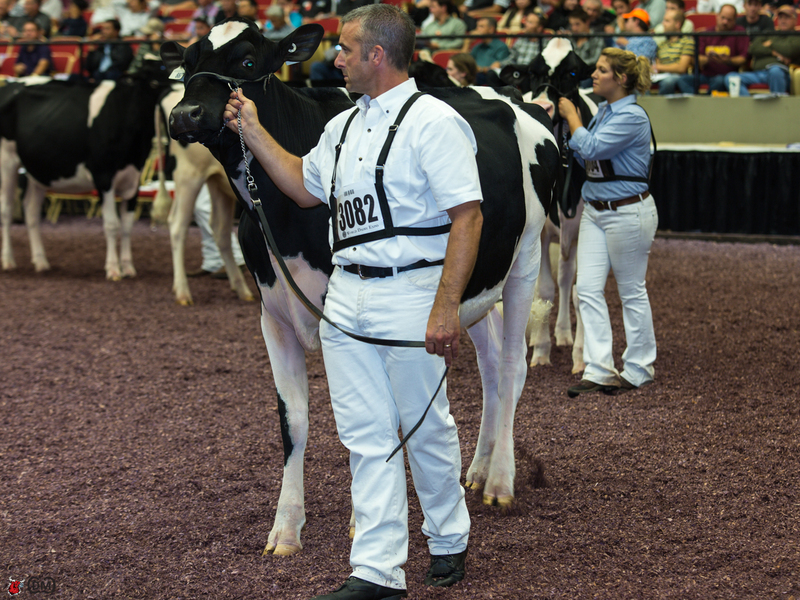 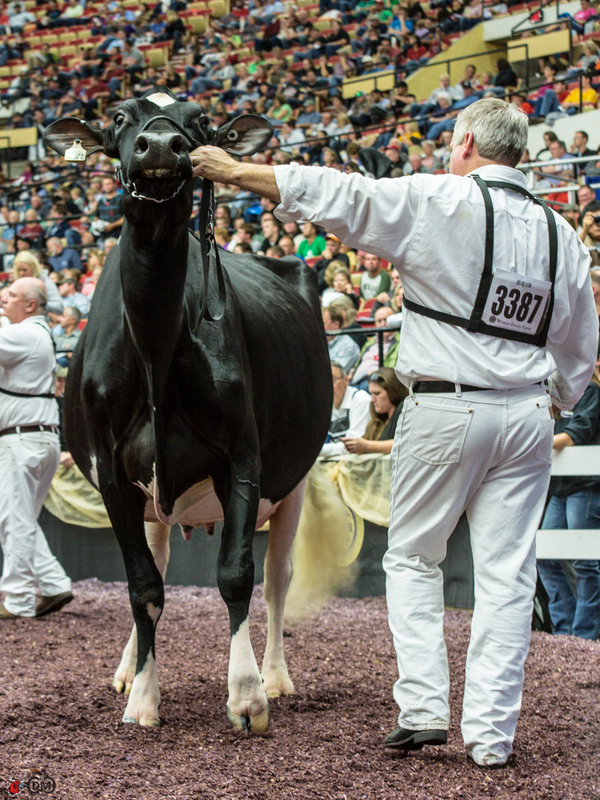 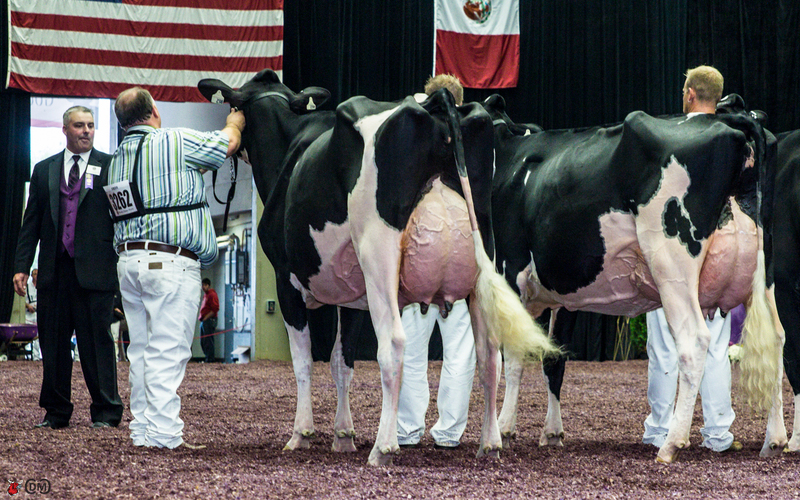 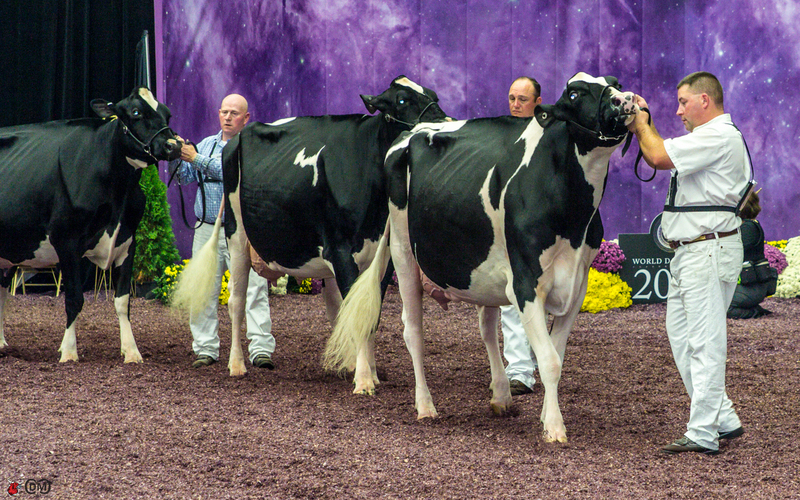 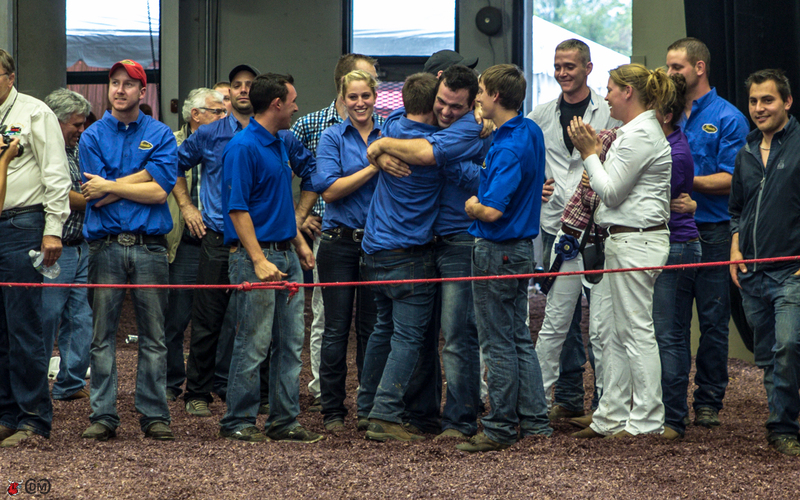 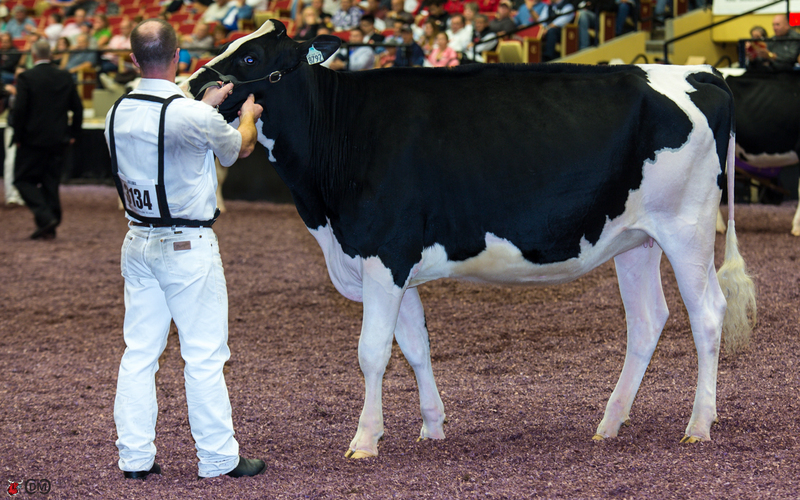 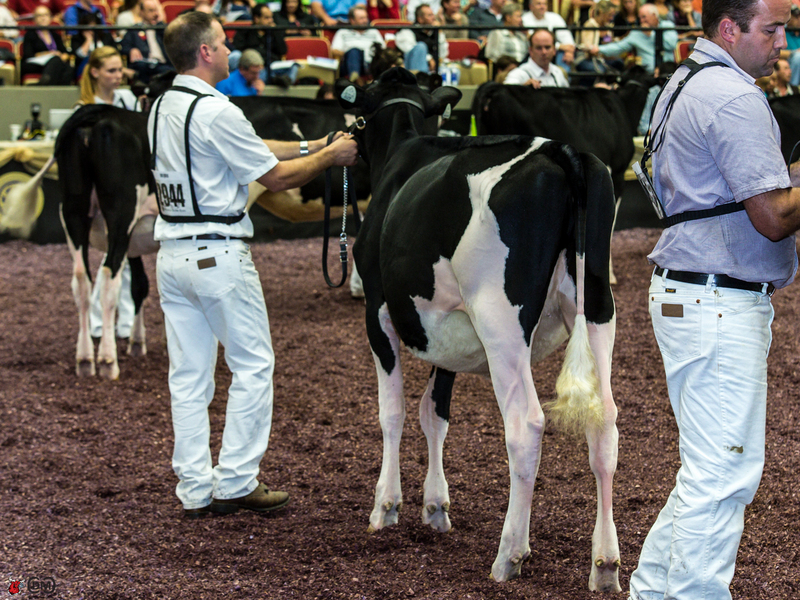 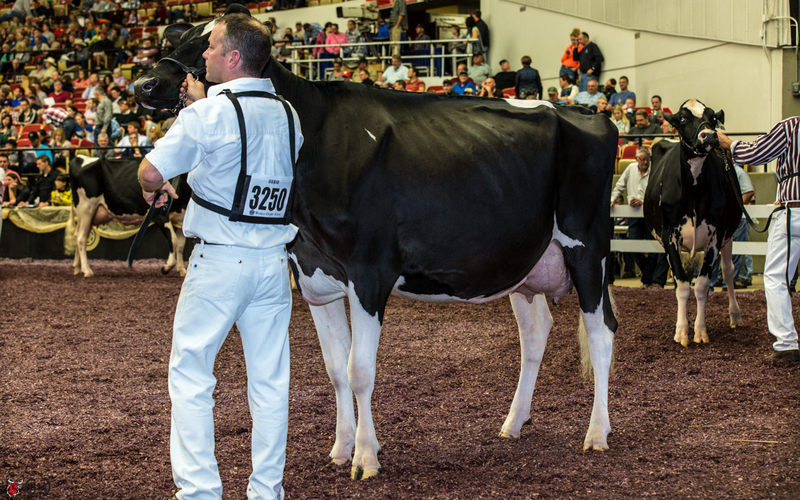 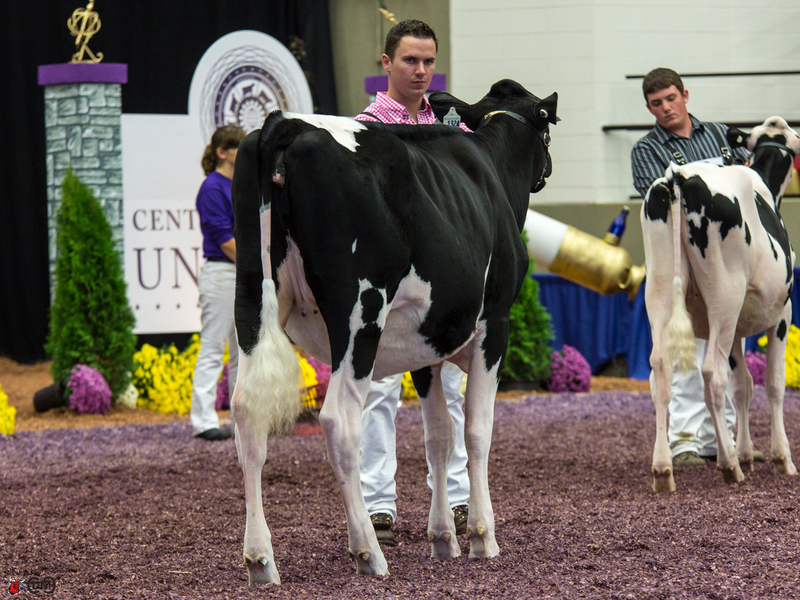 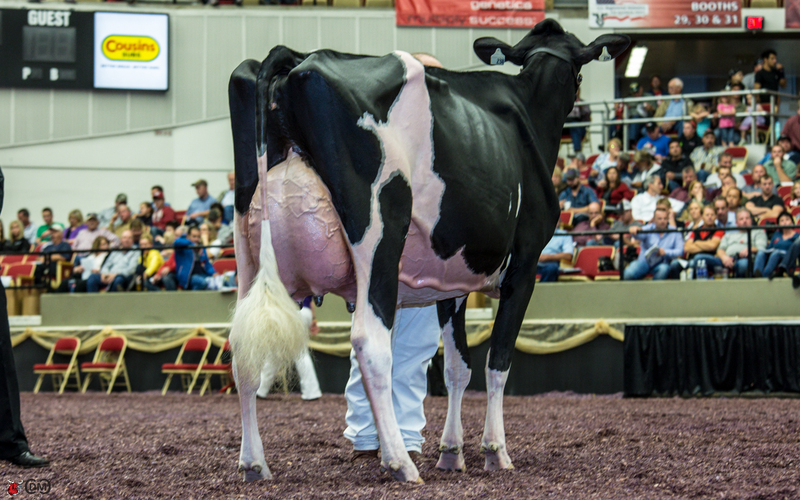 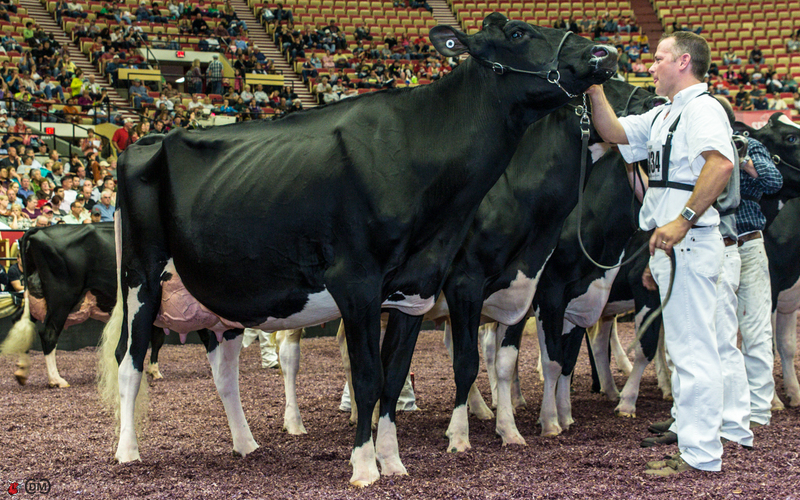 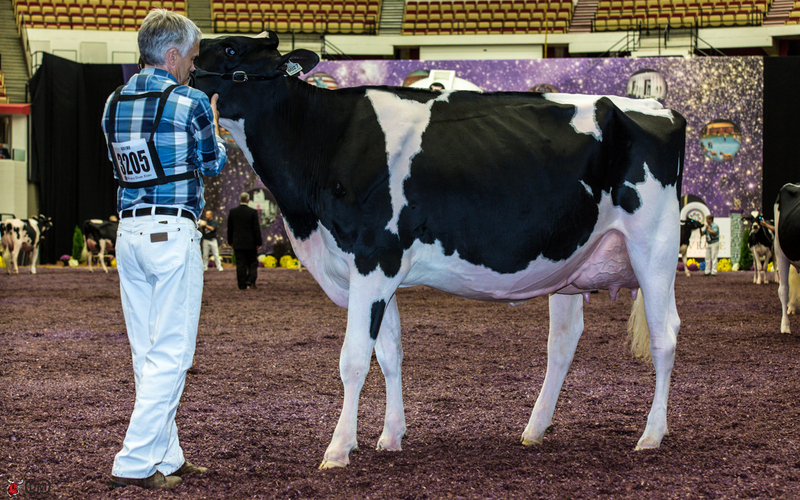 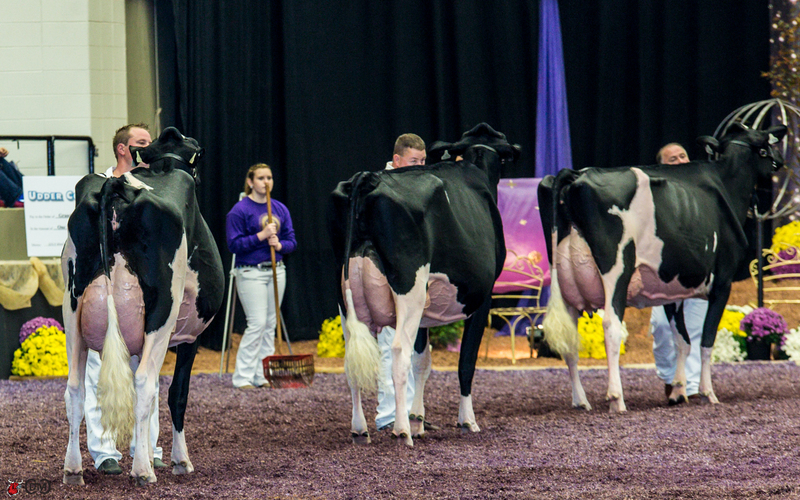 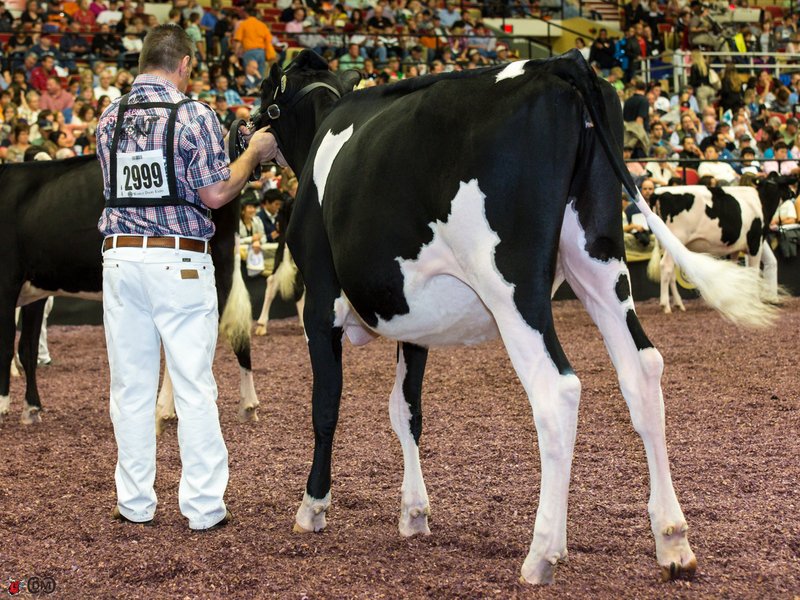 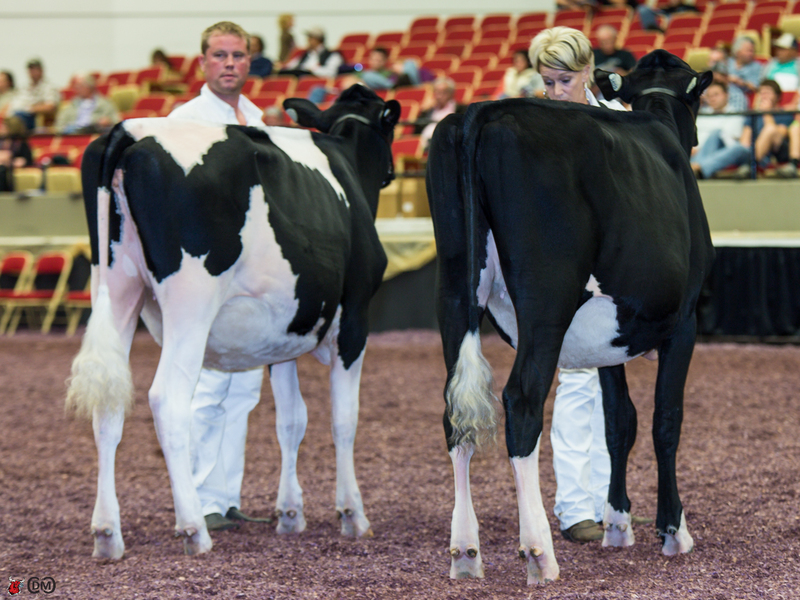 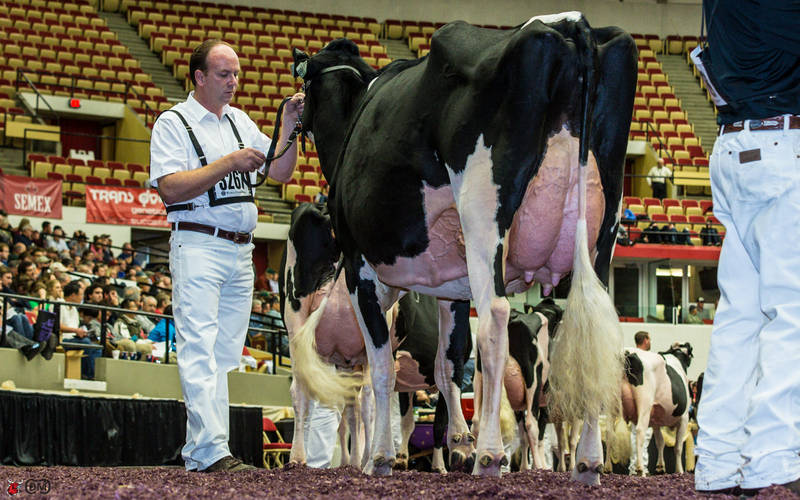 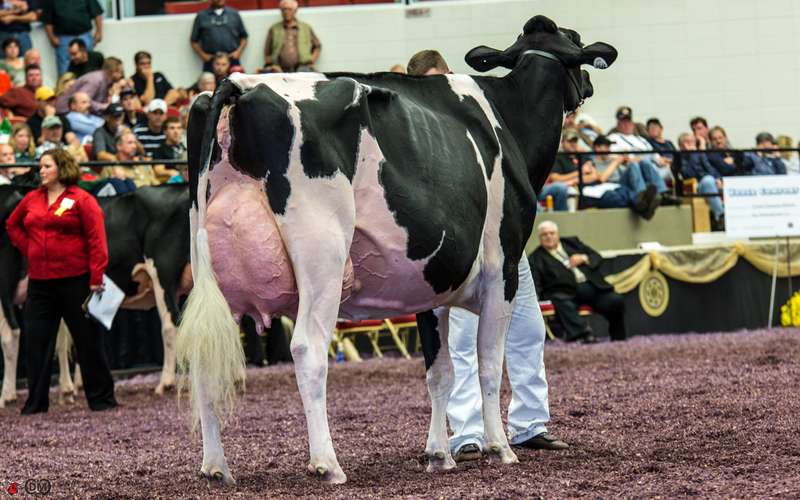 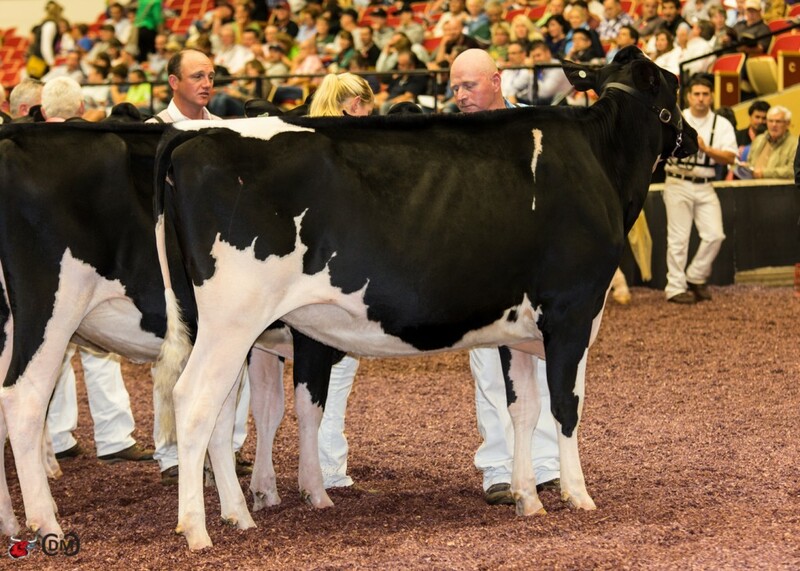 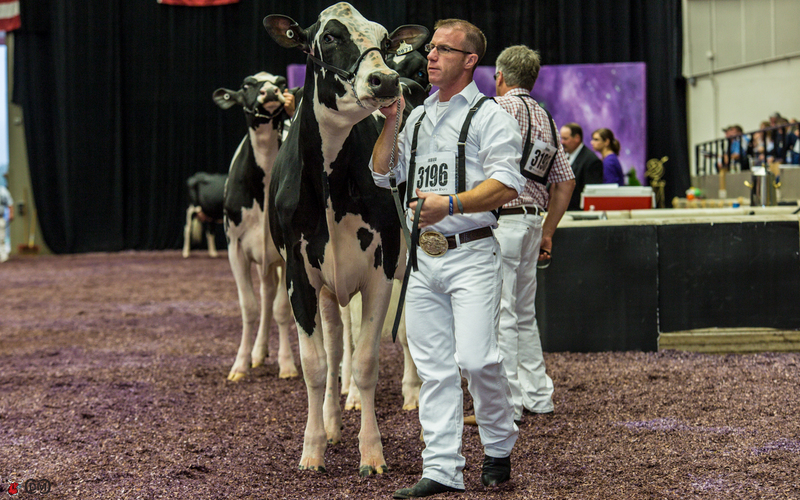 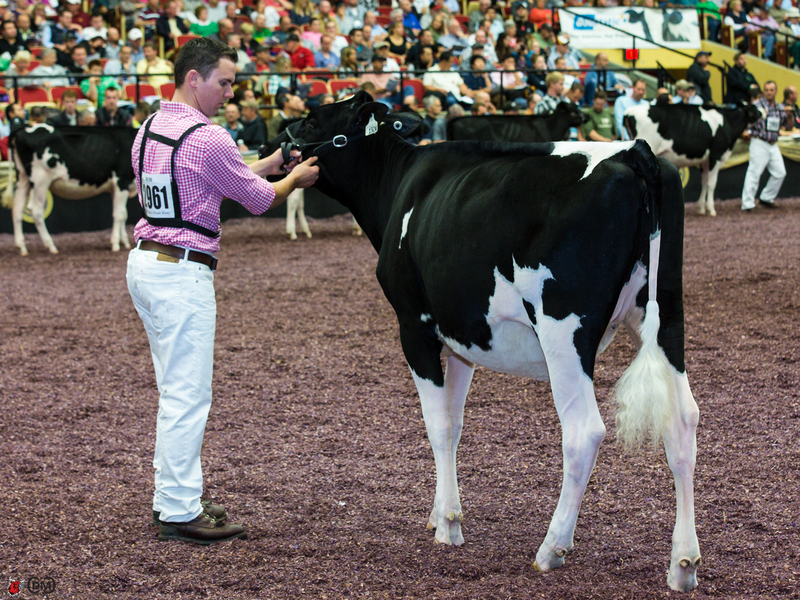 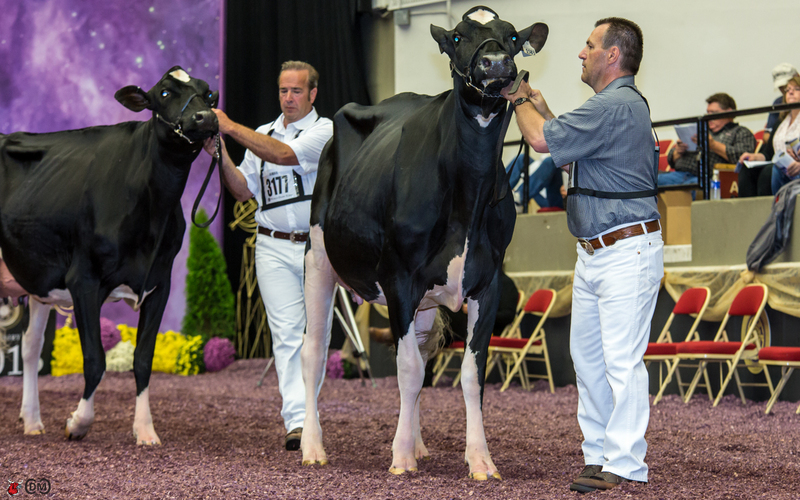 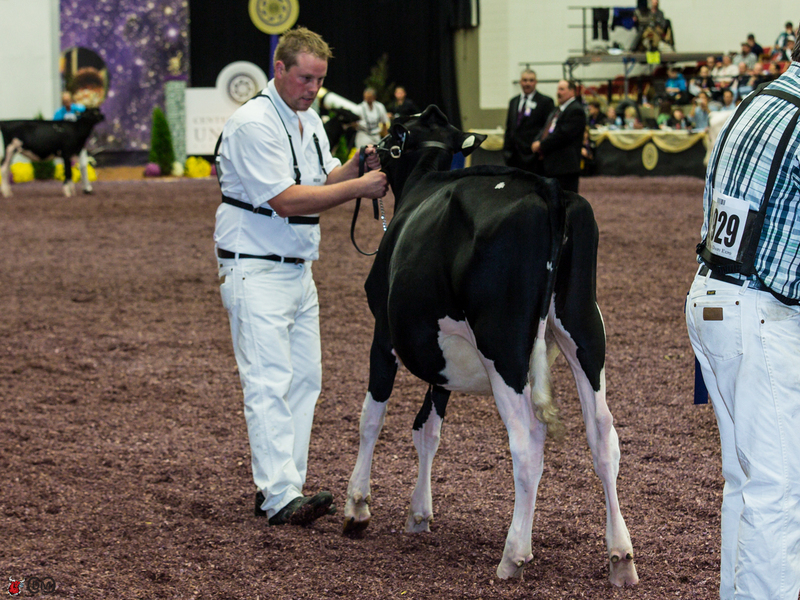 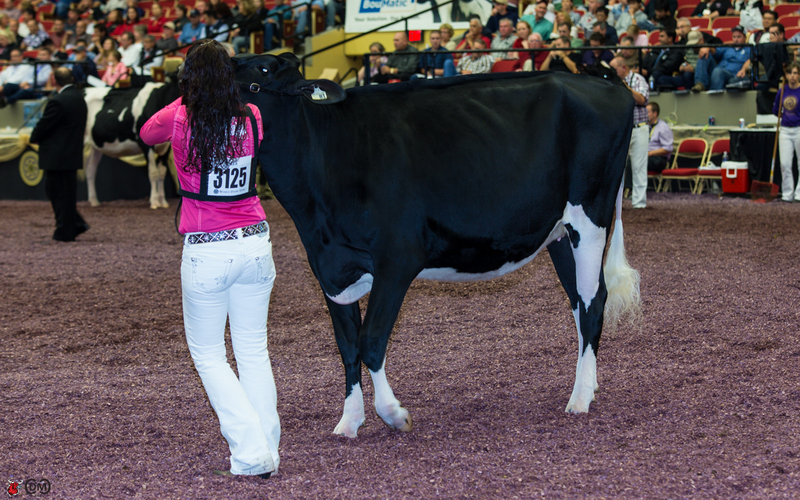 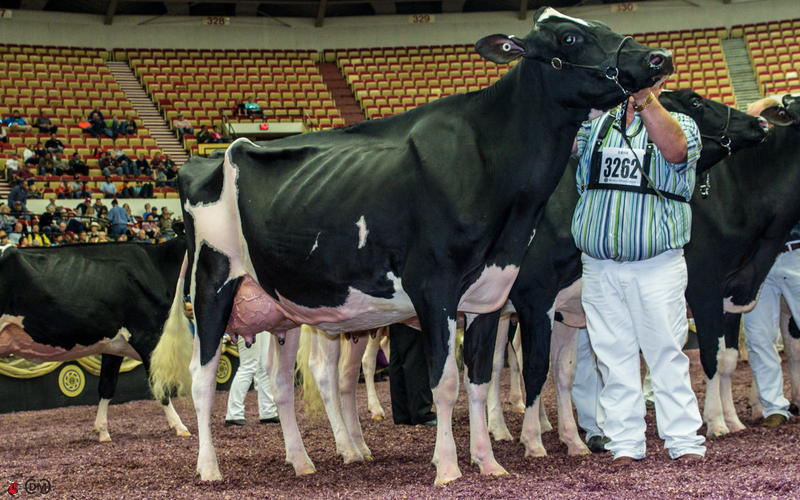 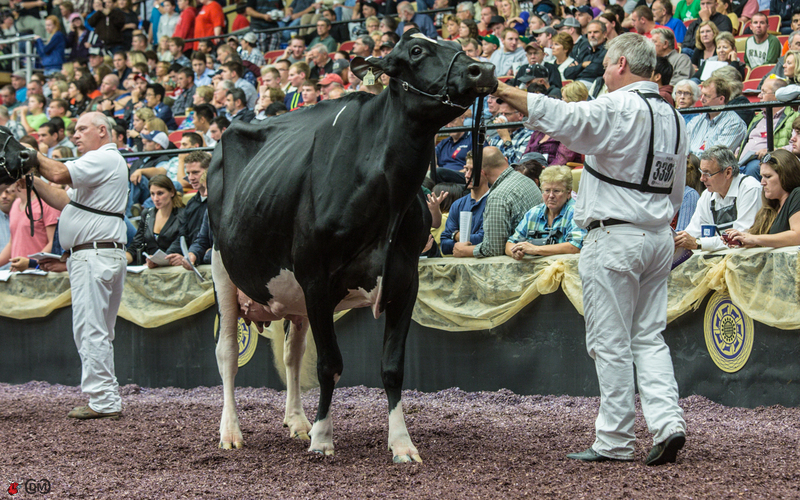 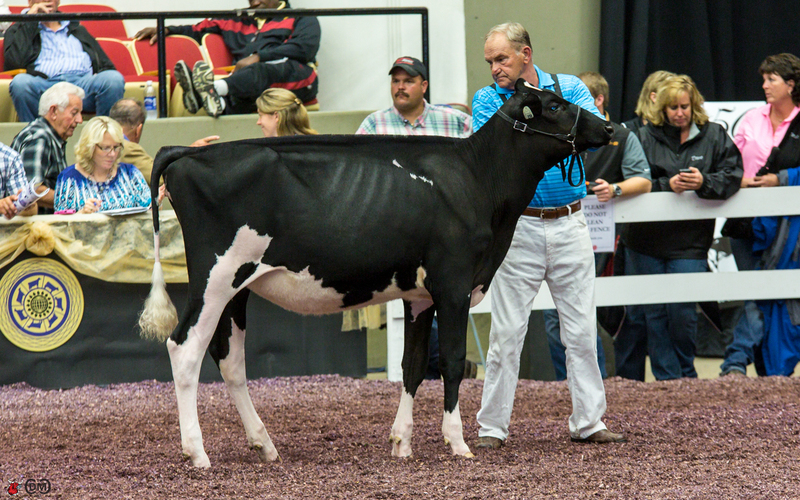 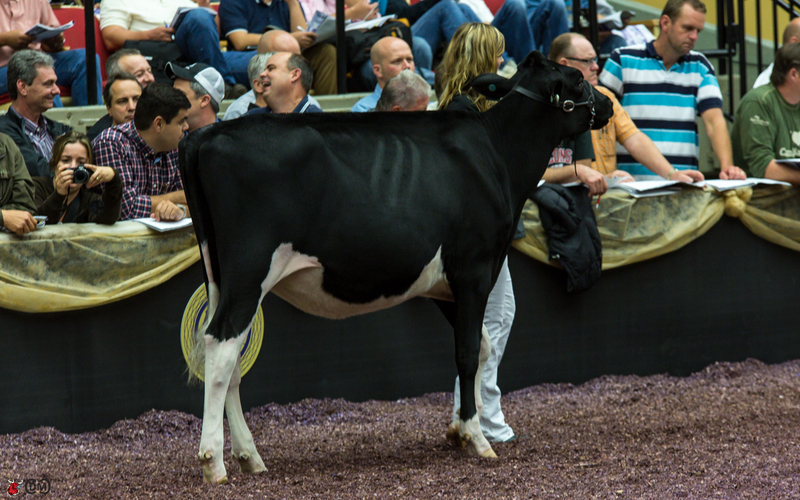 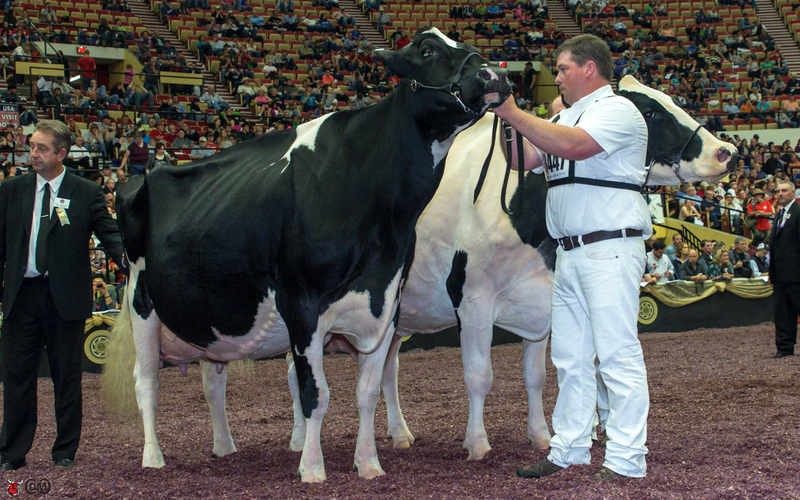 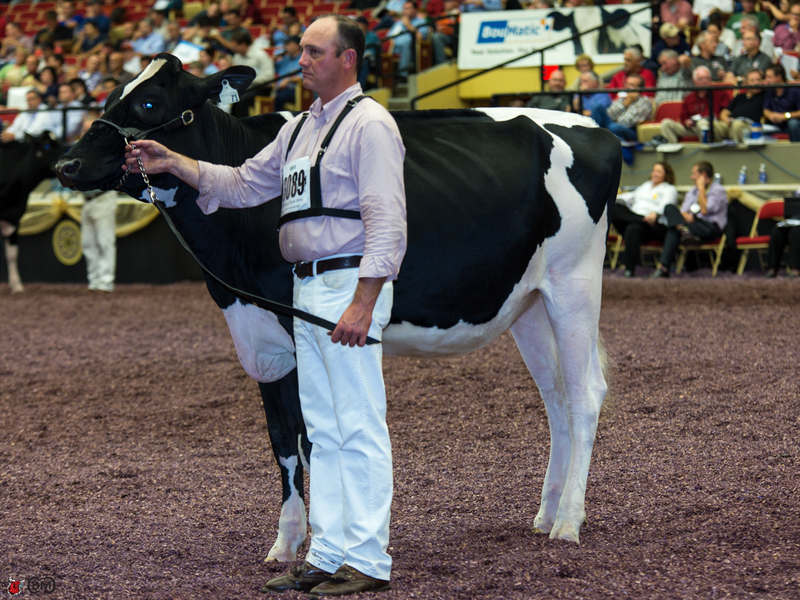 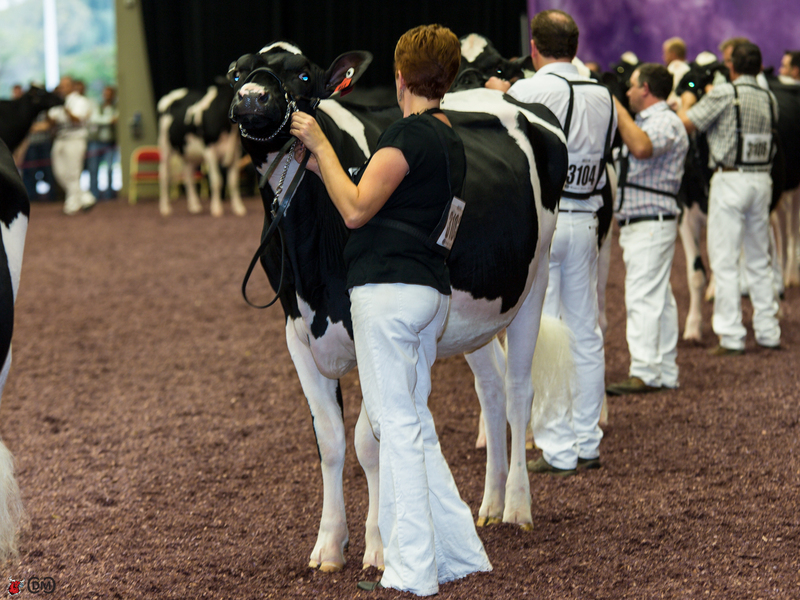 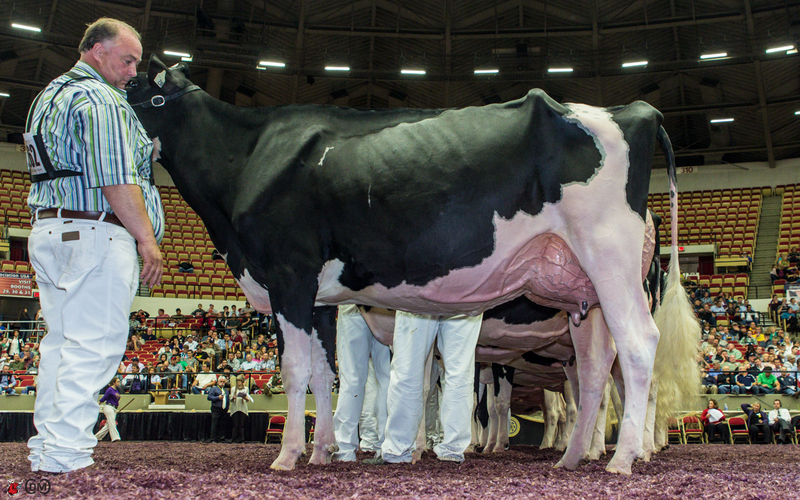 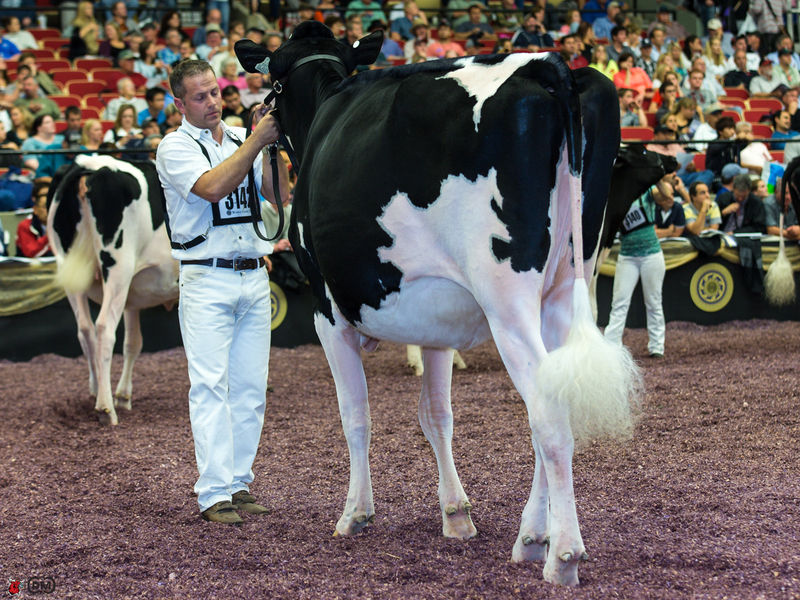 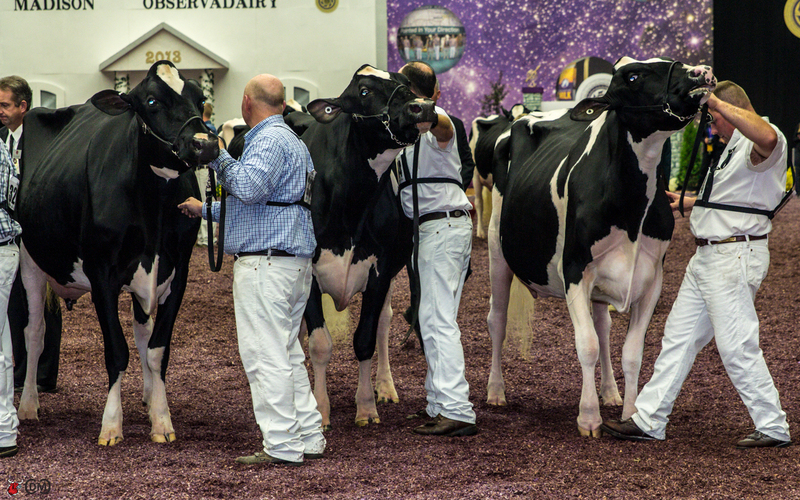 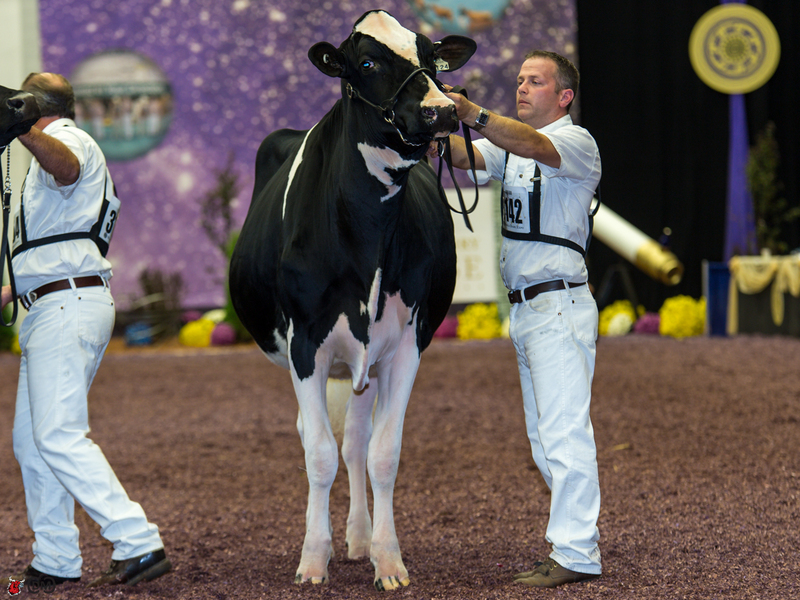 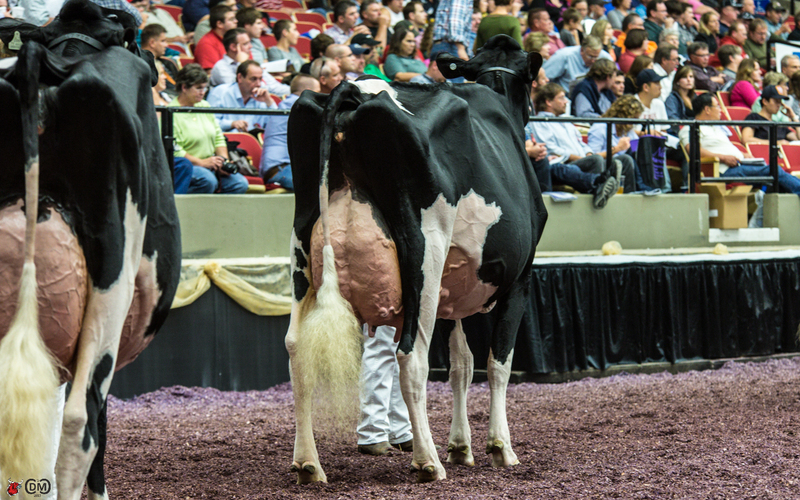 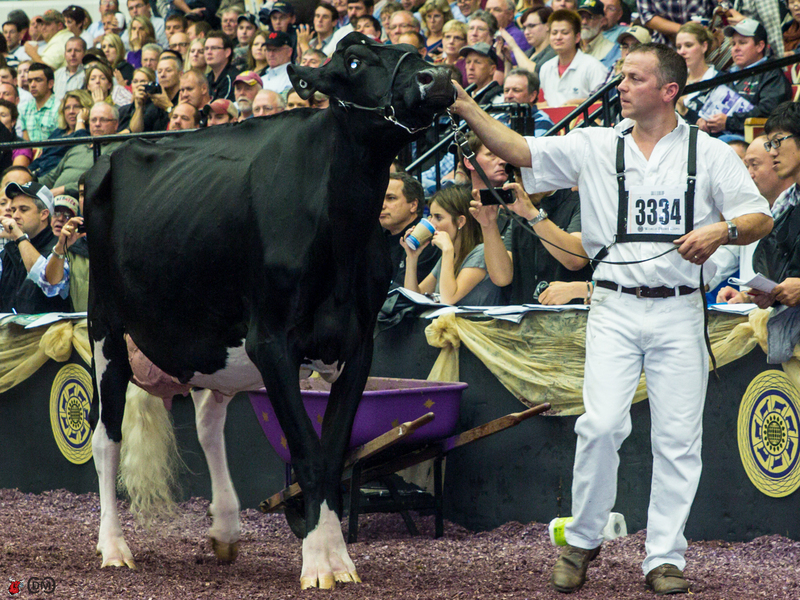 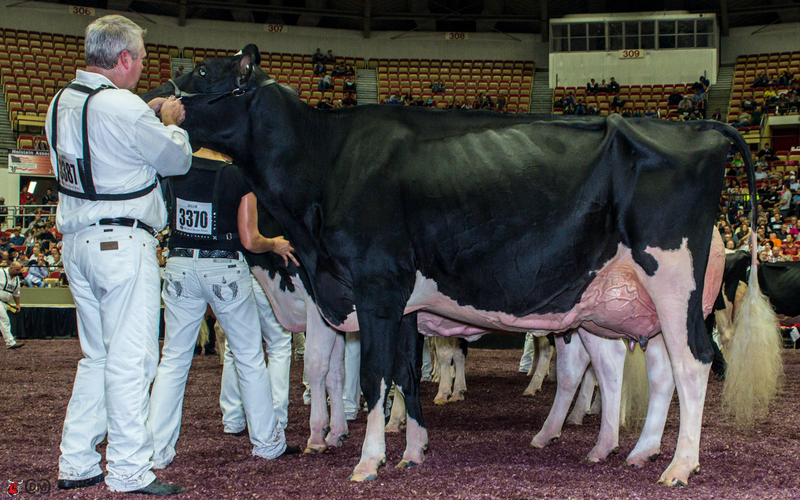 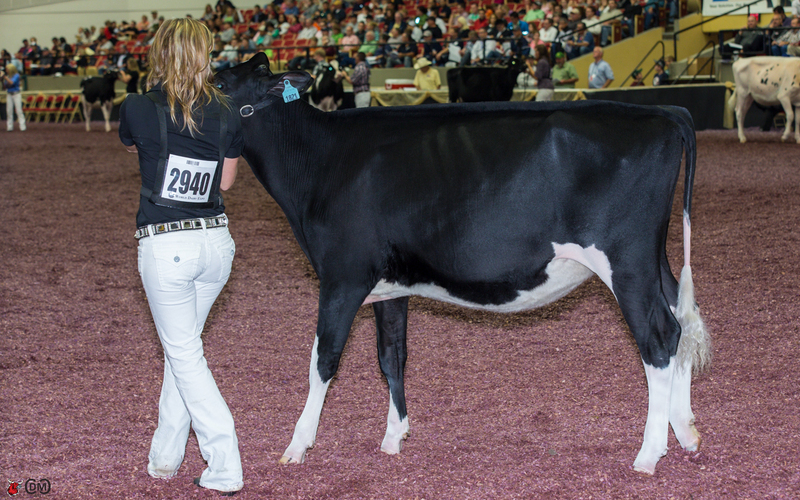 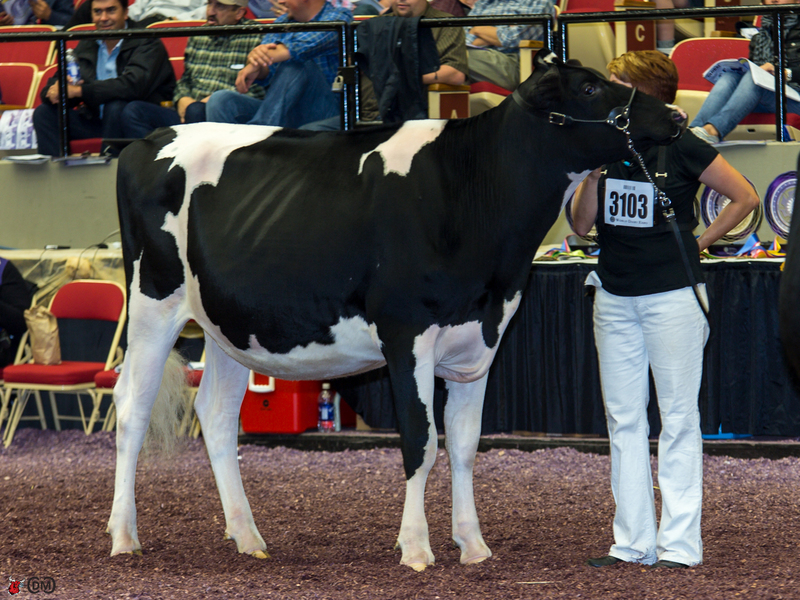 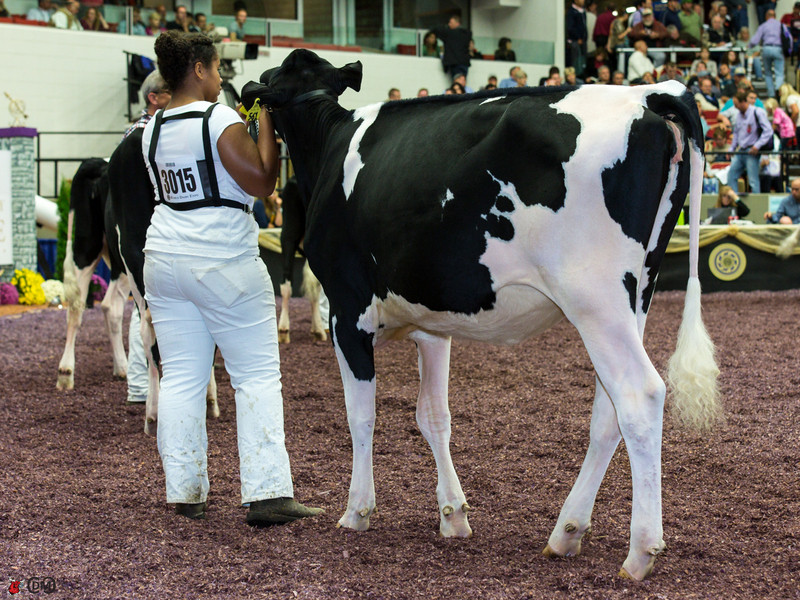 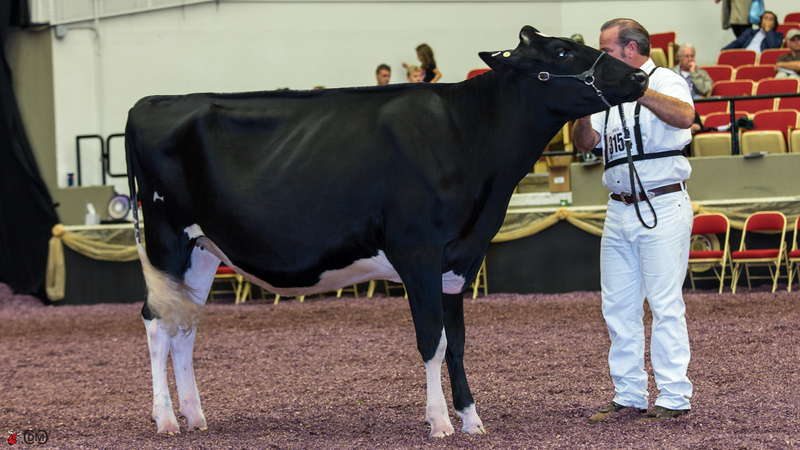 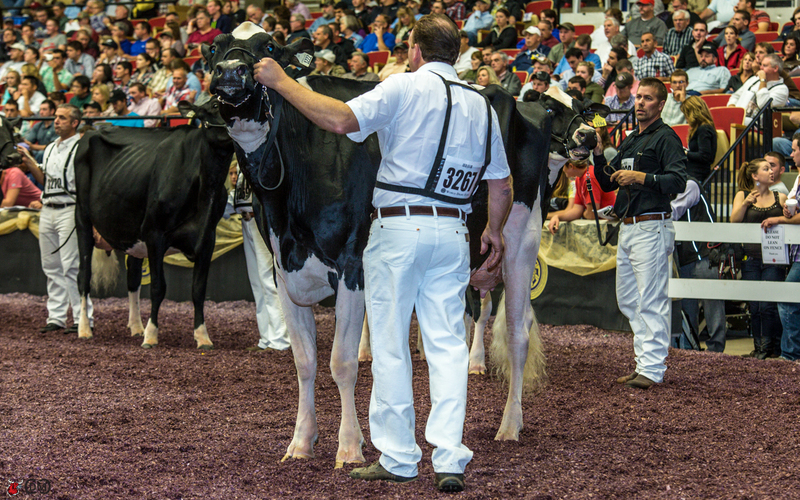 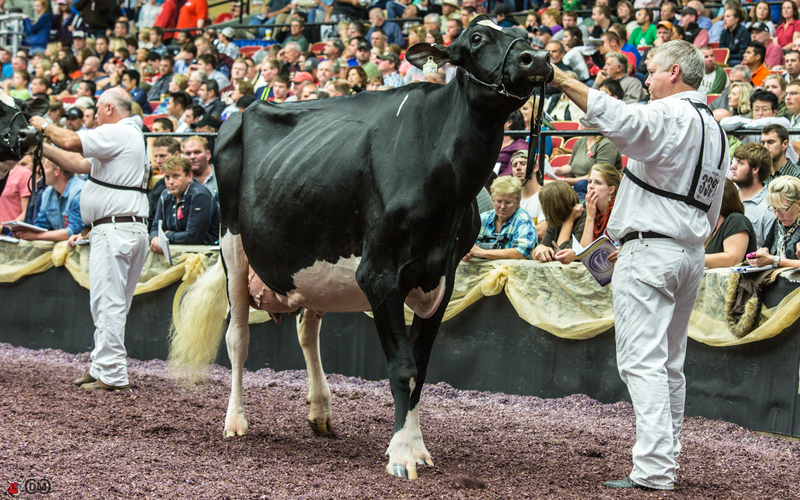 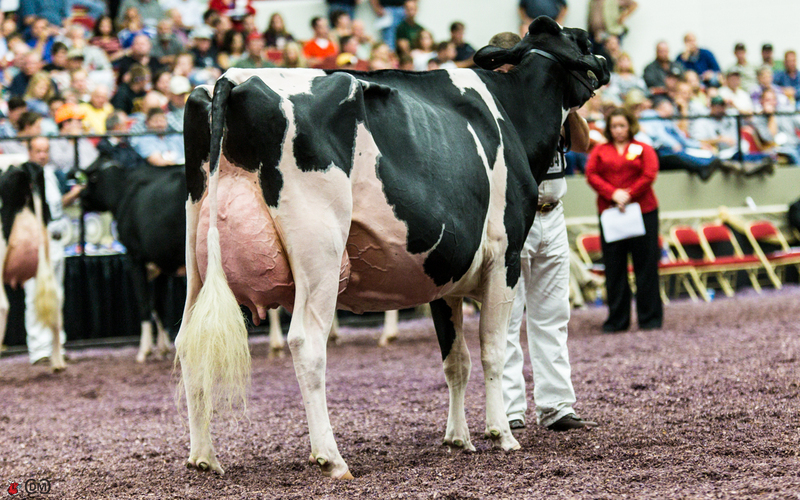 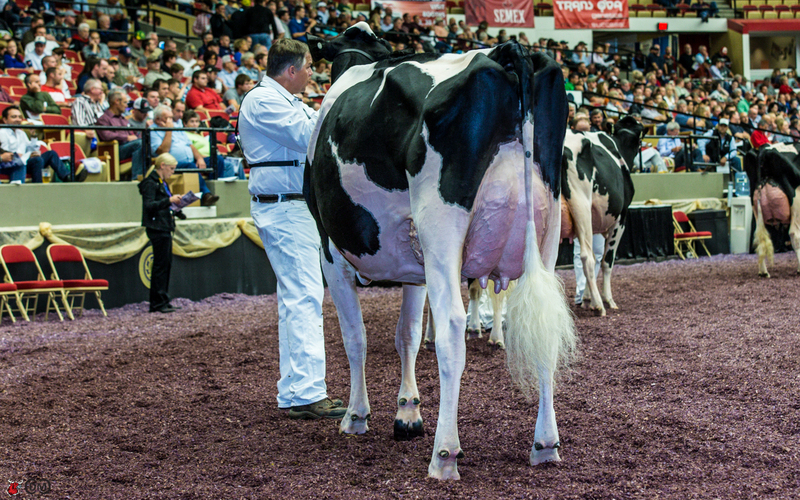 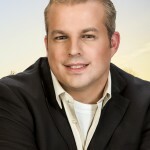 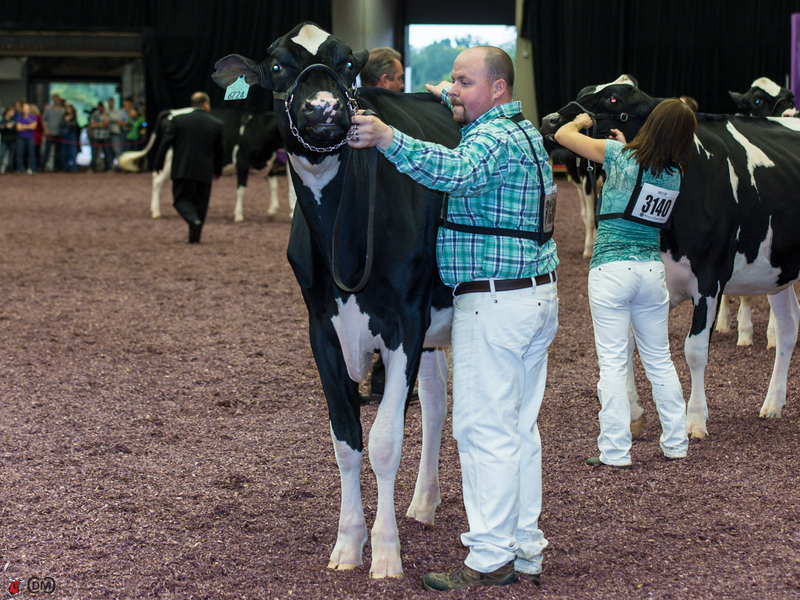 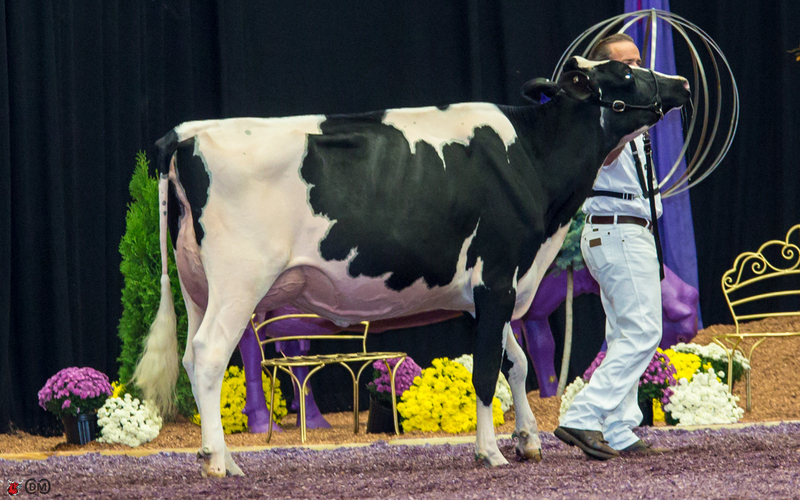 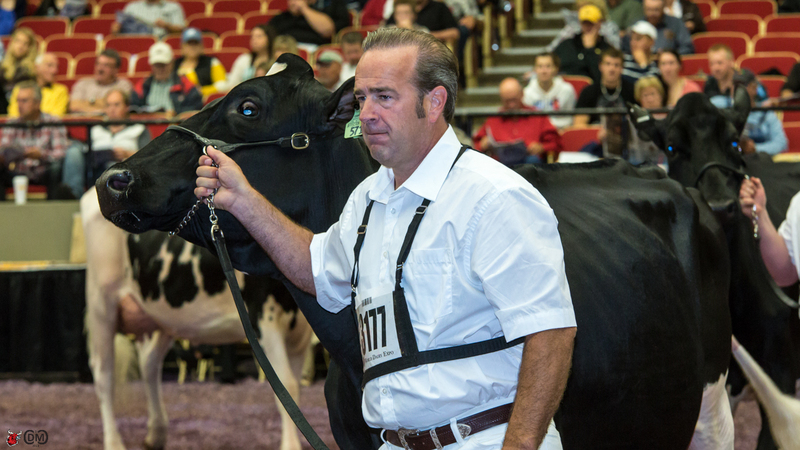 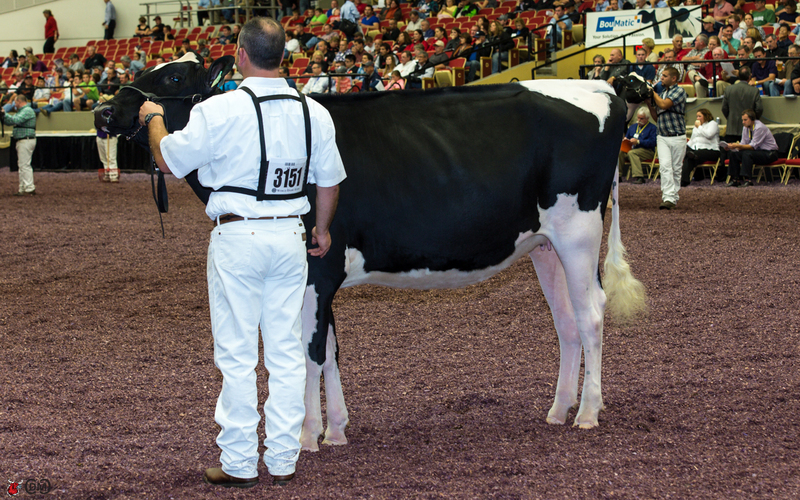 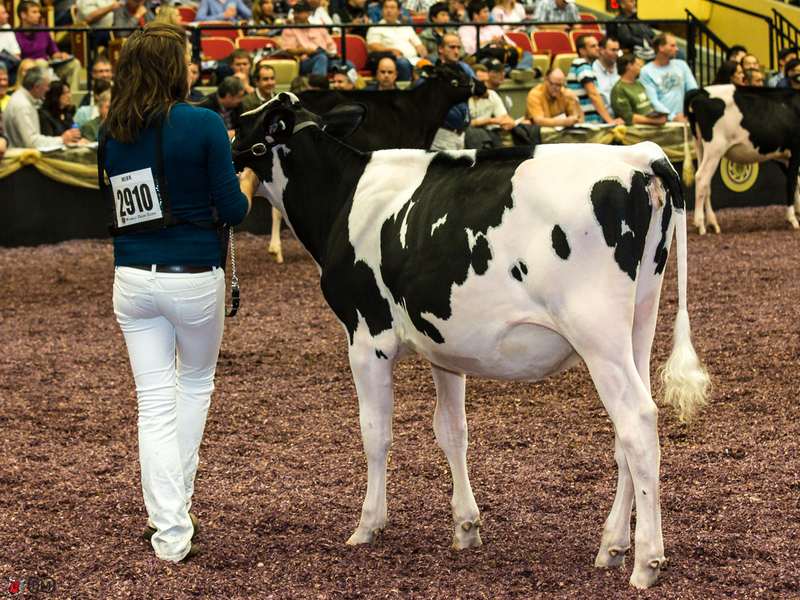 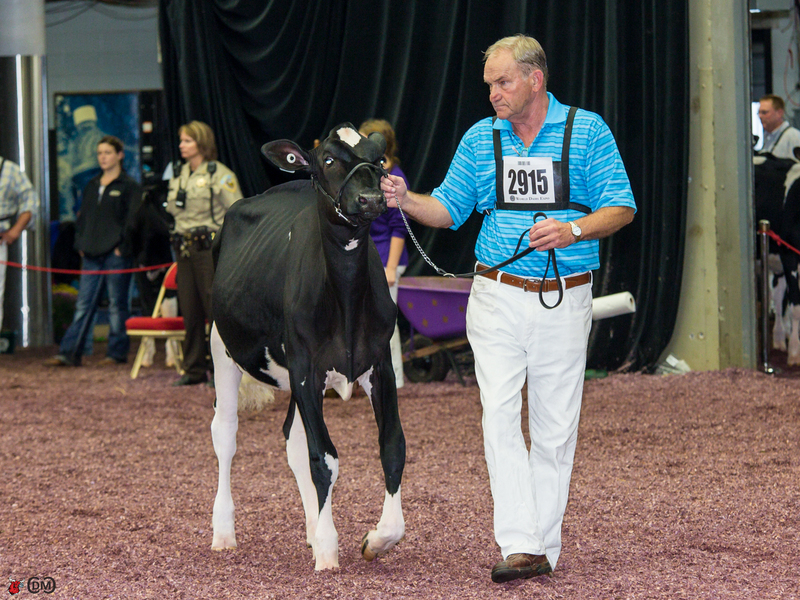 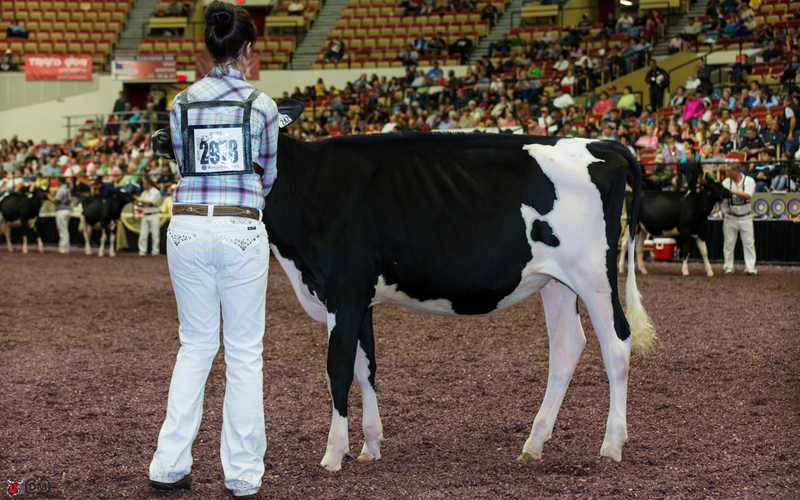 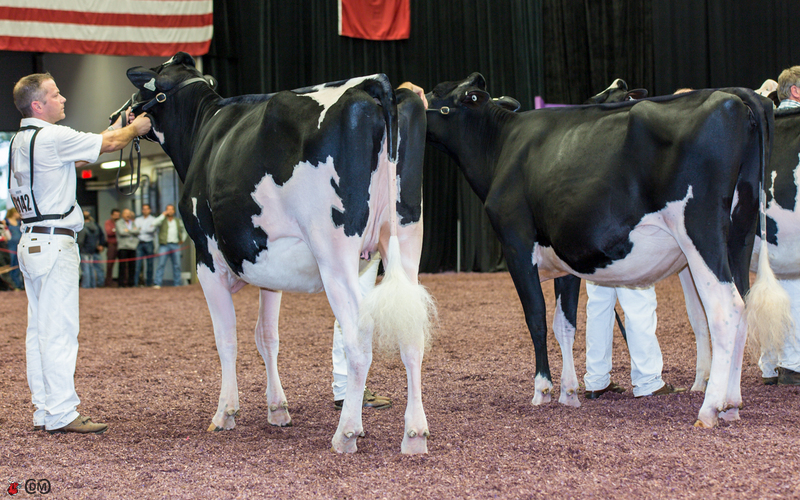 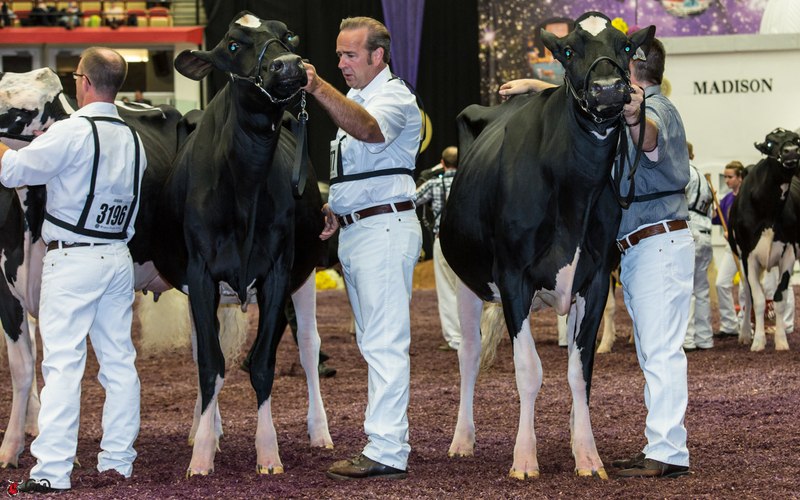 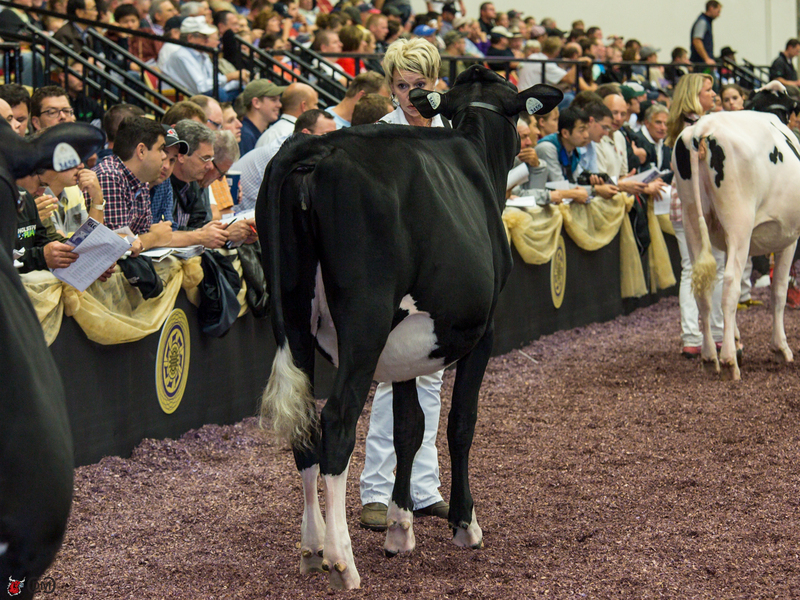 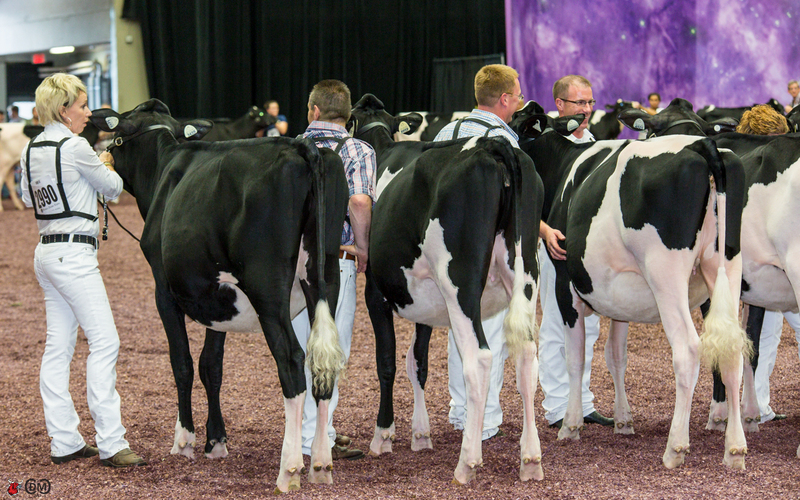 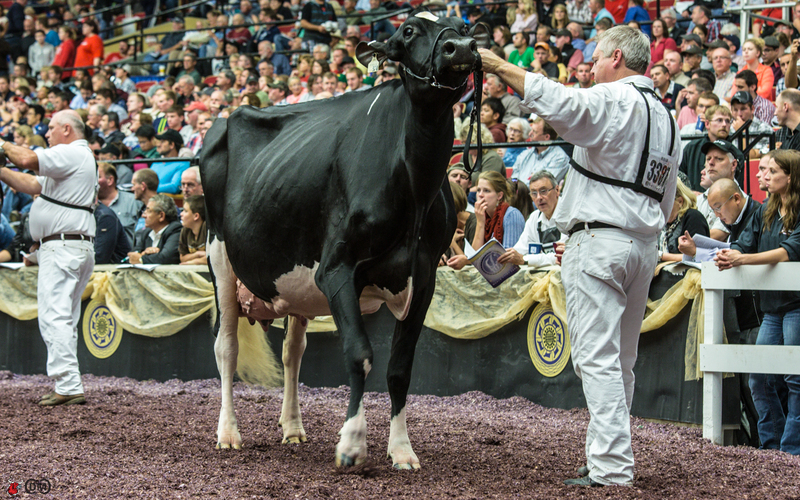 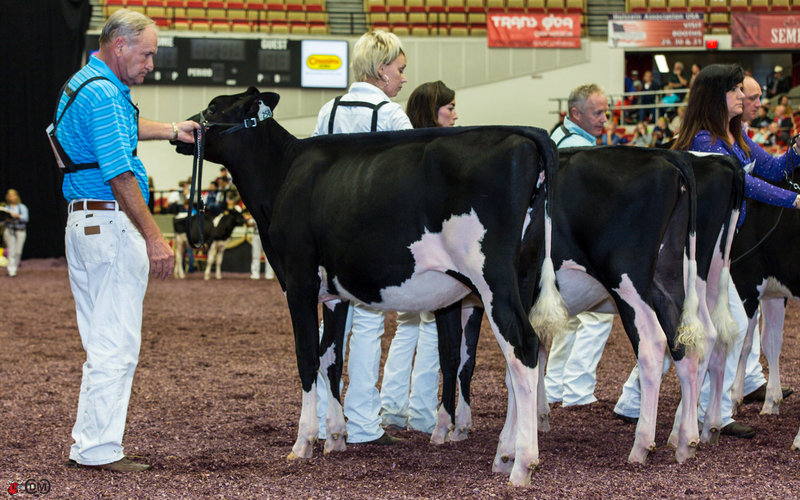 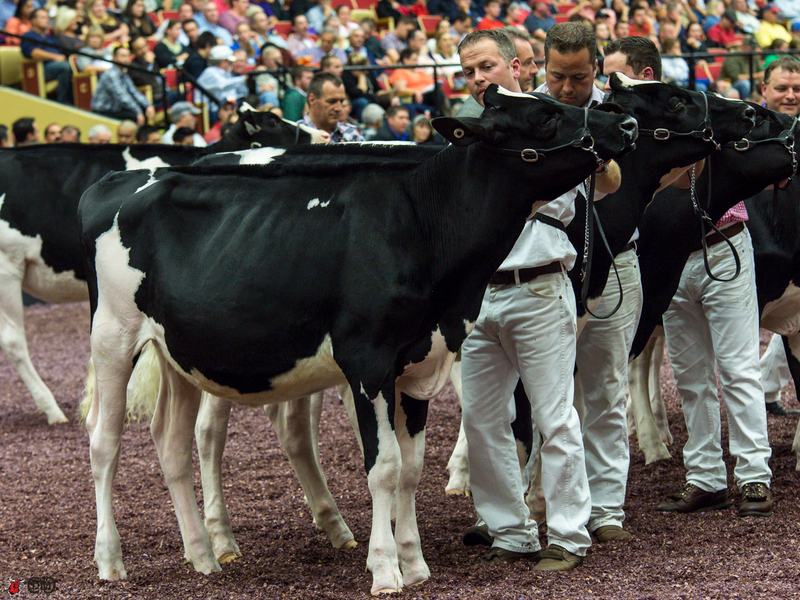 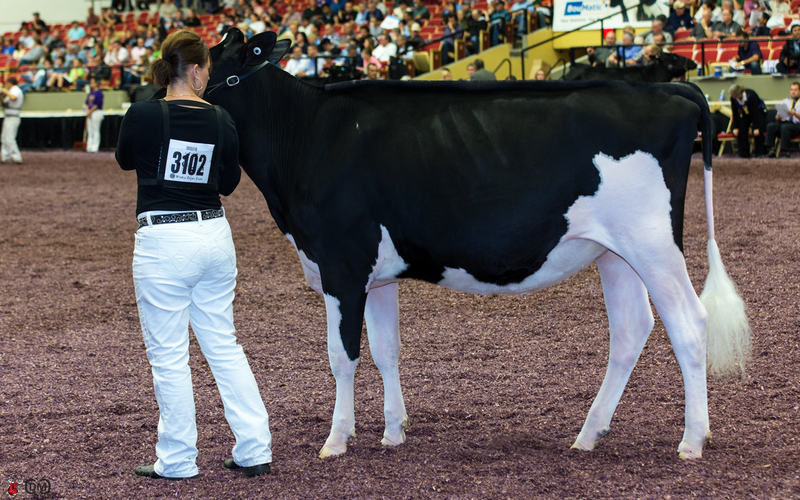 As we anticipated, the stars rose to the top (Read more: World Dairy Expo 2013 Holstein Show Preview – Everything You Need To Know To Get Ready For the Show). 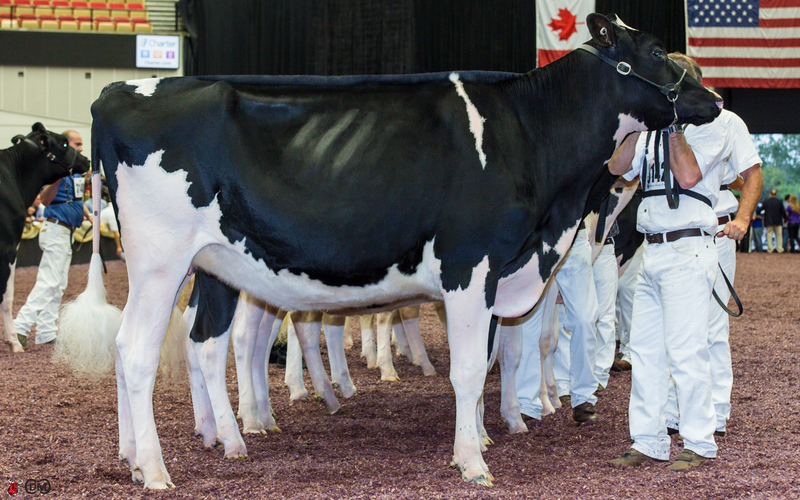 The biggest star on this day was Bonaccueil Maya Goldwyn, exhibited and owned by Ty-D Holsteins, Drolet & Fils, Ferme Jacobs, A. 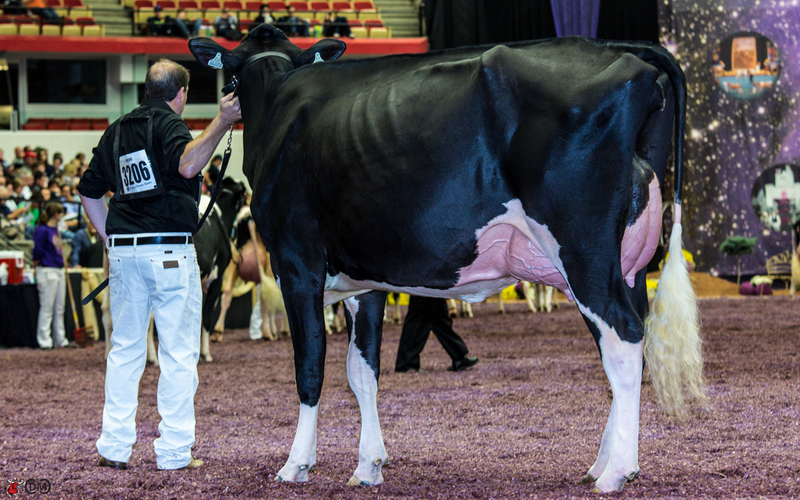 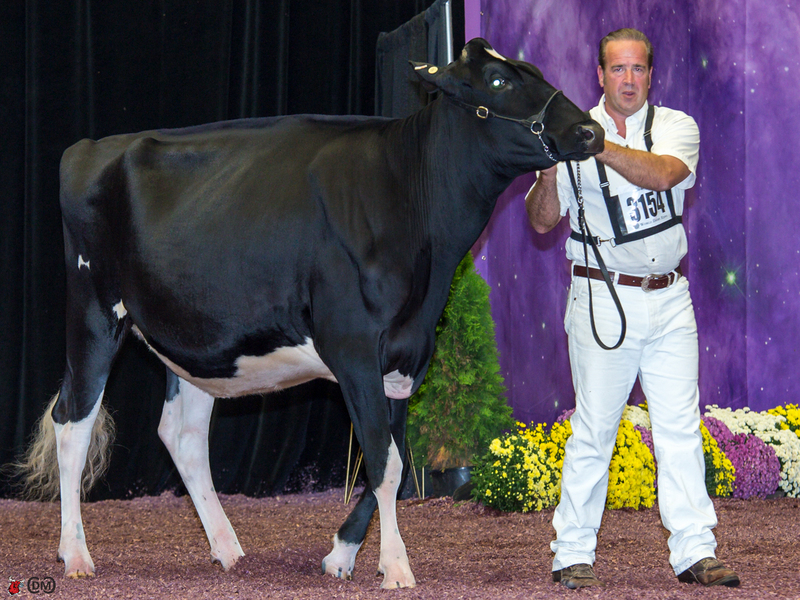 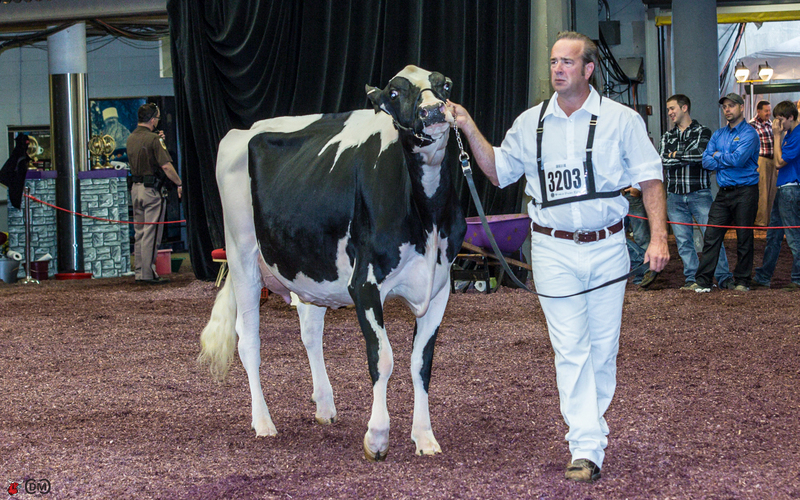 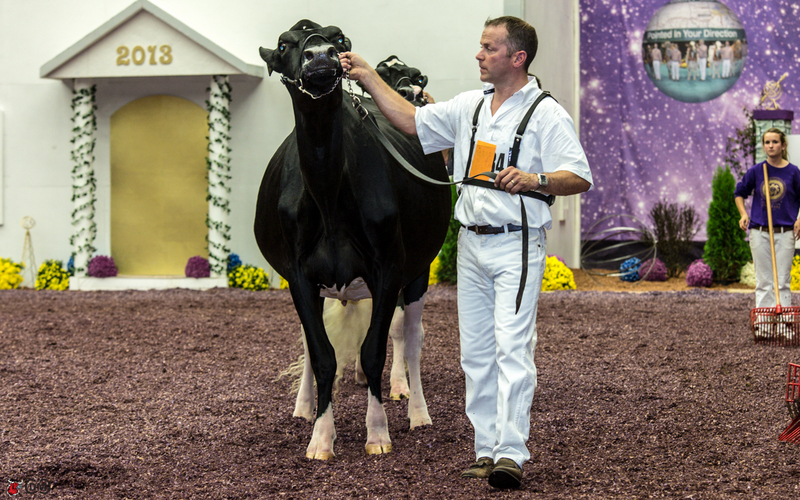 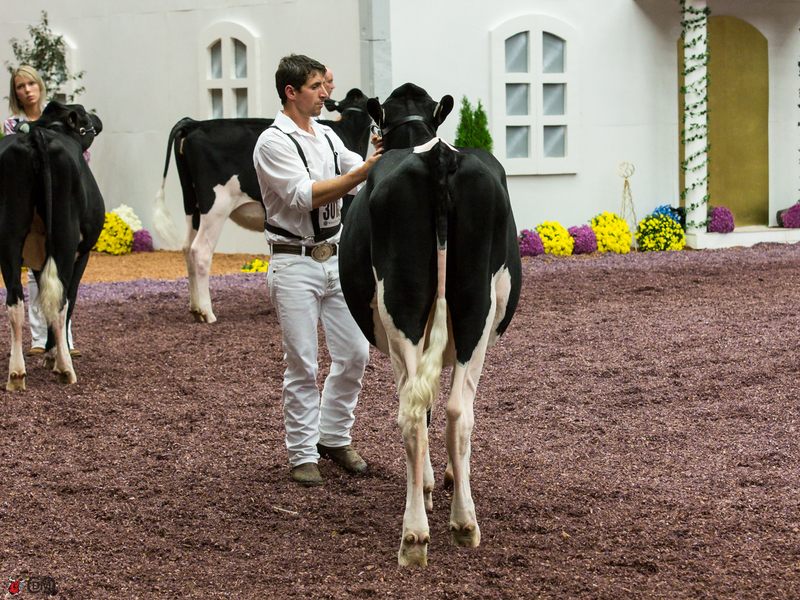 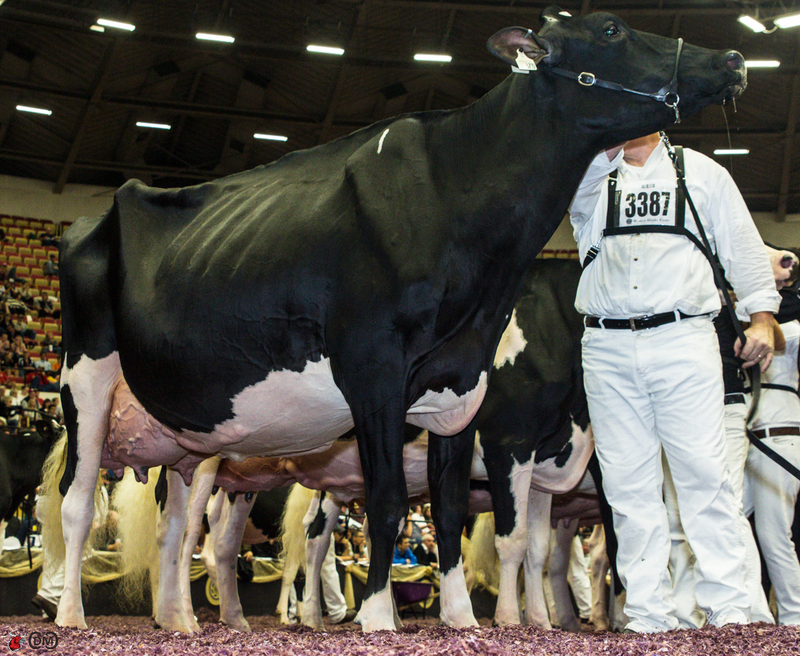 & R. Boulet, Inc, who was crowned Grand and Senior Champion of the 2013 International Holstein Show. 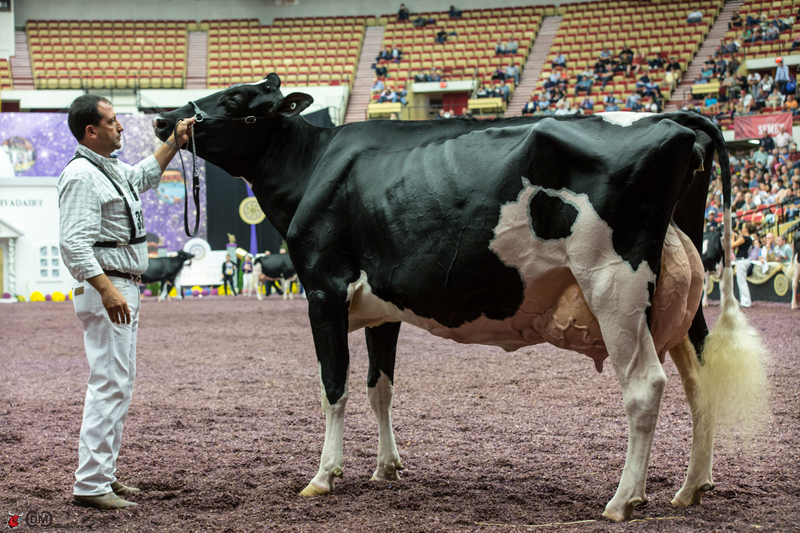 Maya was the winner of the Six-Year-Old & Older Cow class, as well as the Champion Bred and Owned cow and received the Udder Comfort $1,000 Cash Award. 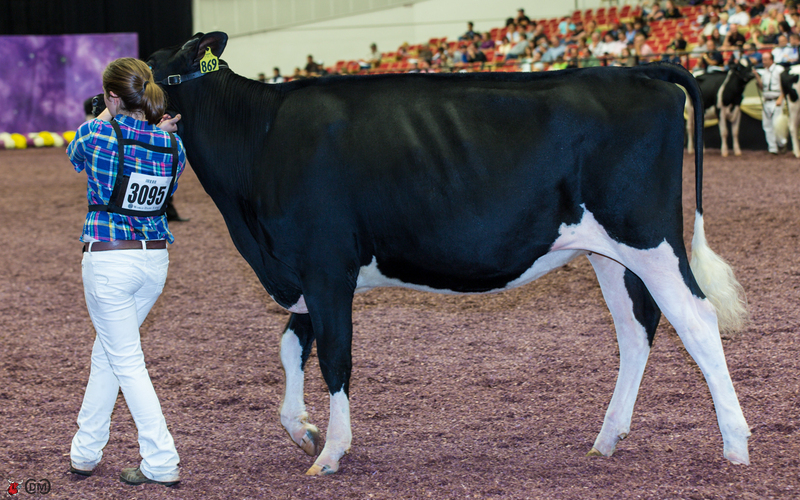 Maya’s biggest challenge came from last year’s Intermediate Champion, Cookview Goldwyn Monique who this year received the Reserve Grand Champion honors for the second consecutive year at the International Holstein Show. 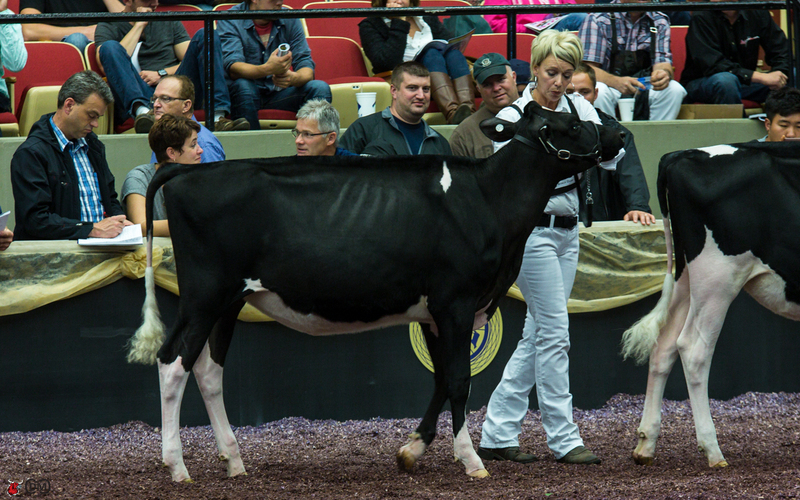 Monique was exhibited by Jeff Butler, Joe & Amber Price, of Chebanse, Ill. Monique also took home the title of Reserve Senior Champion and Four-Year-Old class winner. 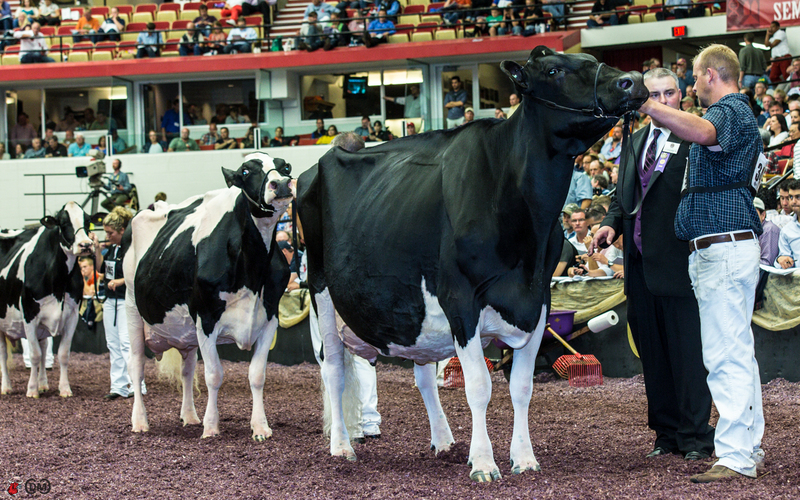 Showing that her upset at the All-American show was just a blip was Butz-Butler Gold Barbara-ET, Dr. 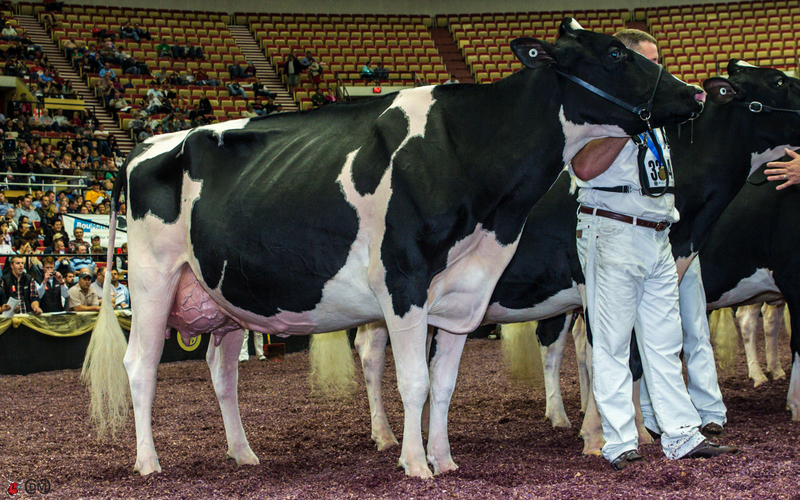 Owned by Matt Iager, Ernest Kueffner, River Valley Dairy & St. Jacobs, Boonsboro, Md. 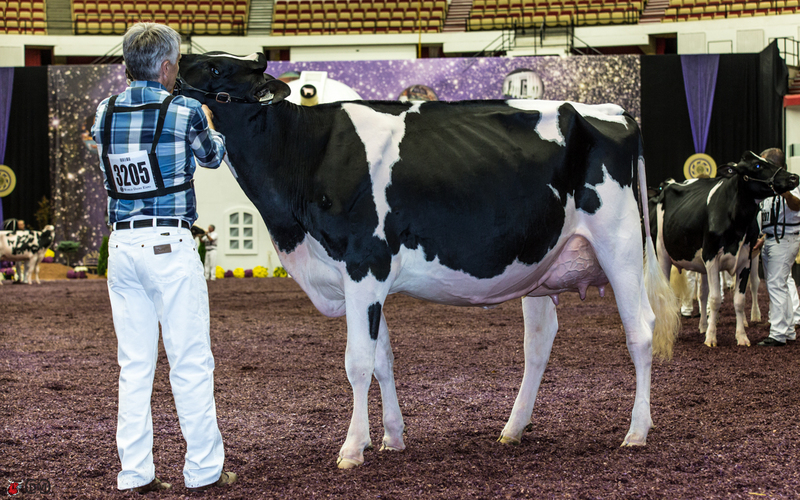 Barbara was named 1st Senior Three Year old and Intermediate Champion. 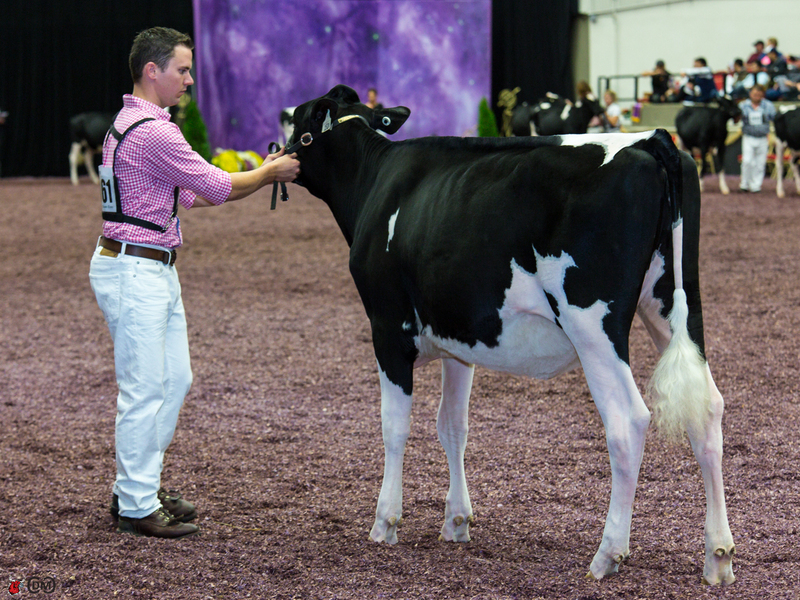 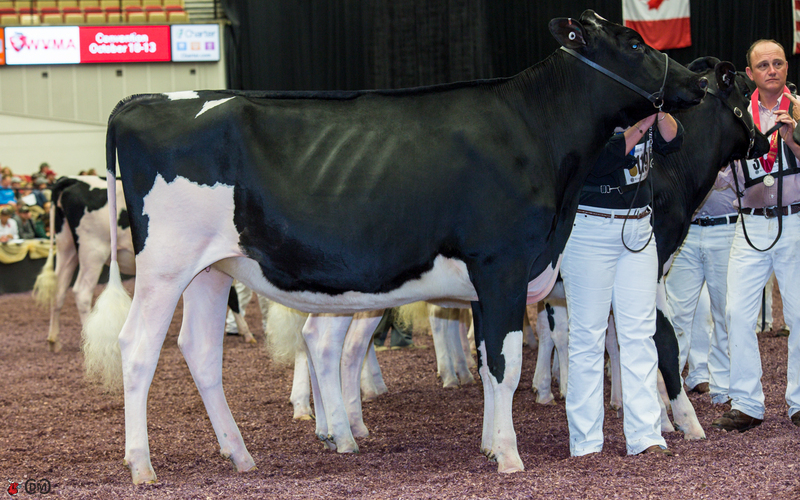 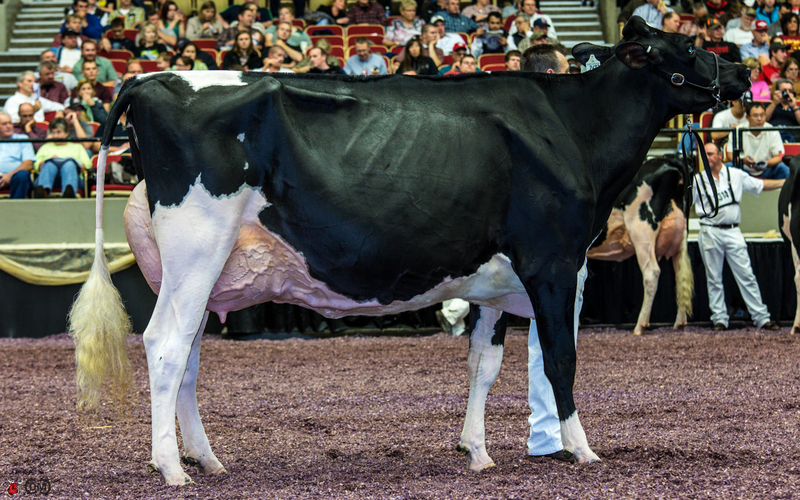 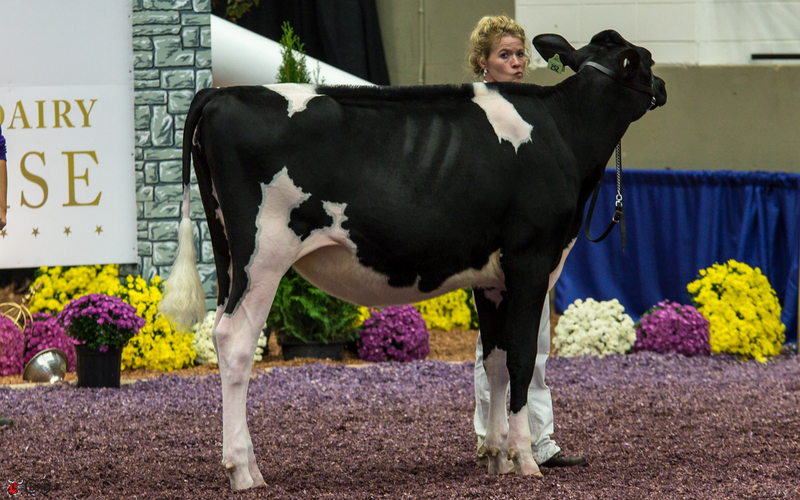 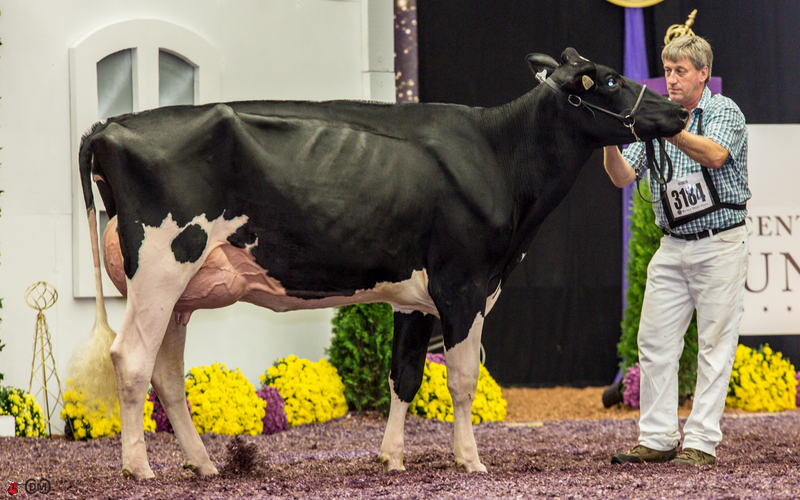 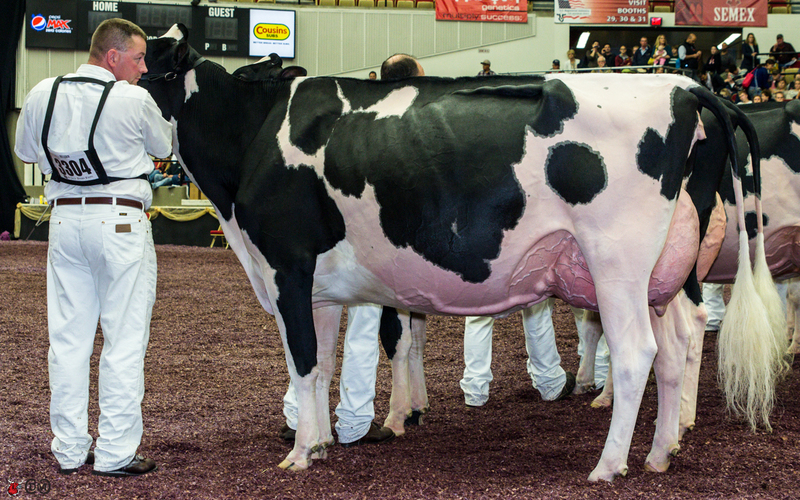 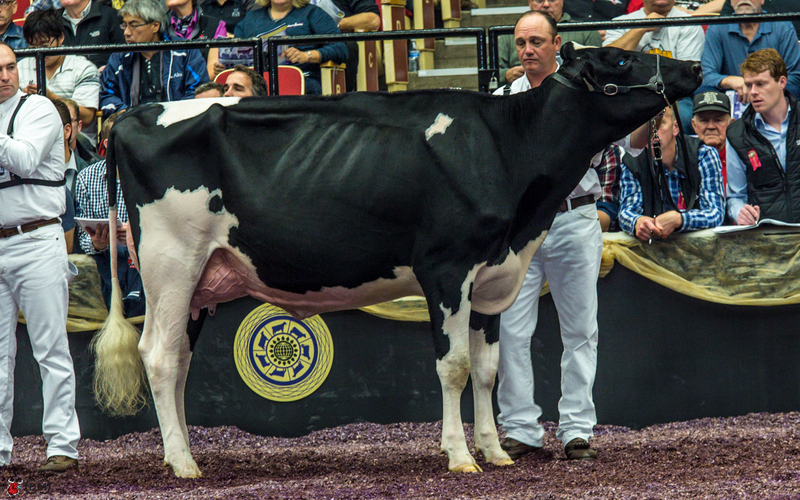 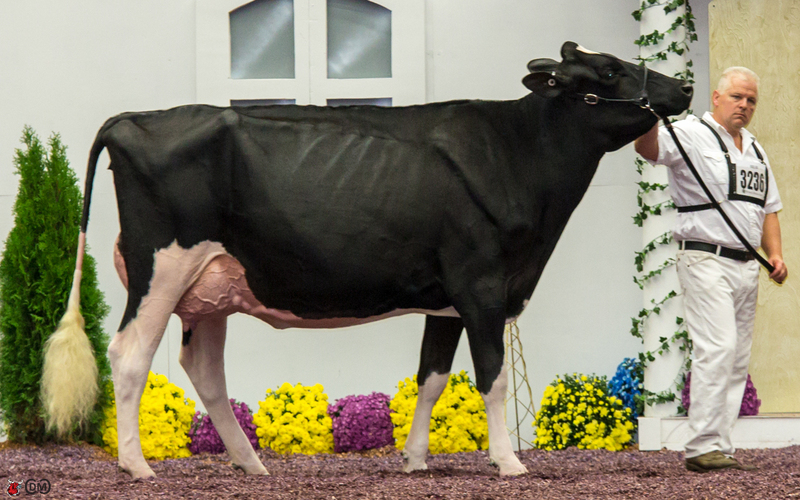 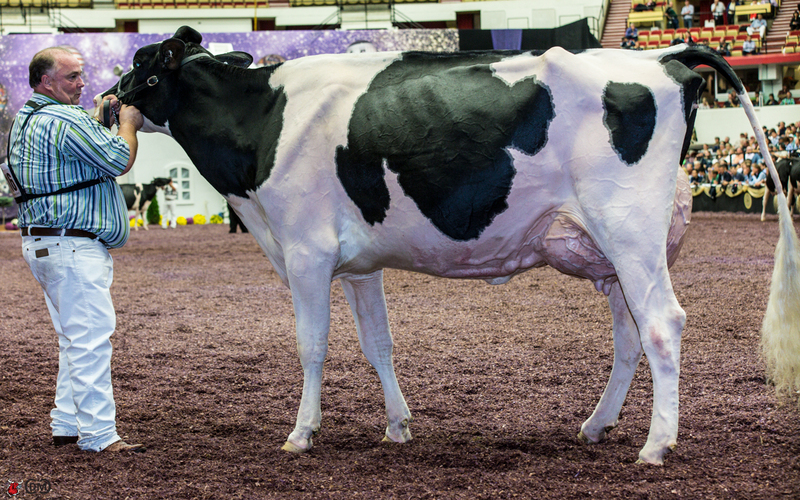 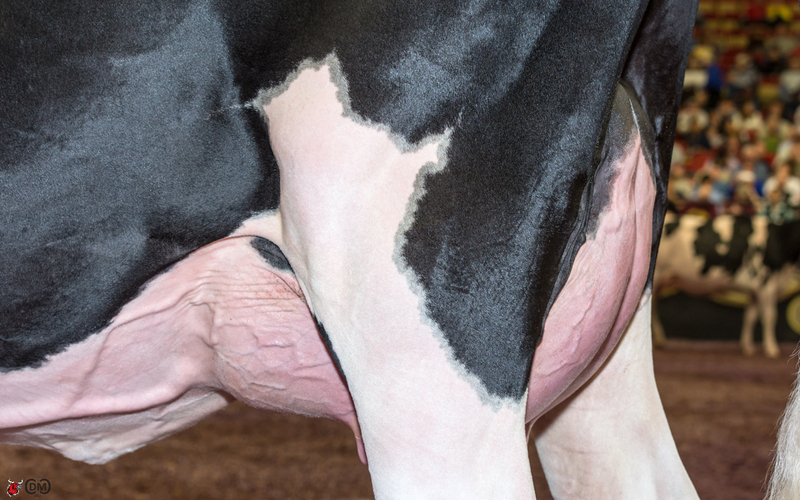 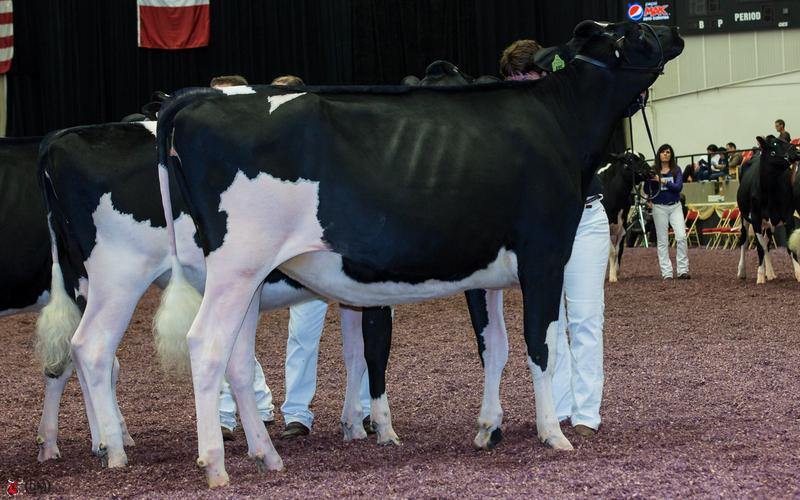 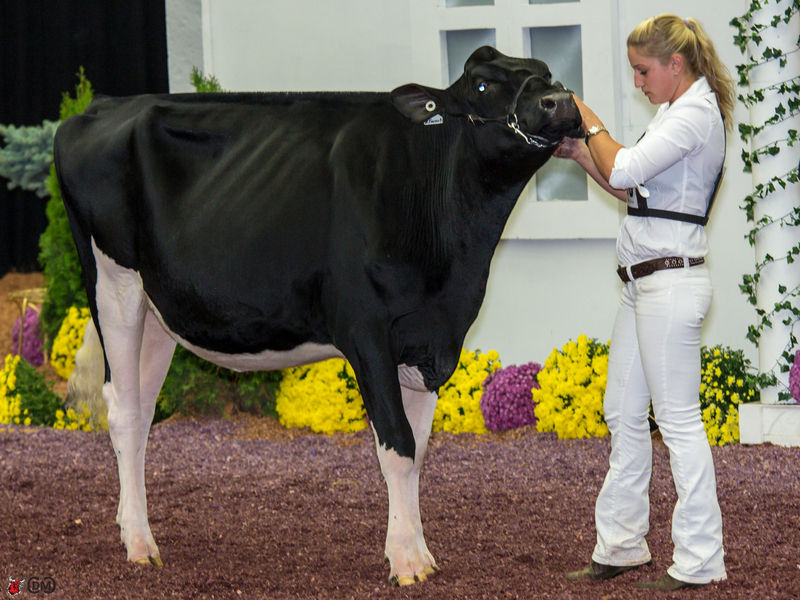 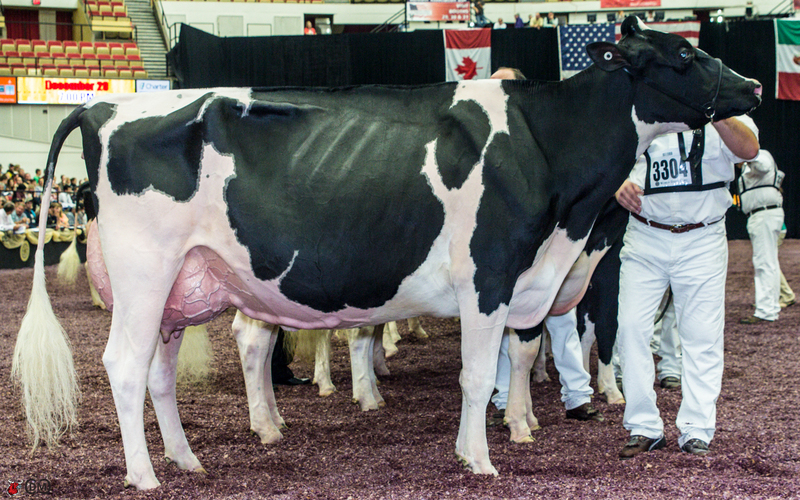 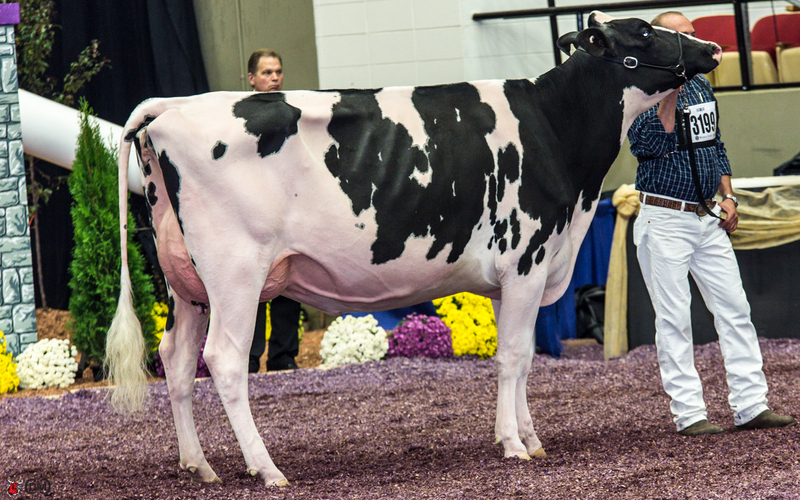 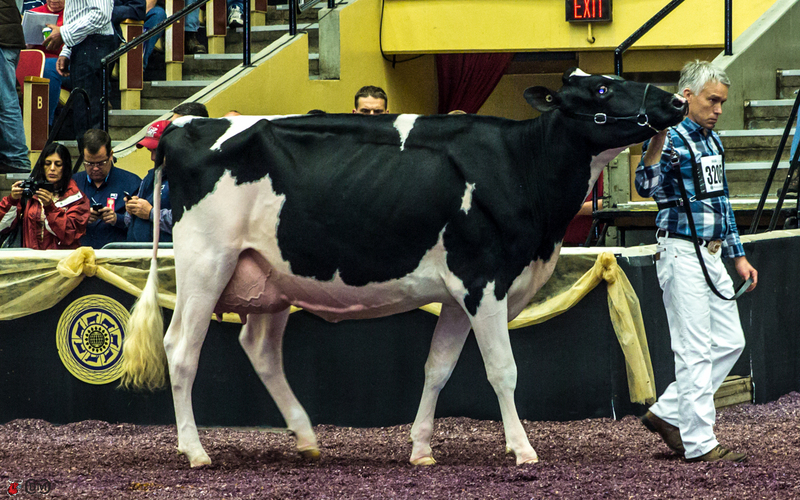 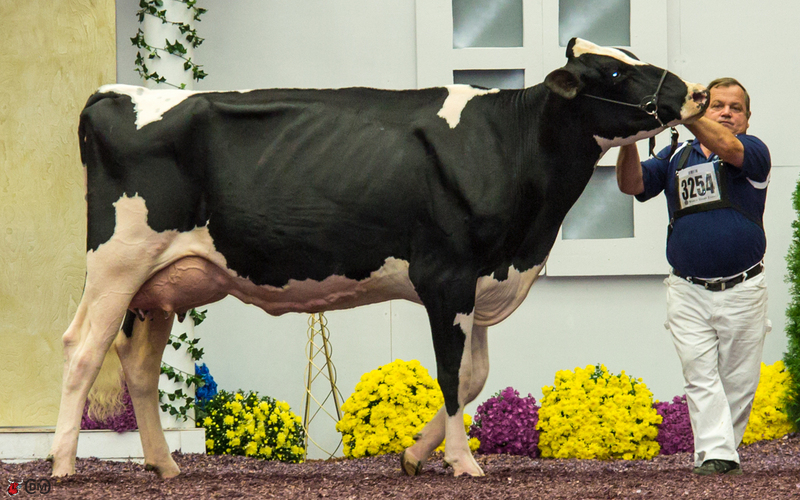 Reserve Intermediate Champion Female was the 2nd place Senior Three Year old BKB Goldwyn Amenda exhibited by Westcoast Holsteins, Chilliwack, British Columbia. 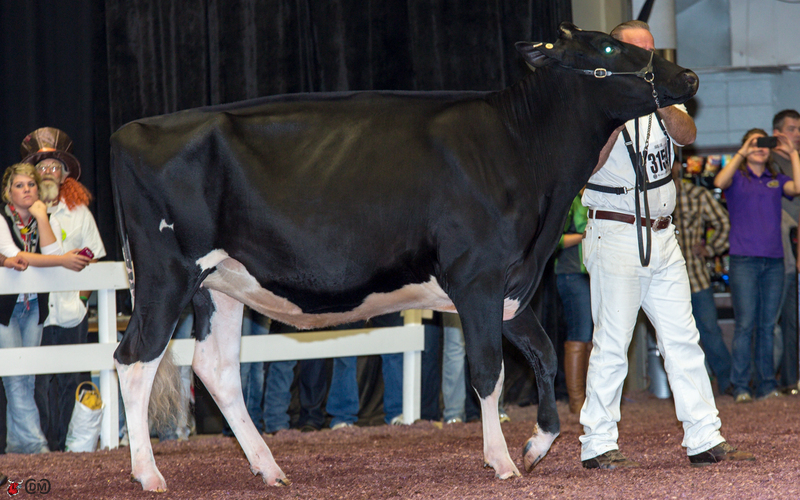 Junior Champion Female honours went to the 1st place Spring Yearling Calf, Cameron Ridge Atwood Beauty exhibited by Gene Iager and Chris & Jennifer Hill, Thurmont, Md. 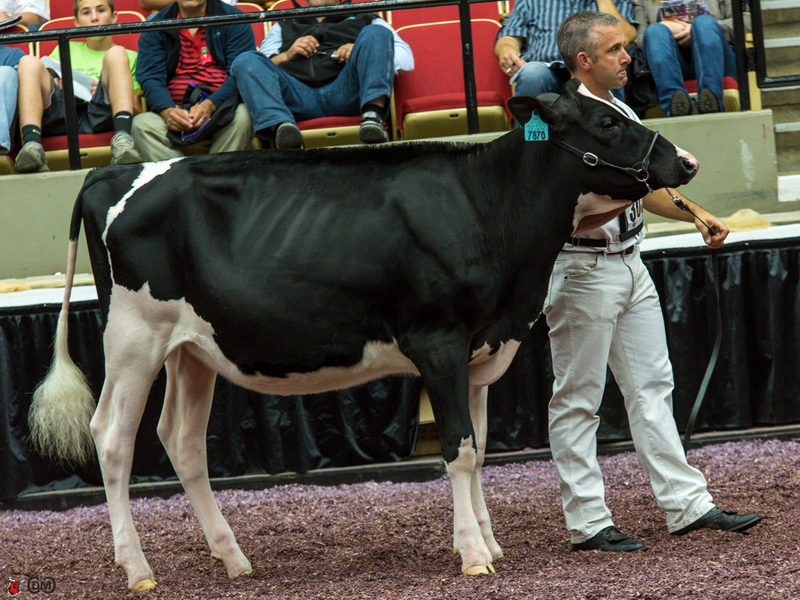 This extremely open deep ribbed heifer was followed by the 1st place Fall Yearling Female, Fanico Reginald Marty, exhibited by Co-Vale, A. Eaton, S. Morrill, Conroy, Pasada, Garcia, Preble, N.Y.
Ferme Jacobs of Cap-Sante, Quebec takes home the honor of Premier Breeder for the third year in a row, and won titles for Best Three Females for both the Junior and Open classes. 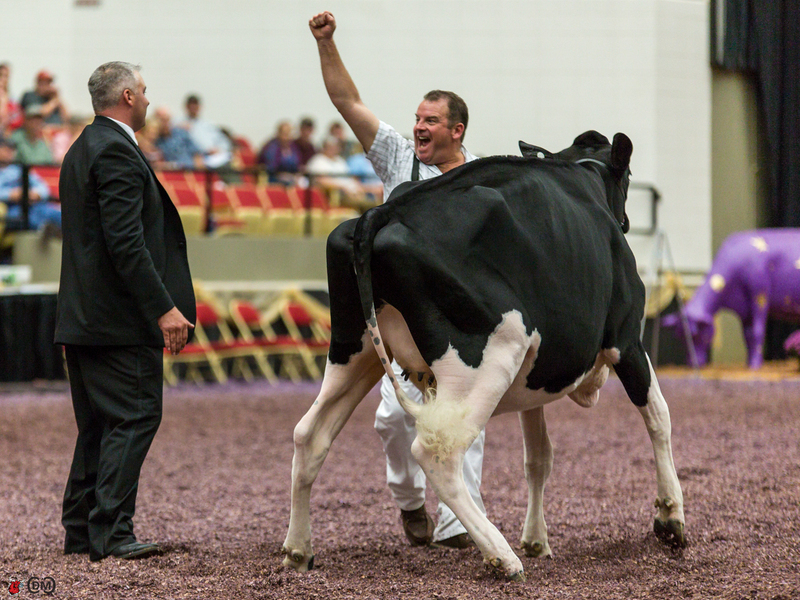 Milksource Genetics of Kaukauna, Wis. has been awarded the honor of Premier Exhibitor. 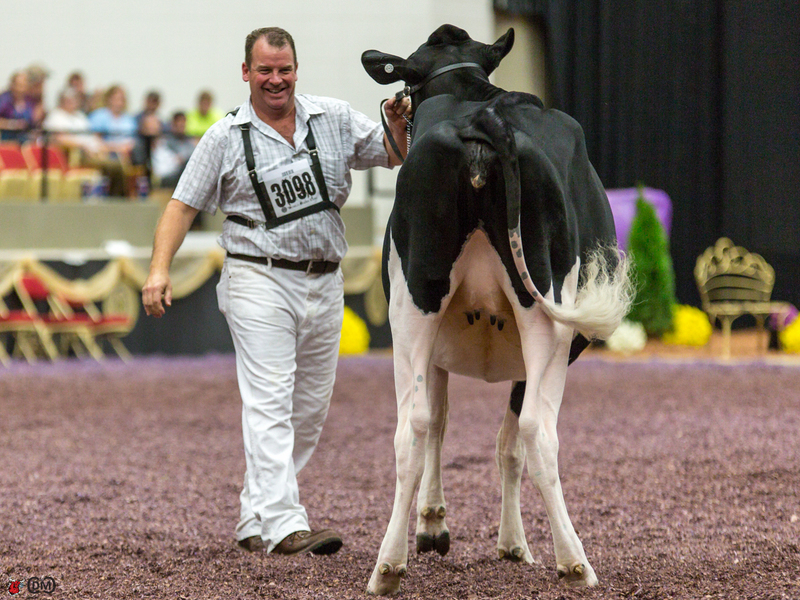 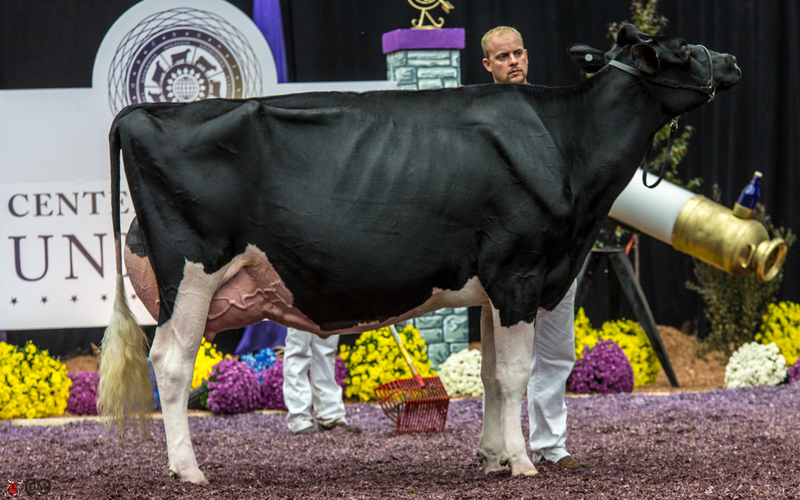 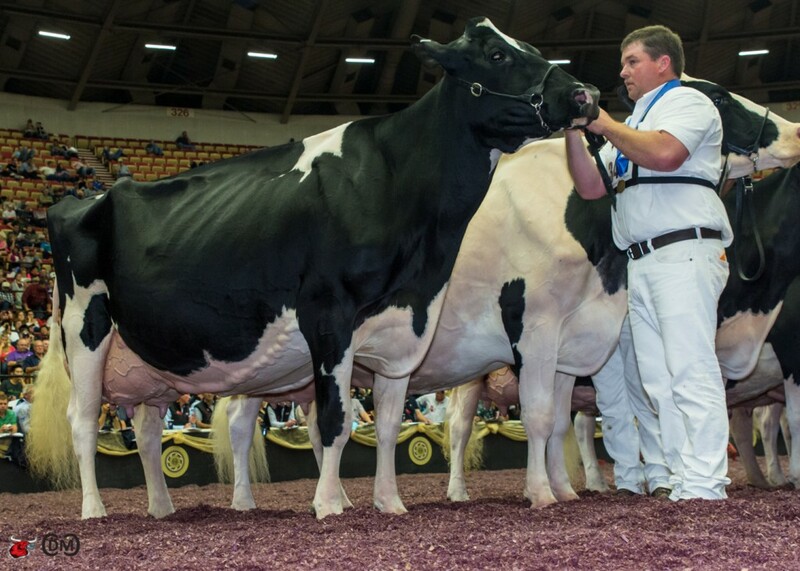 Braedale Goldwyn was named Premier Sire for the 2013 International Holstein Show, his sixth consecutive year of receiving this honor. 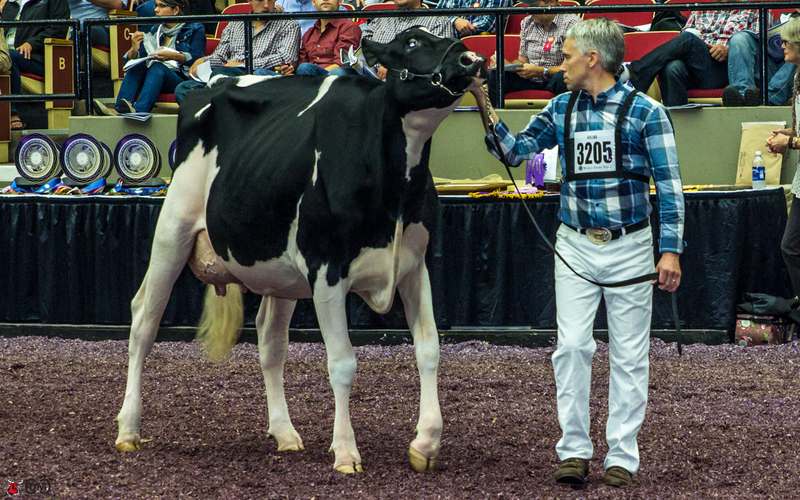 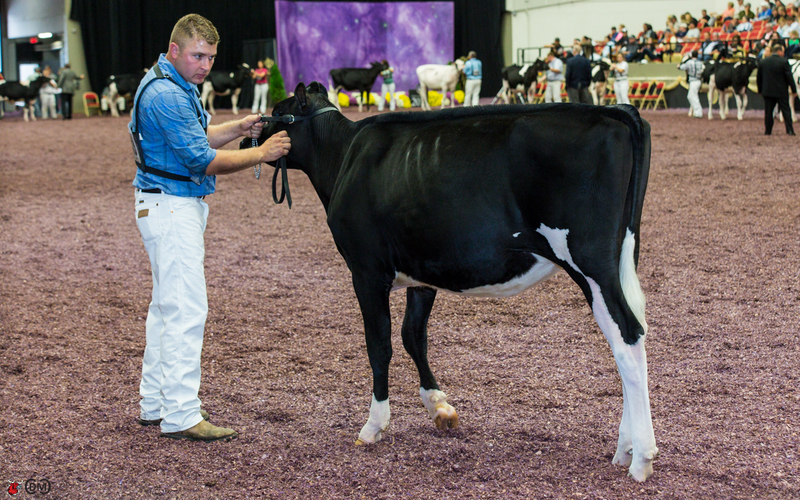 History was made in the 2013 International Red and White Show when Judge Michael Heath, named KHW Regiment Apple-3-Red-ETN, owned by Westcoast Holsteins of Chilliwack, British Columbia, the 2013 International Red & White Show Grand Champion. 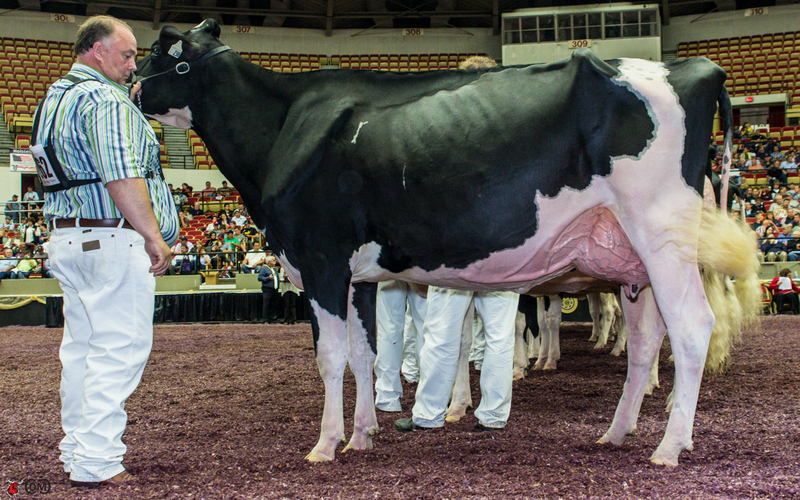 Apple-3-Red ETN was the third clone of Reserve Grand and Reserve Senior Grand Champion, KHW Regiment Apple-Red-ET, and the winning cow of the Four-Year-Old class – receiving the Udder Comfort $1,000 Grand Champion Cash Award. 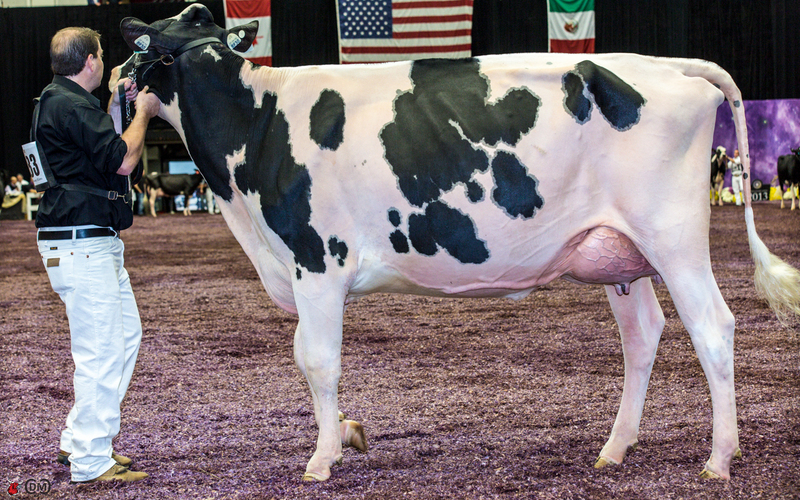 She was not only the original Apple-Red, but was also the dam of the Honorable Mention cow. 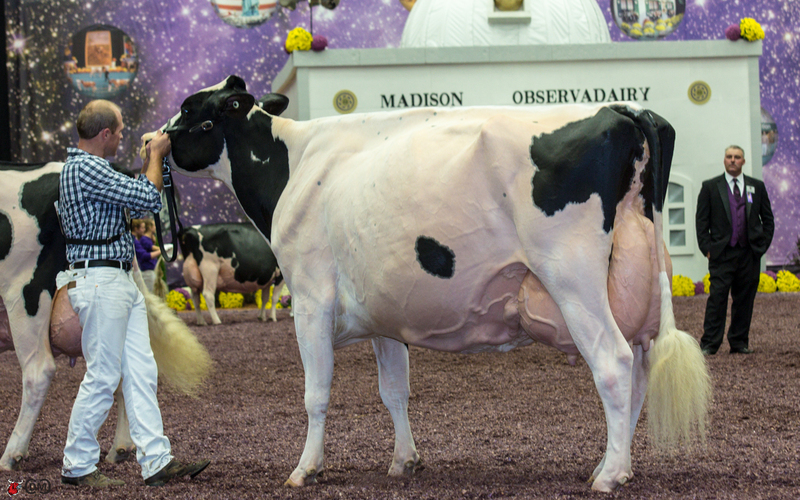 Standing out above the others, she took home the blue ribbon in 125,000 lbs. 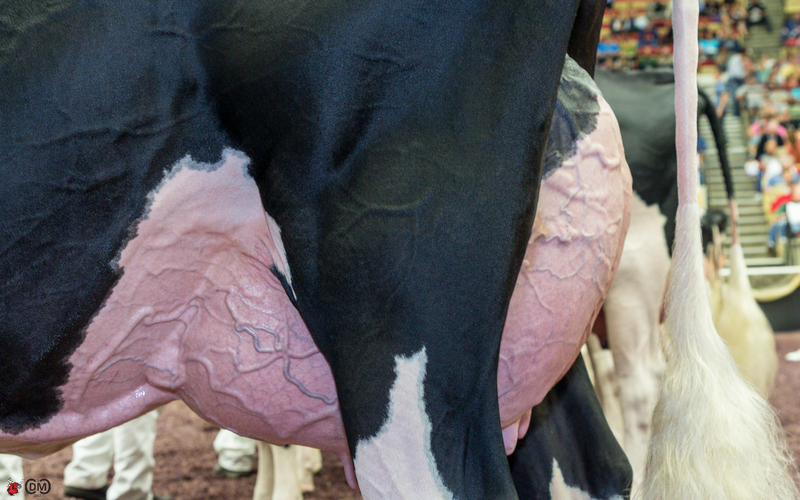 Cow Class. 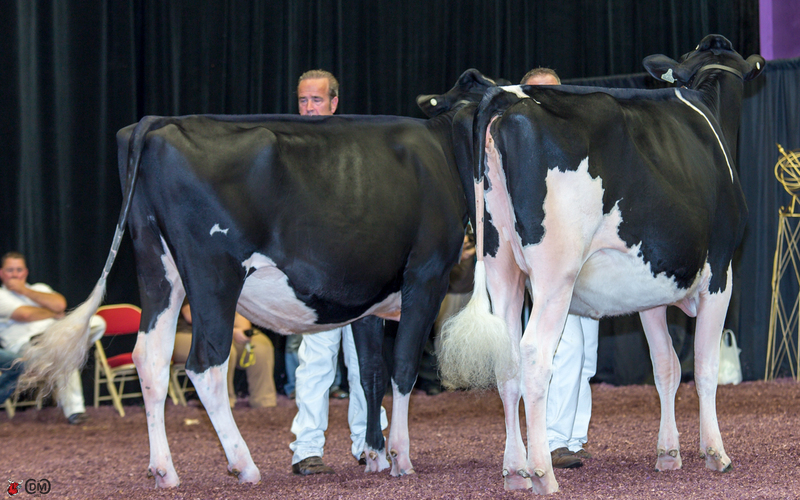 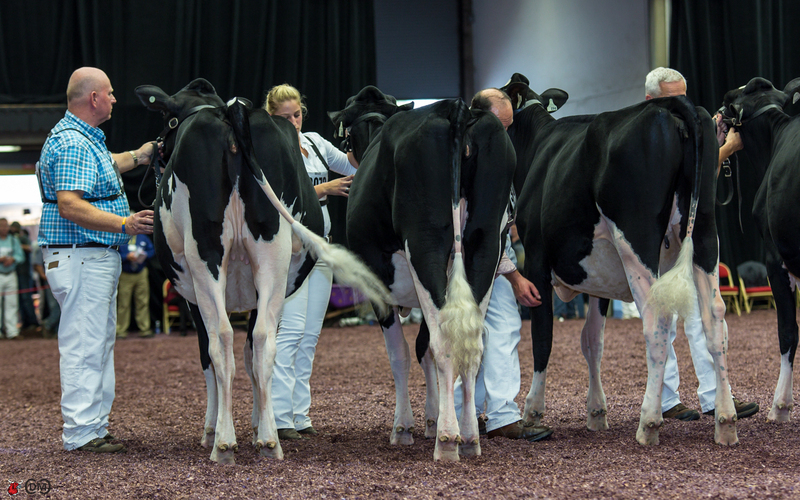 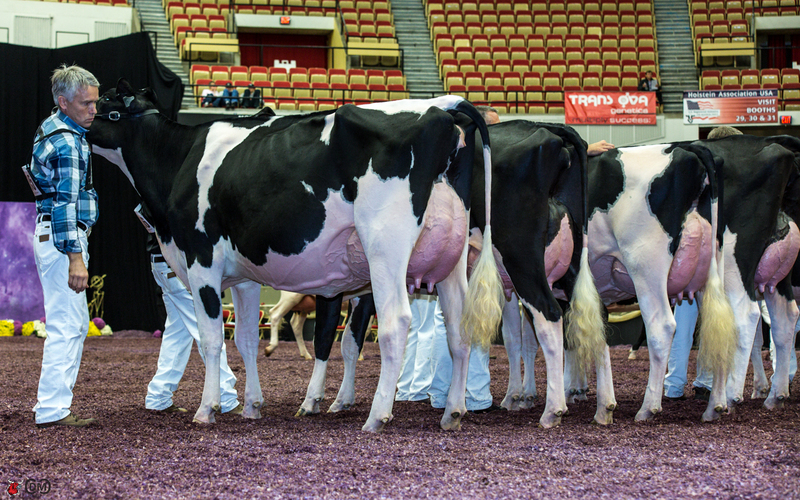 History was made this year at the International Red & White Show as all three champions hailed from the same cow, KHW Regiment Apple-Red-ET. 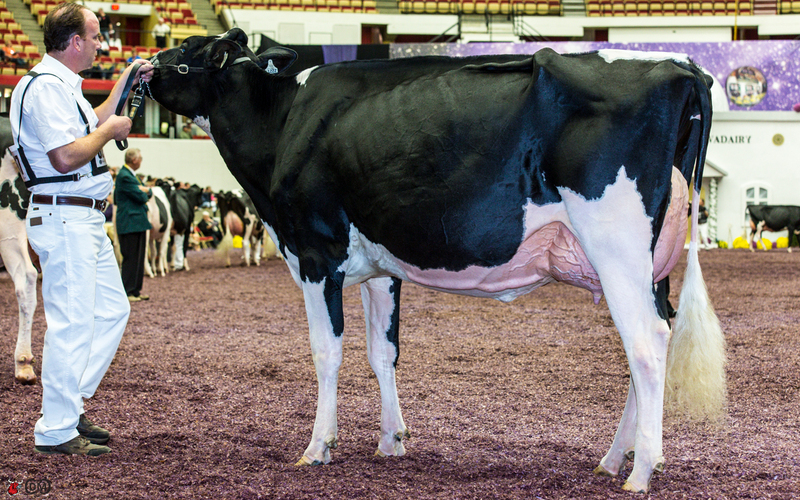 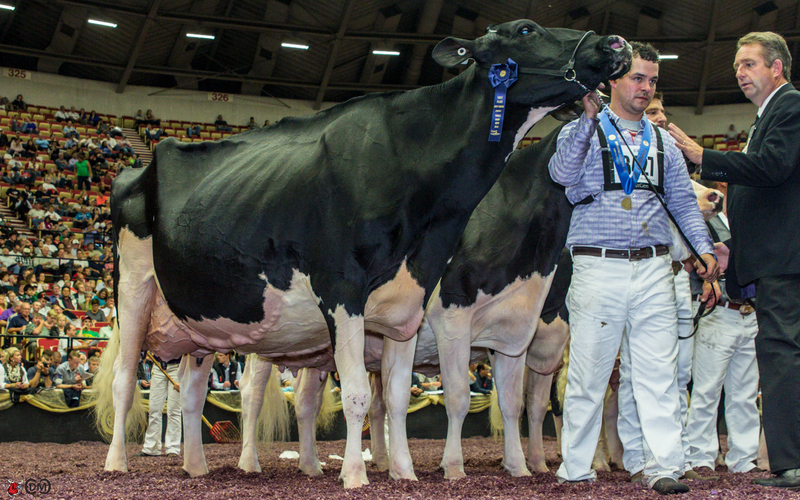 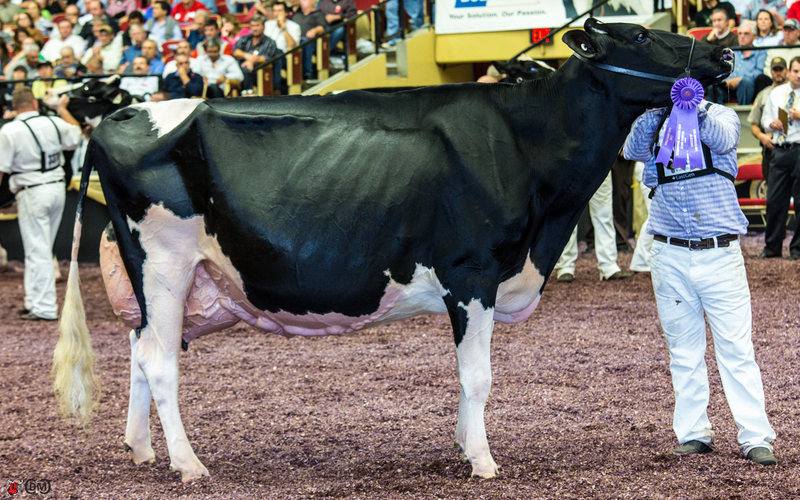 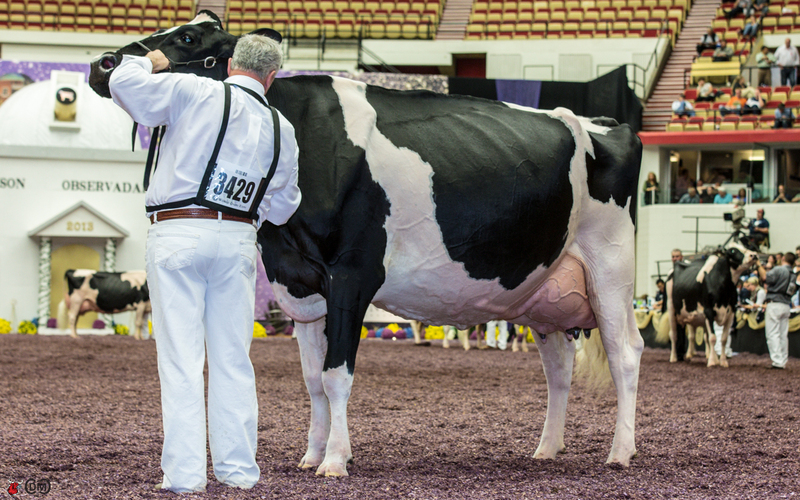 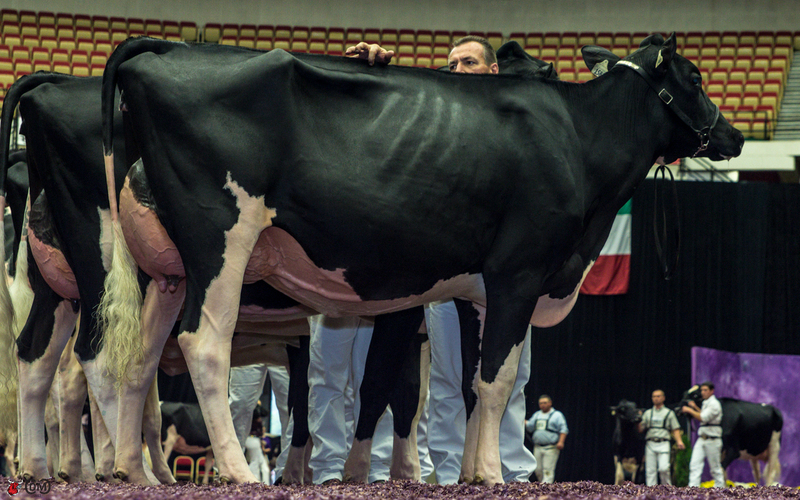 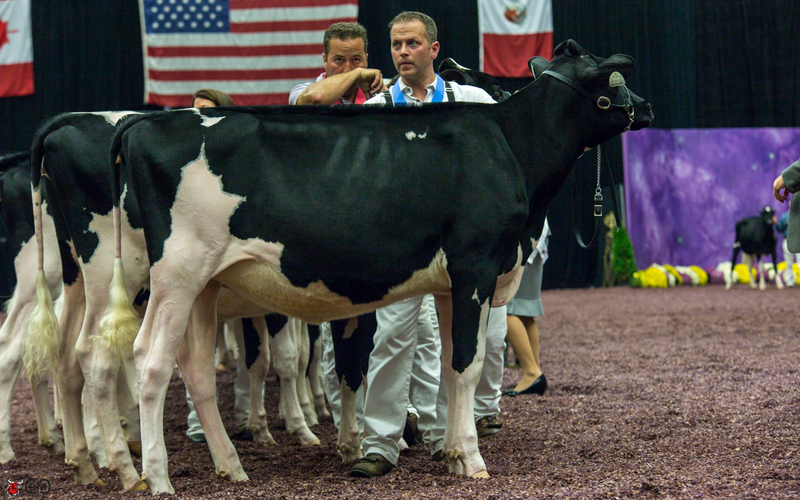 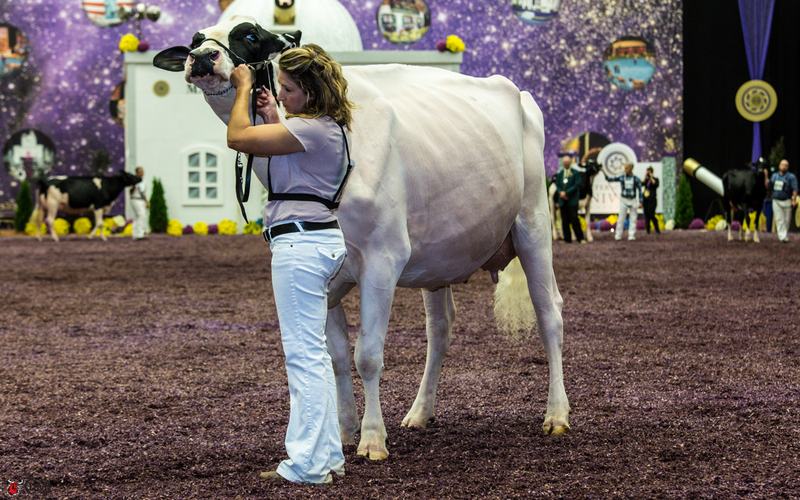 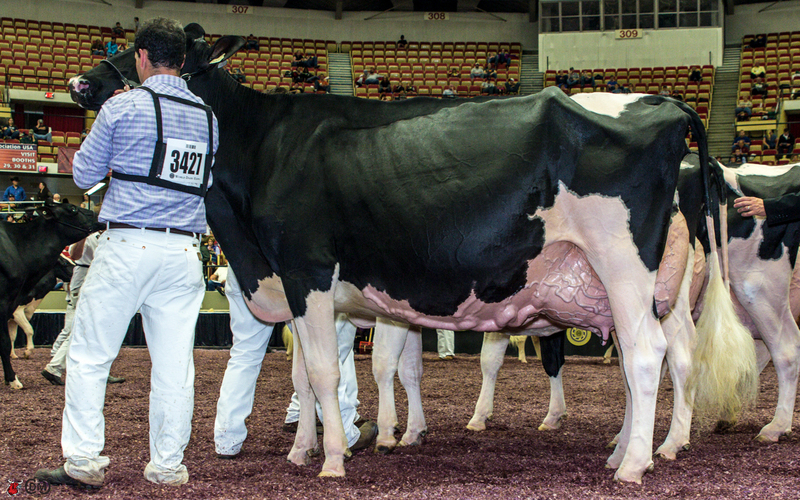 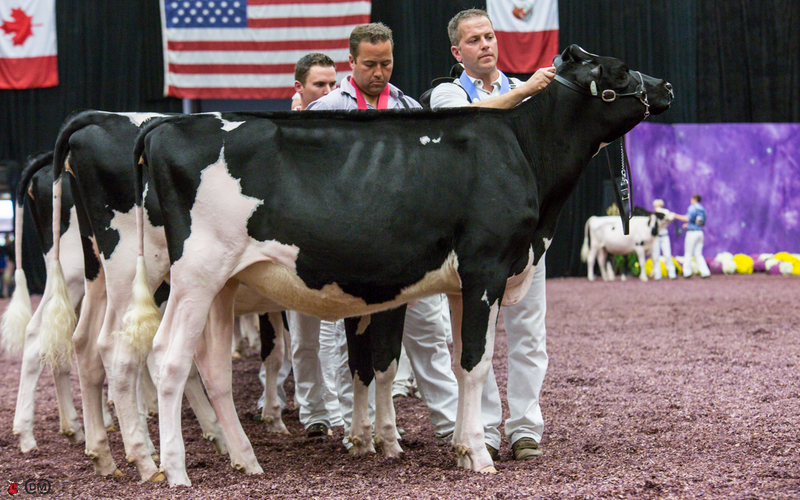 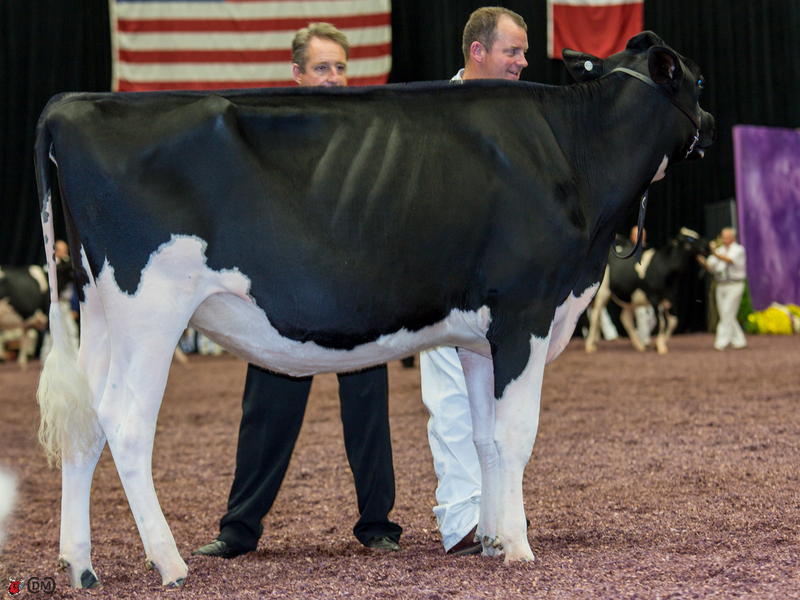 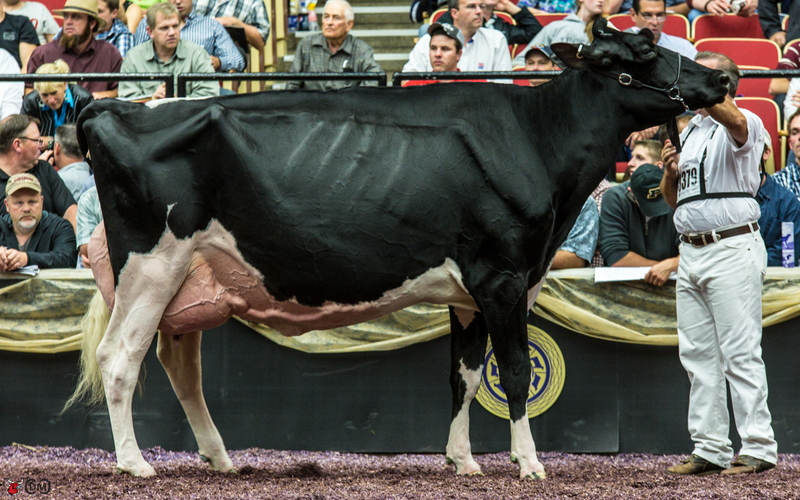 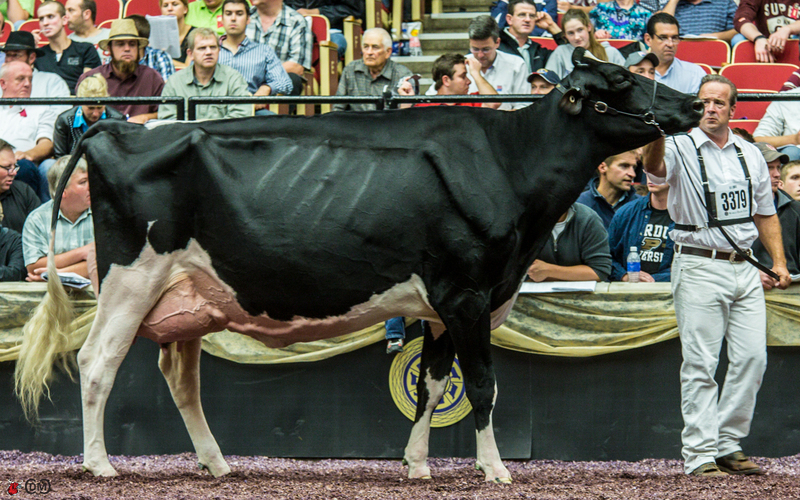 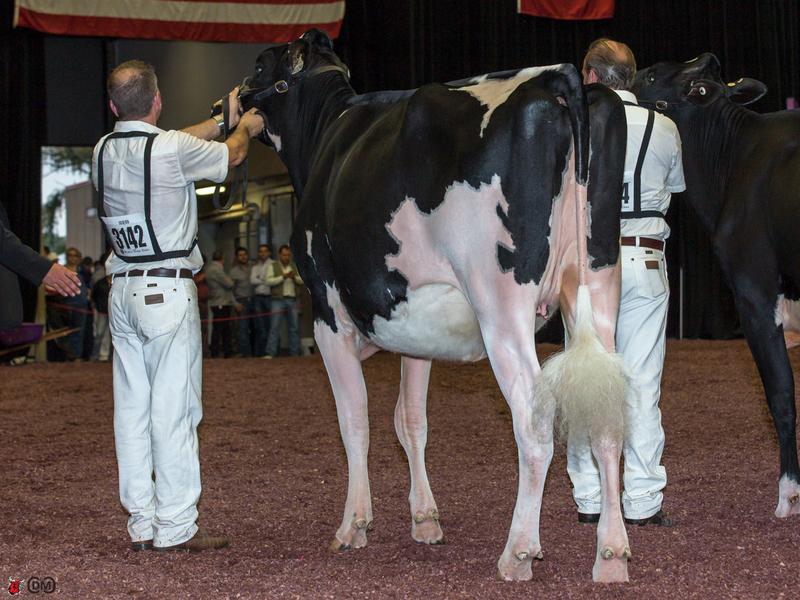 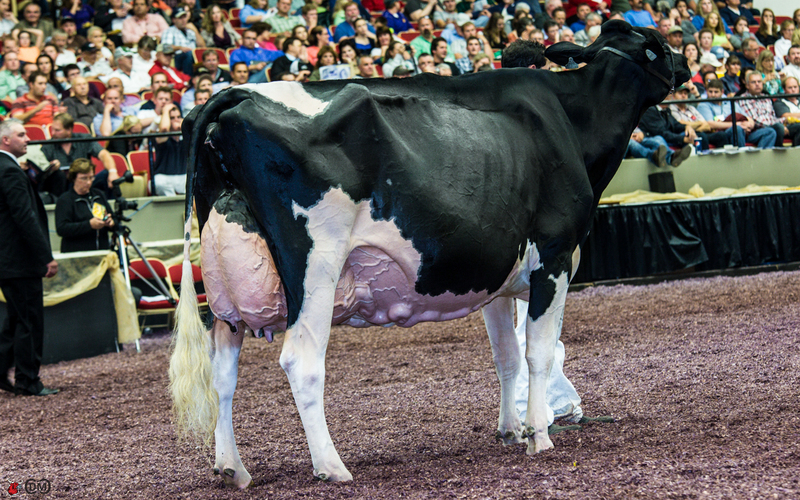 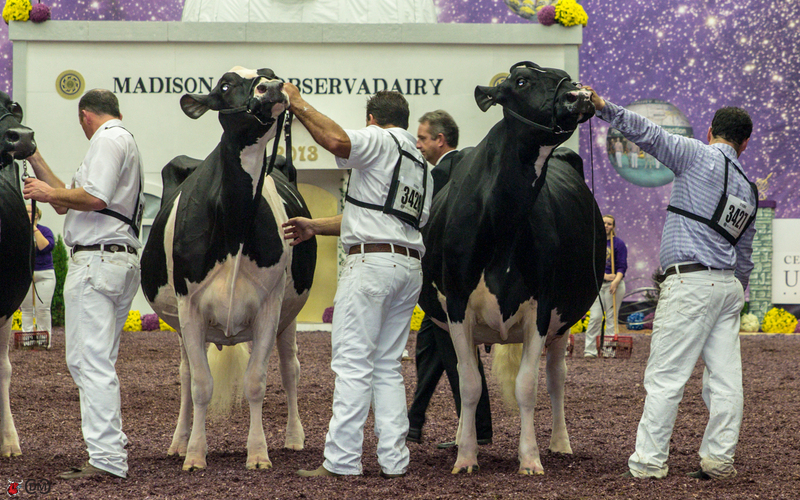 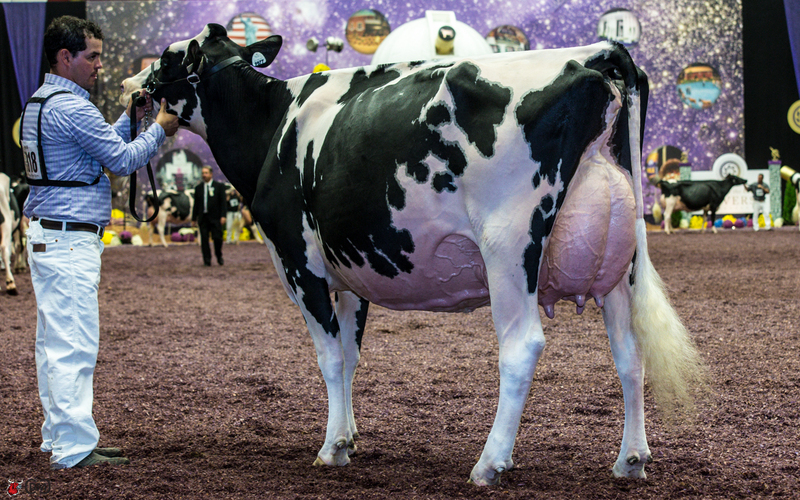 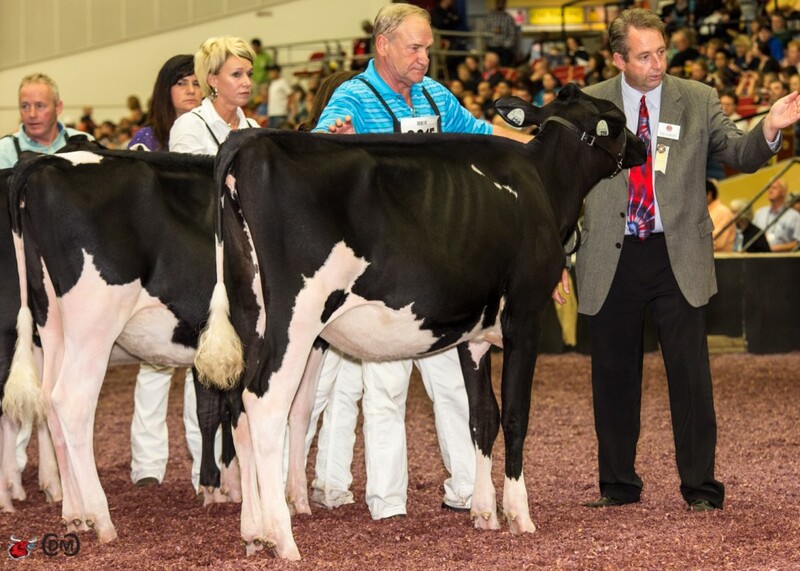 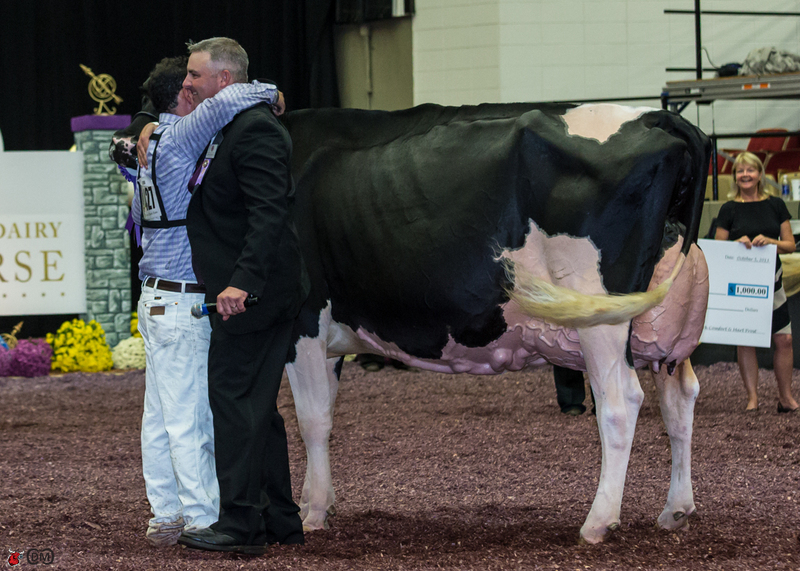 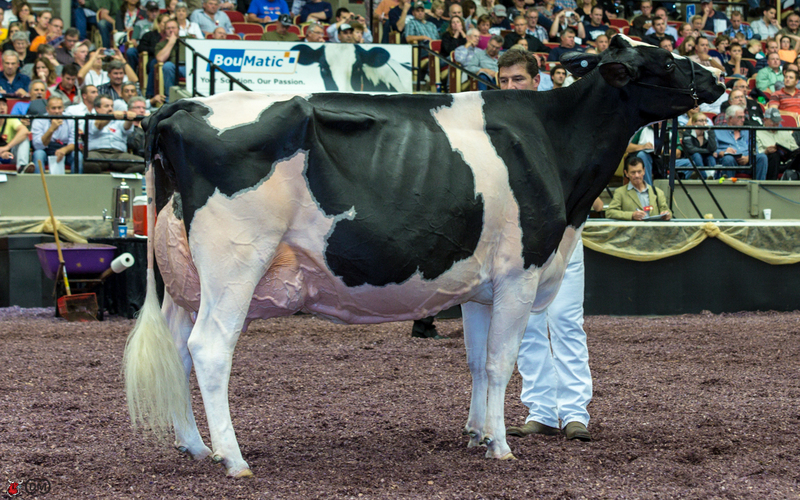 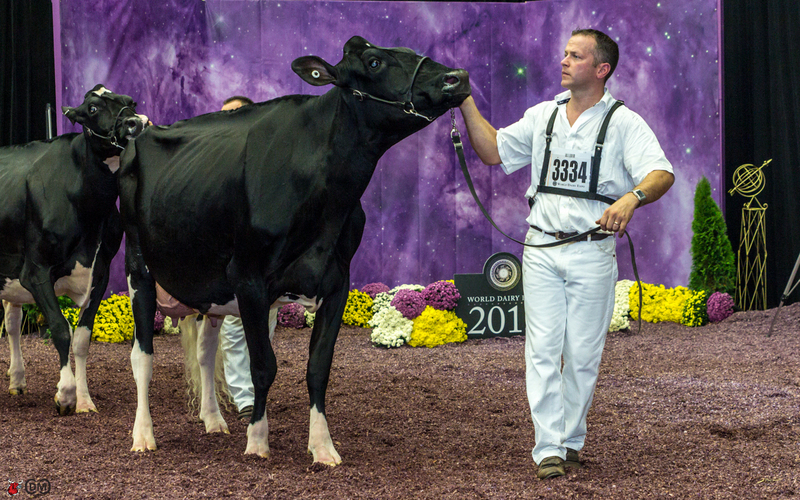 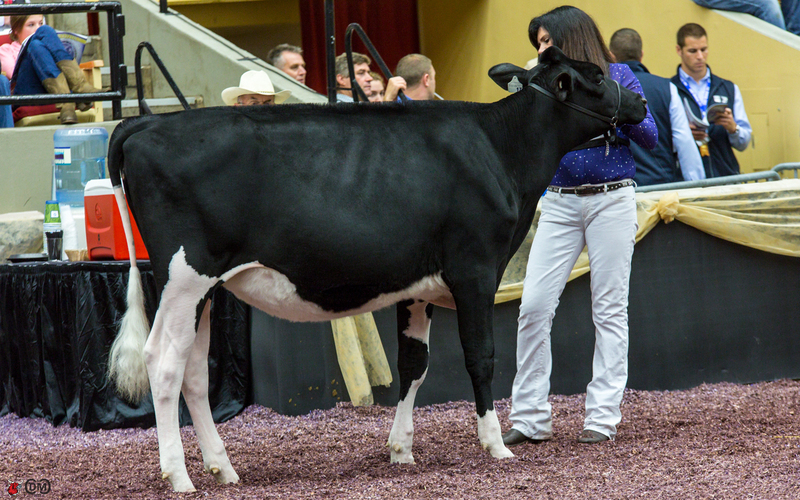 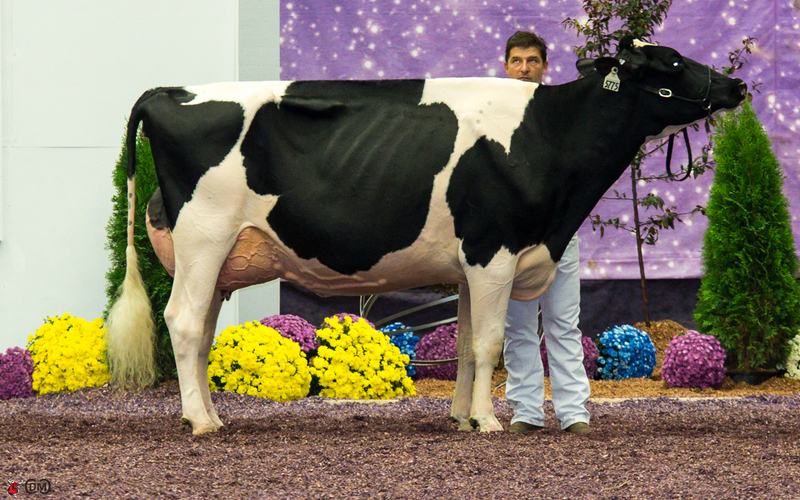 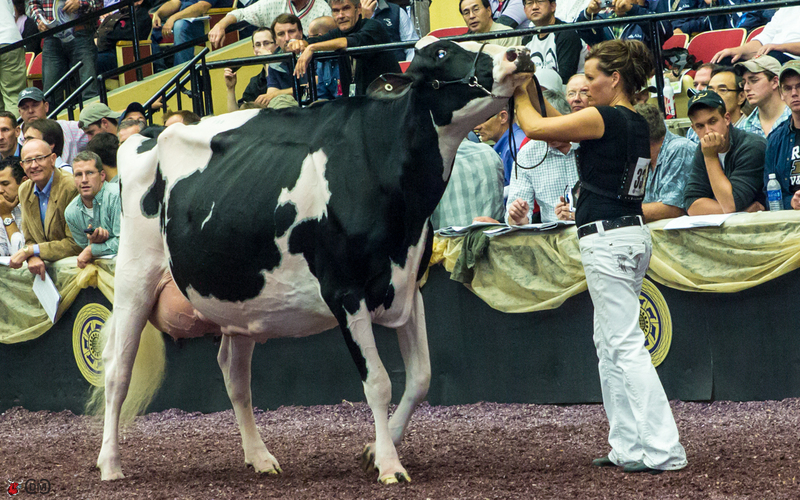 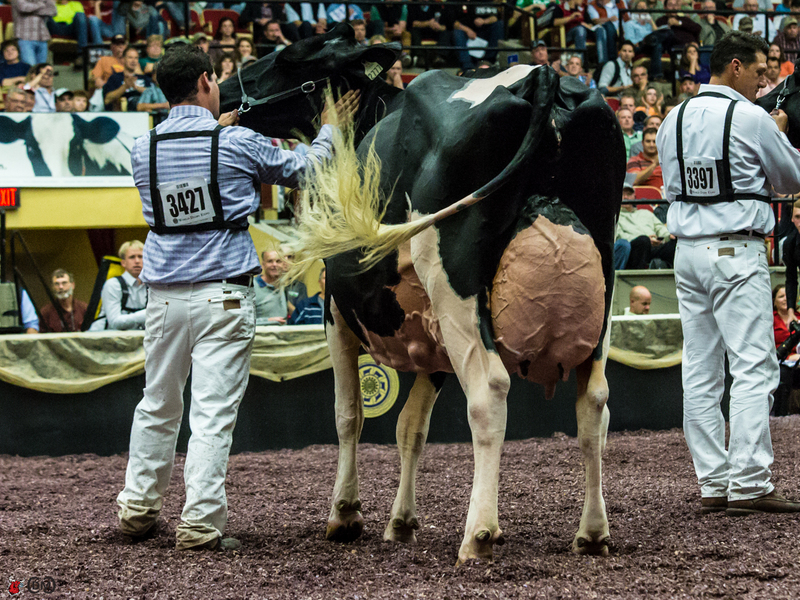 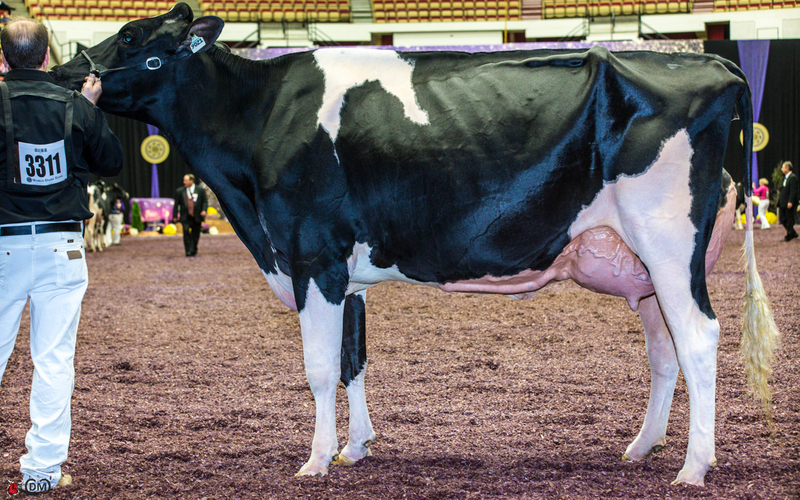 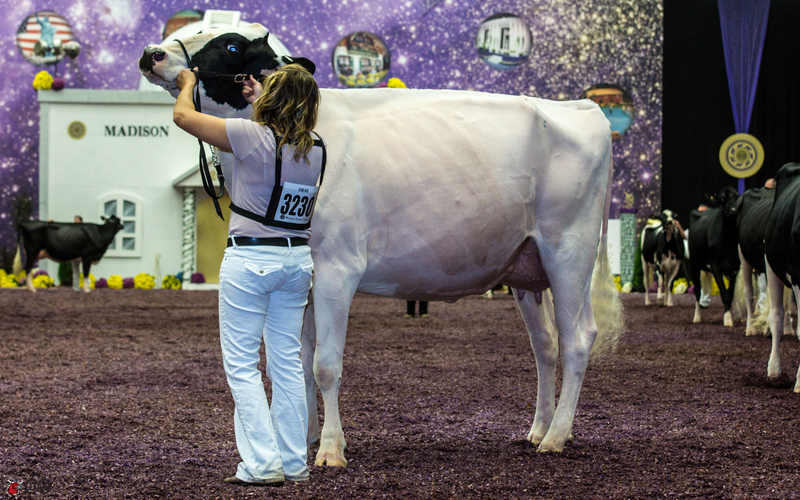 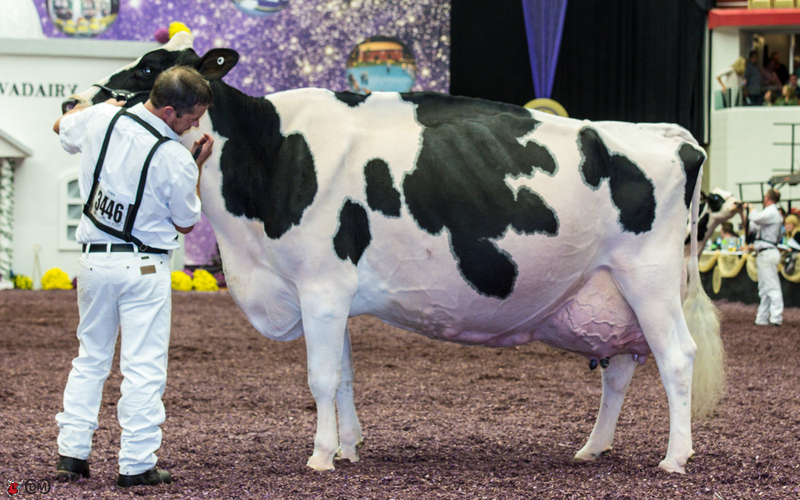 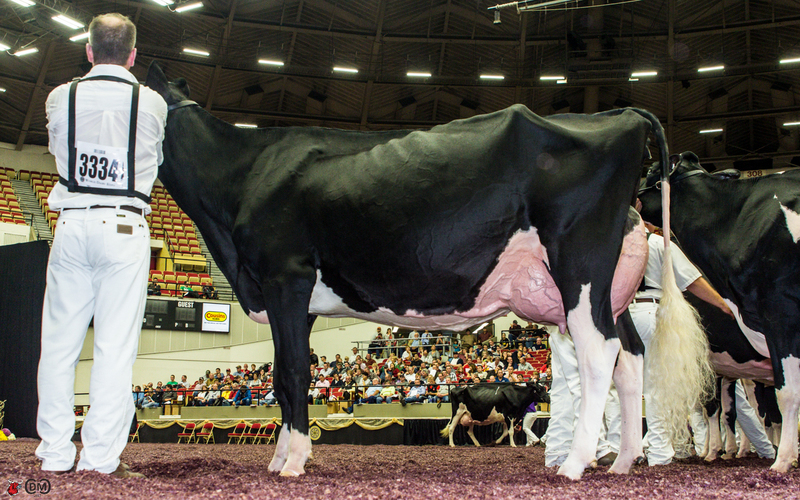 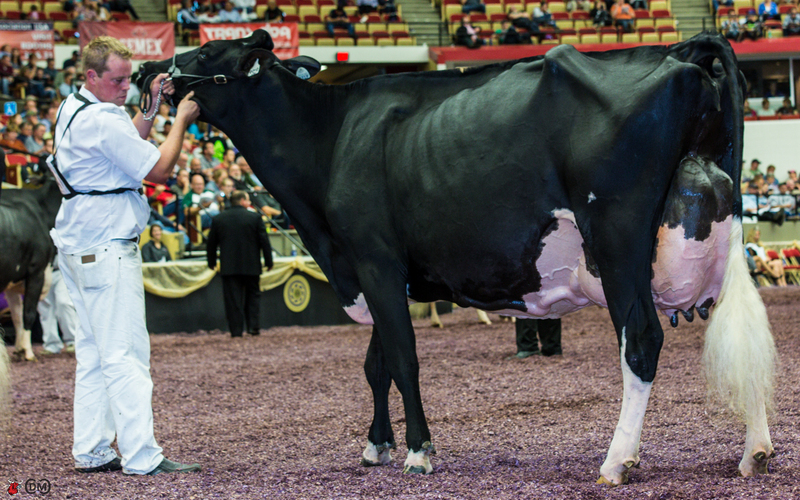 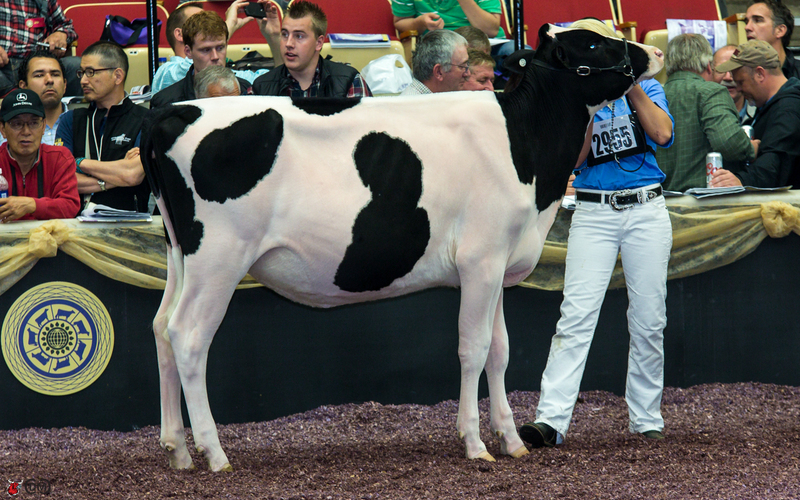 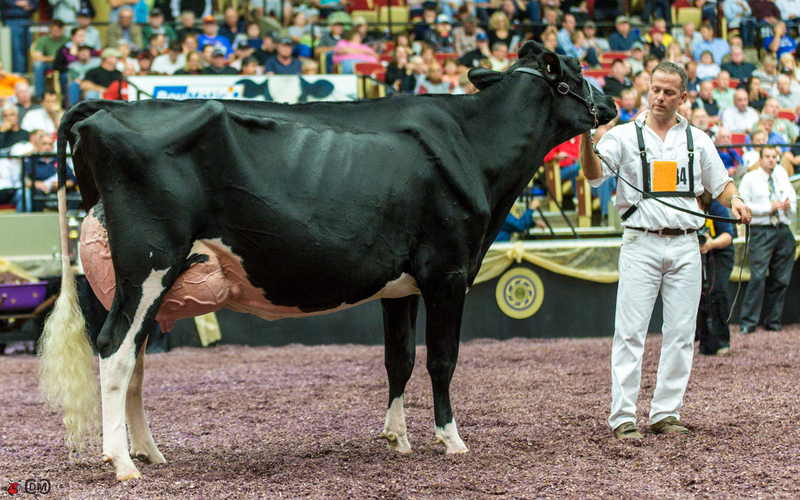 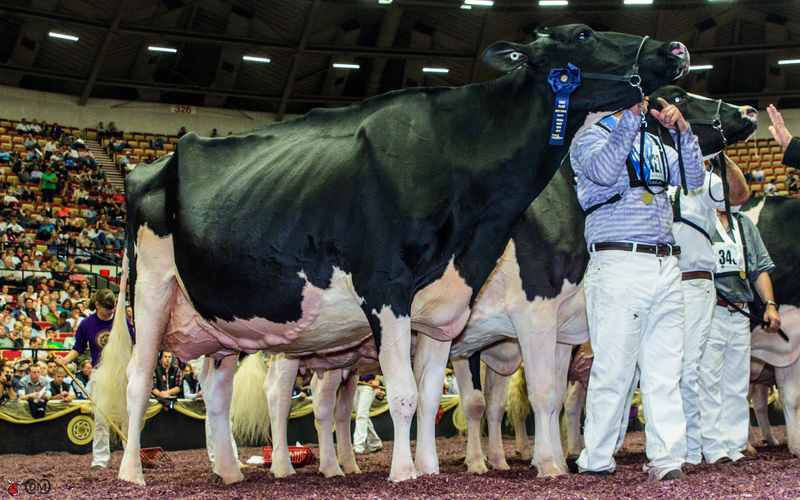 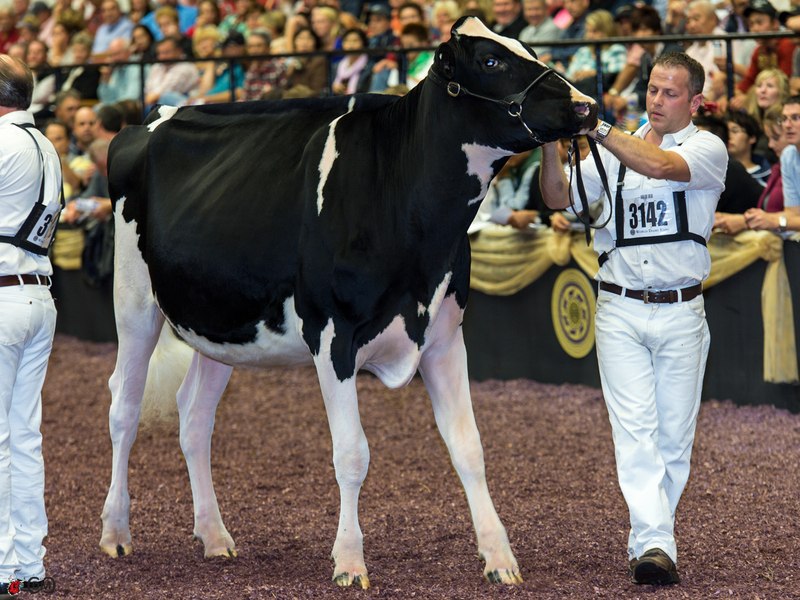 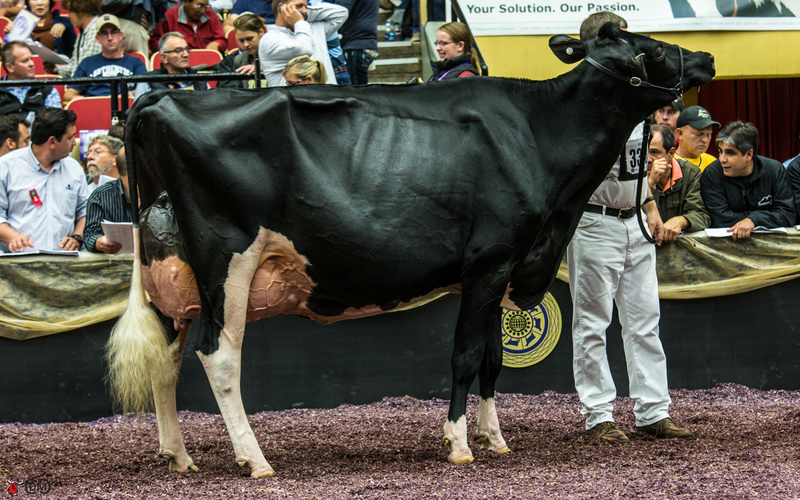 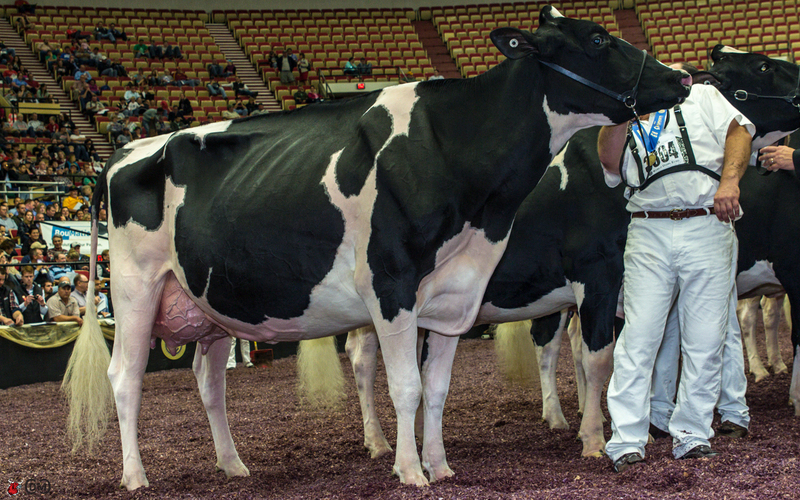 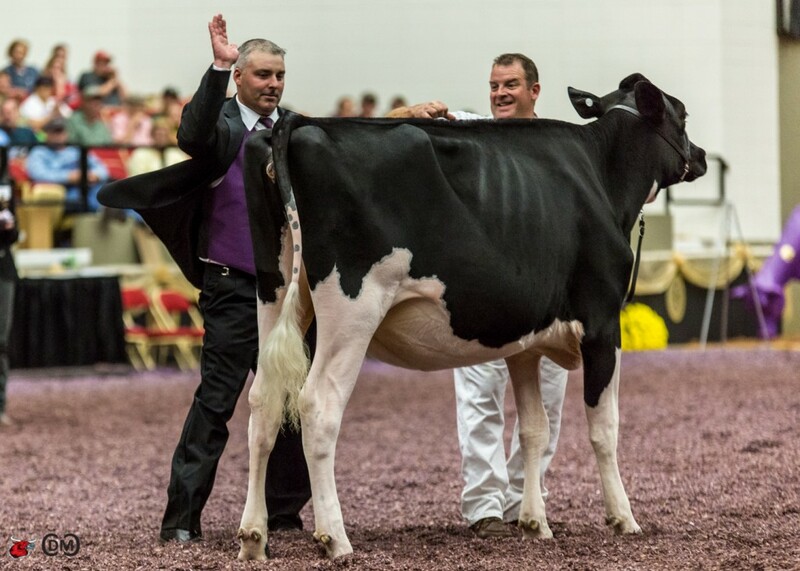 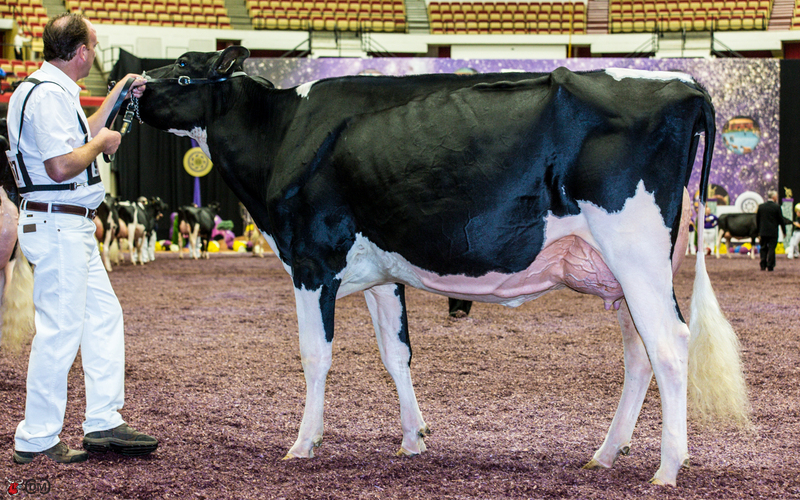 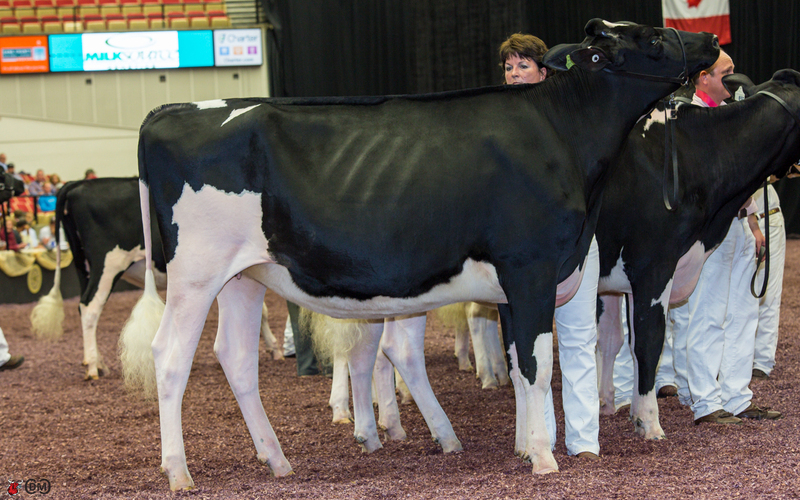 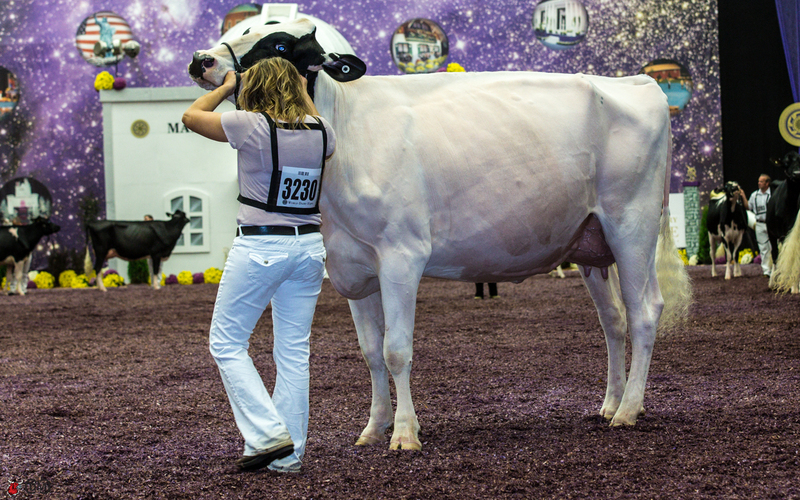 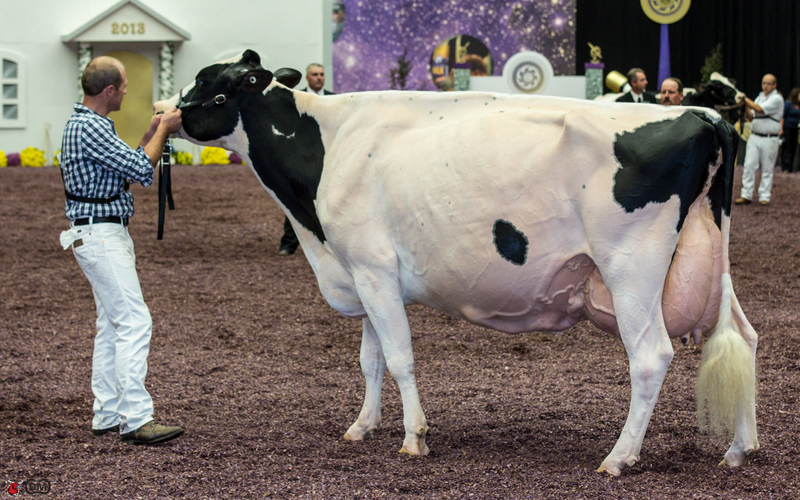 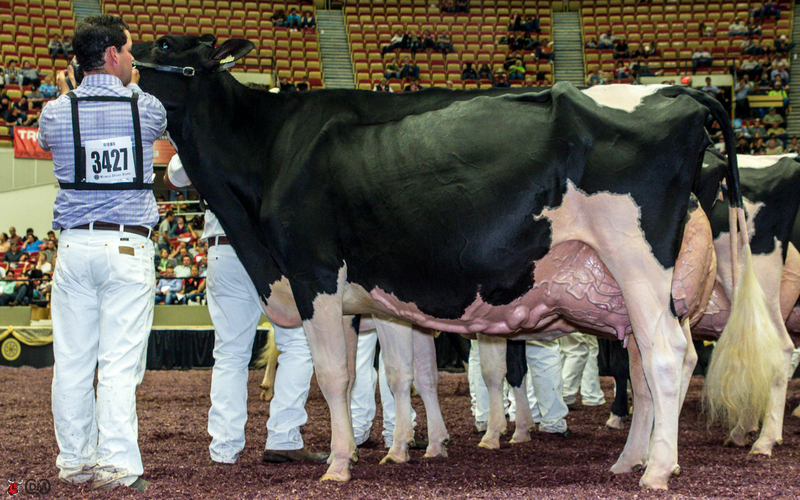 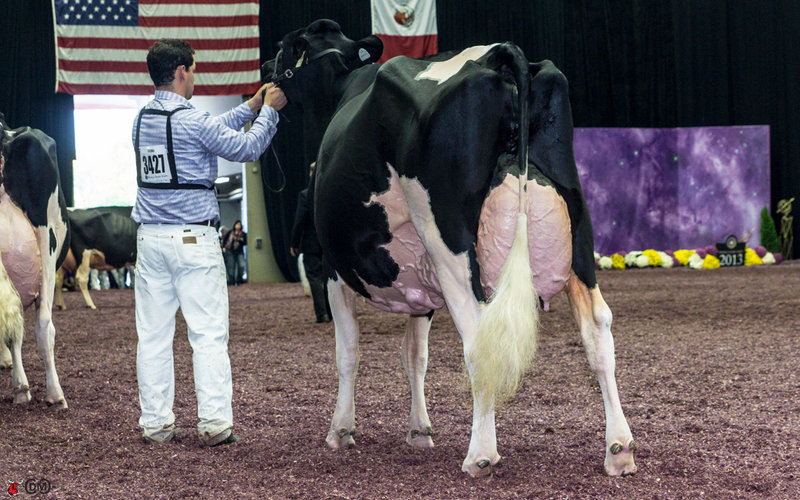 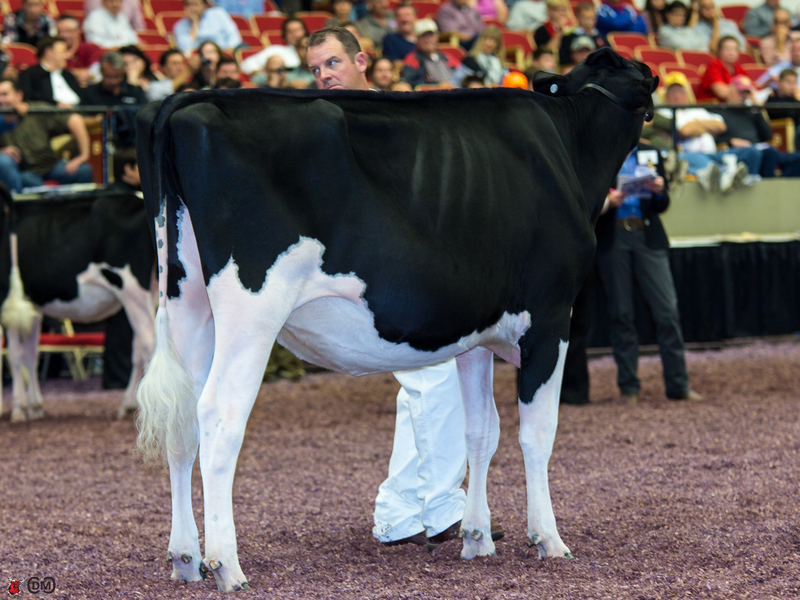 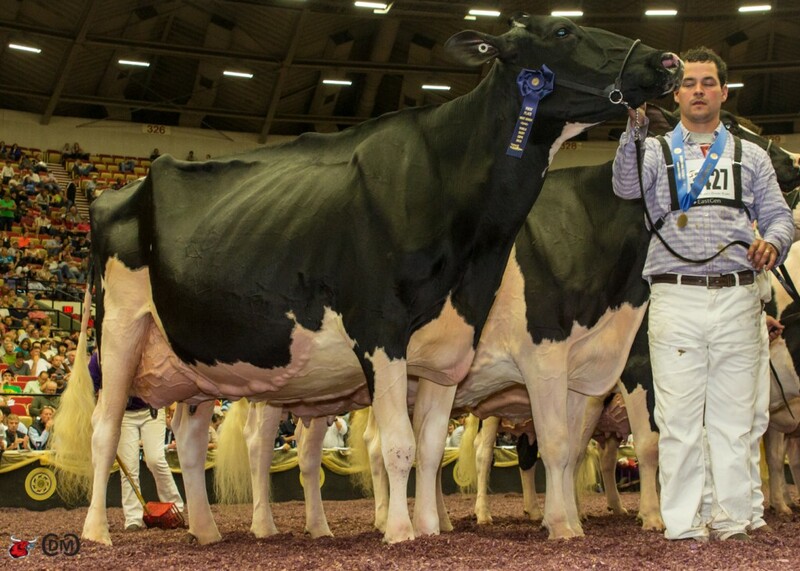 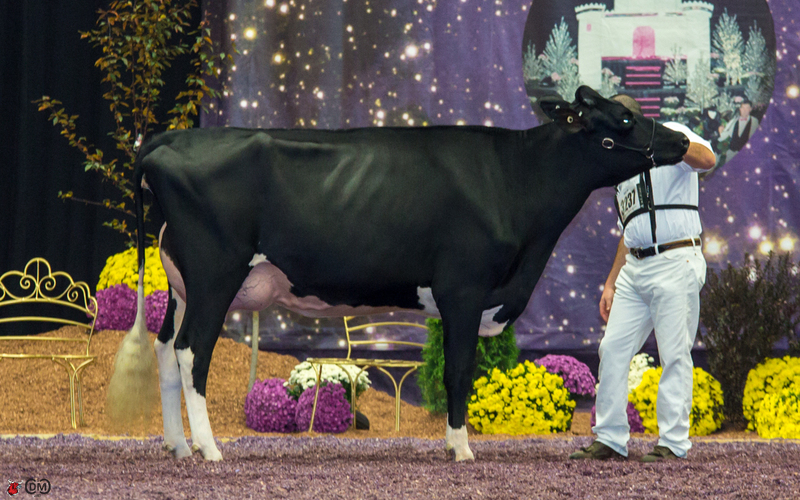 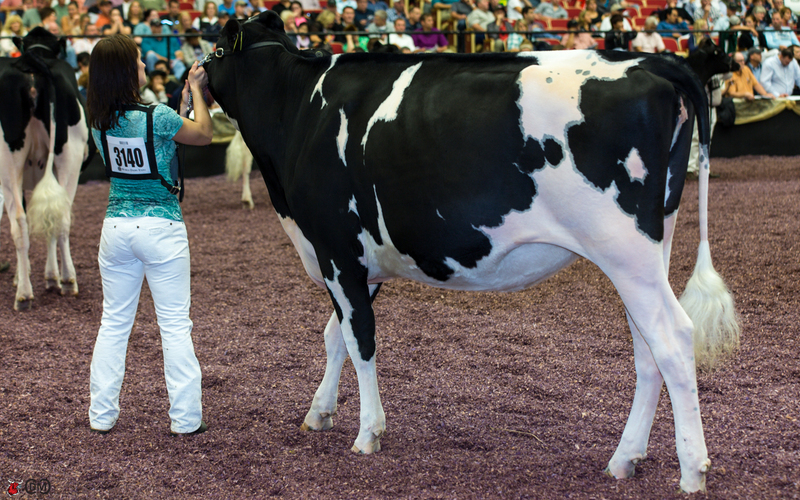 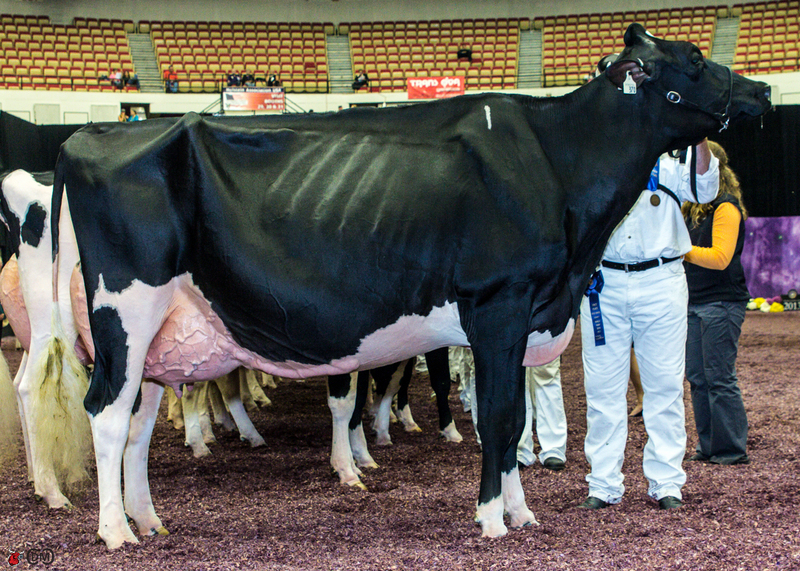 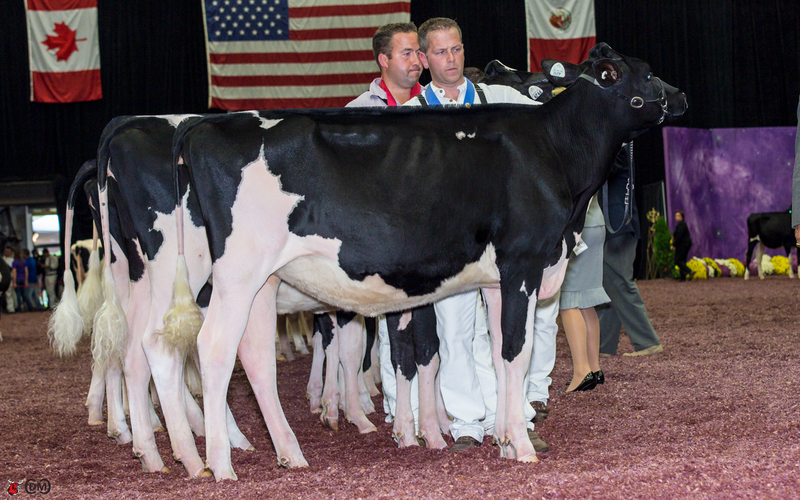 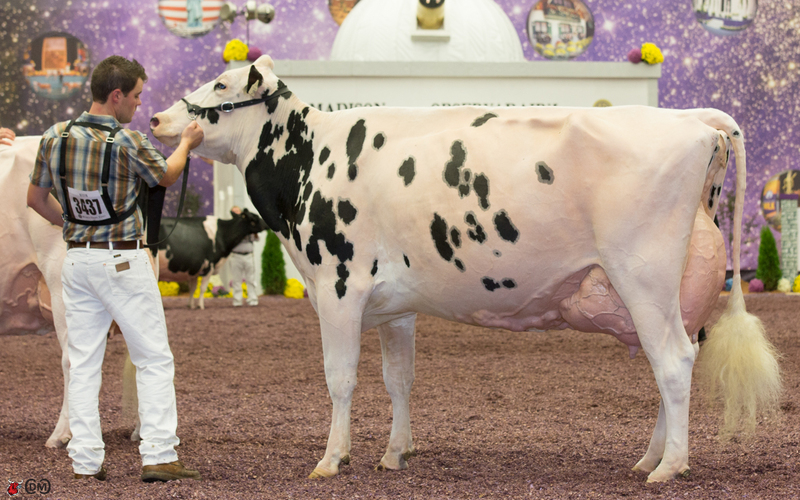 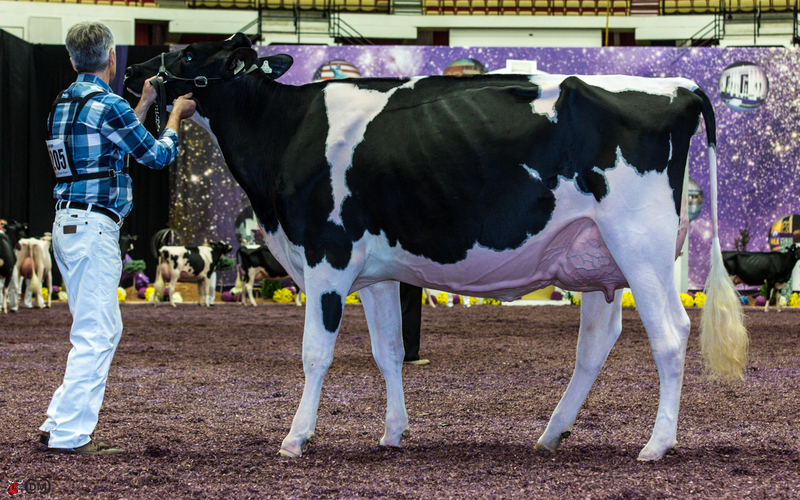 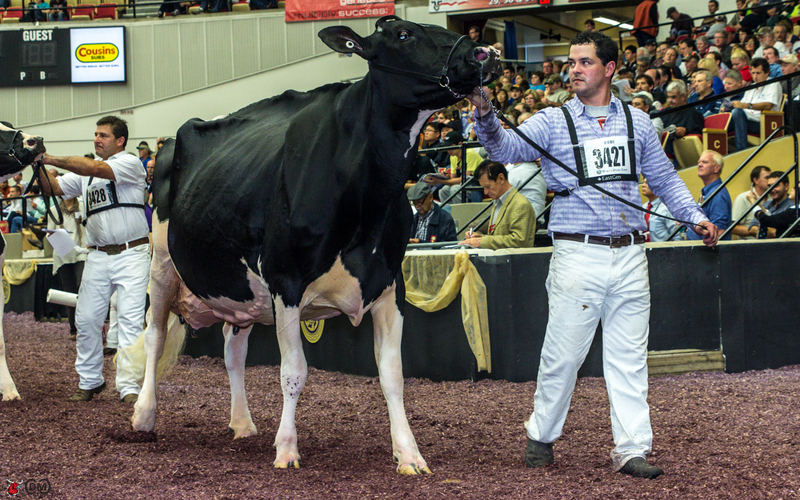 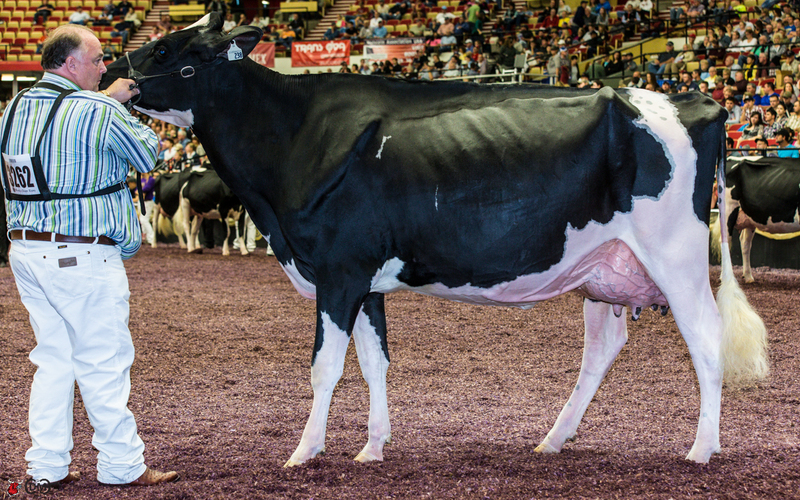 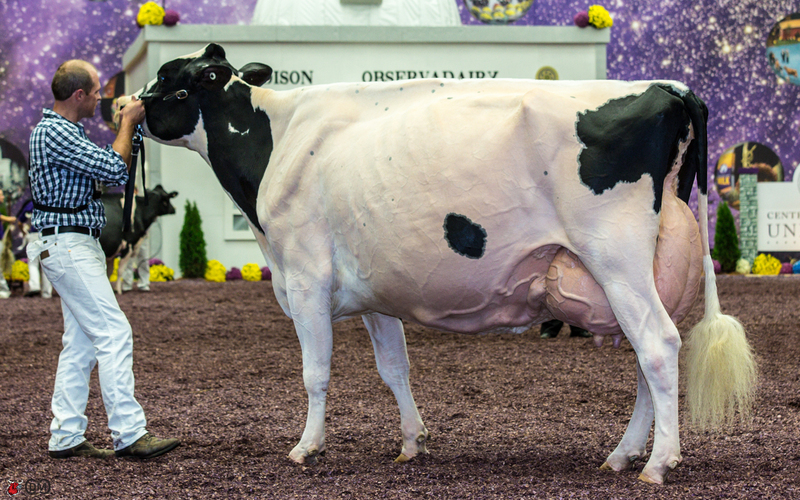 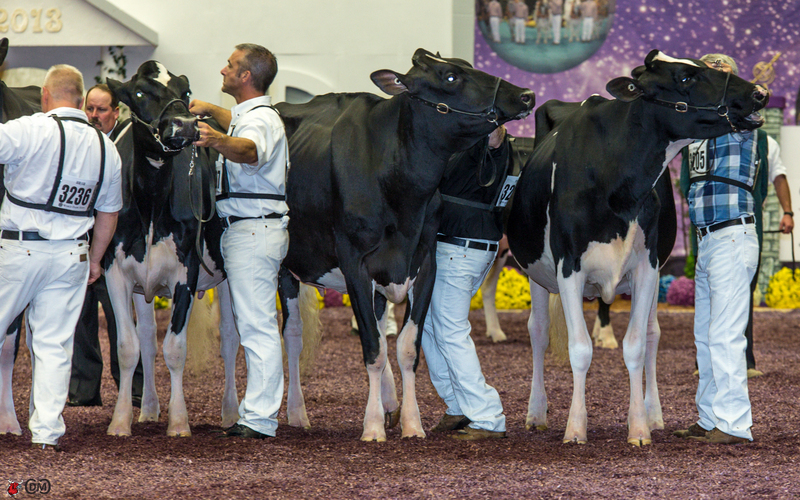 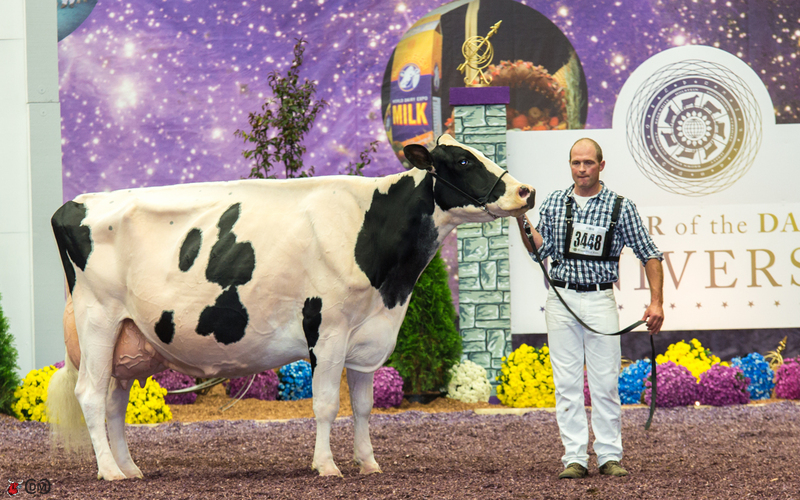 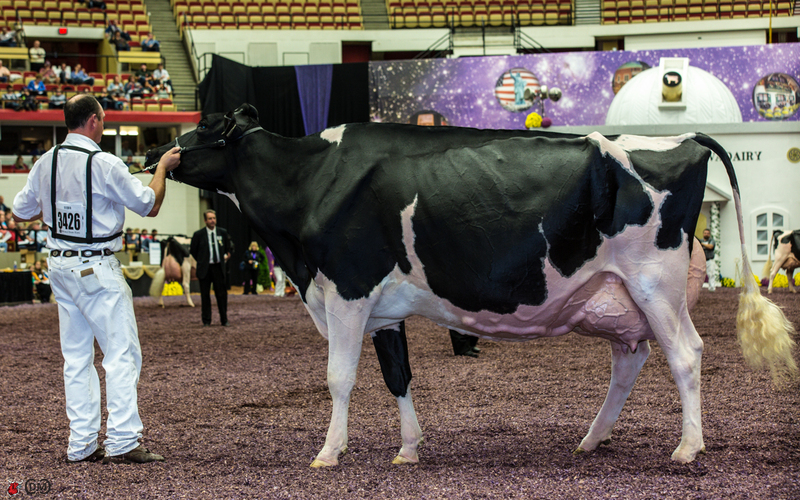 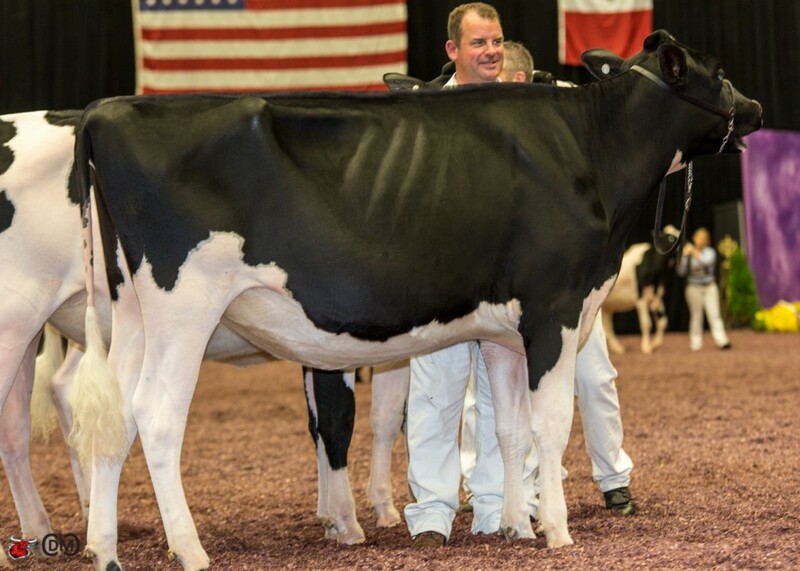 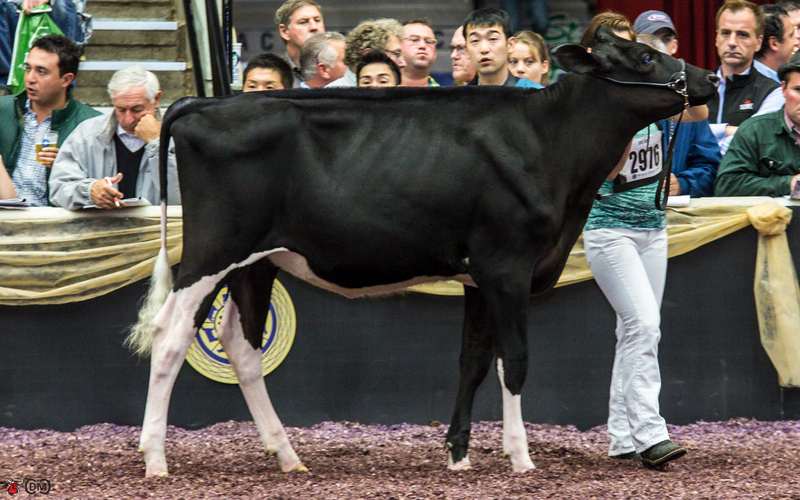 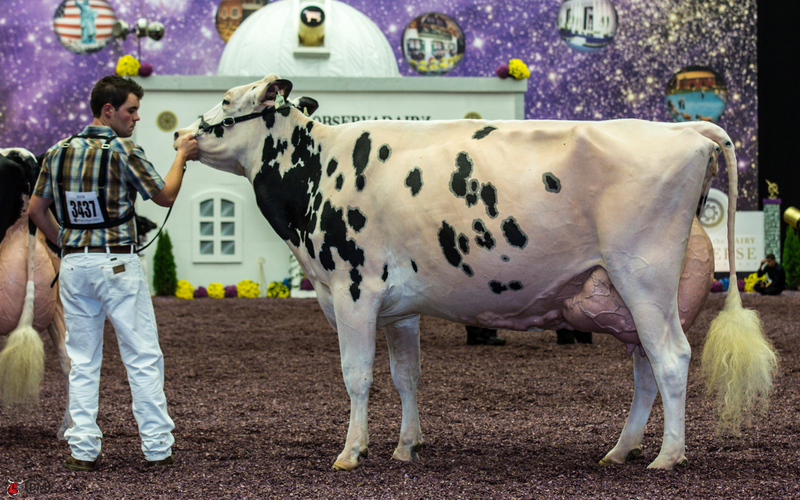 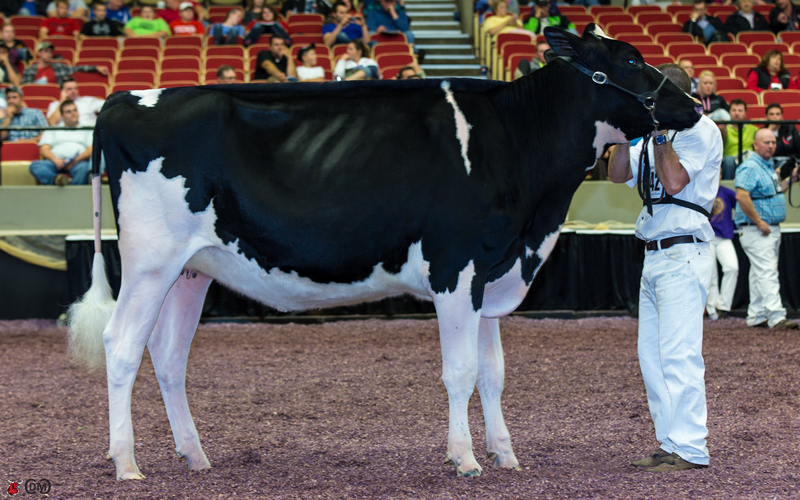 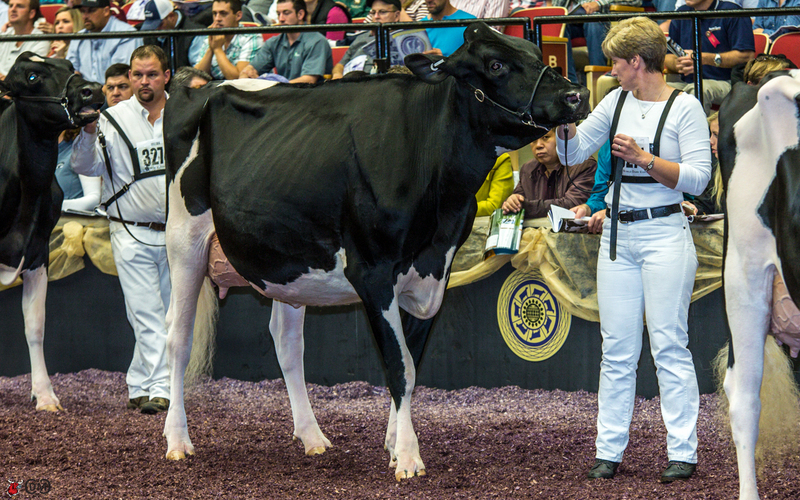 The 2013 World Dairy Expo culminated with the Supreme Champion Ceremony where Bonaccueil Maya Goldwyn, received the top honor. 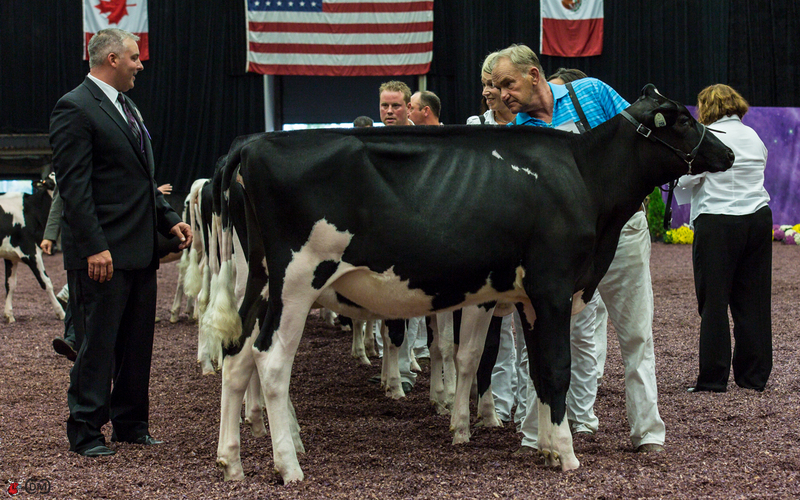 KHW Regiment Apple-3-ETN, took home the honor of Reserve Supreme Champion for 2013.